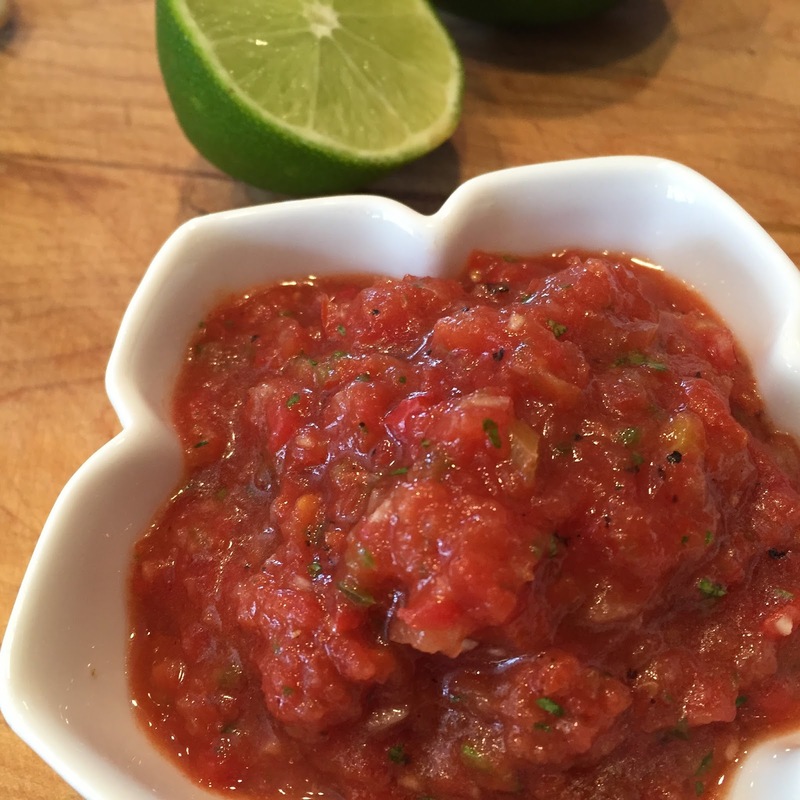 You can make this salsa anytime! 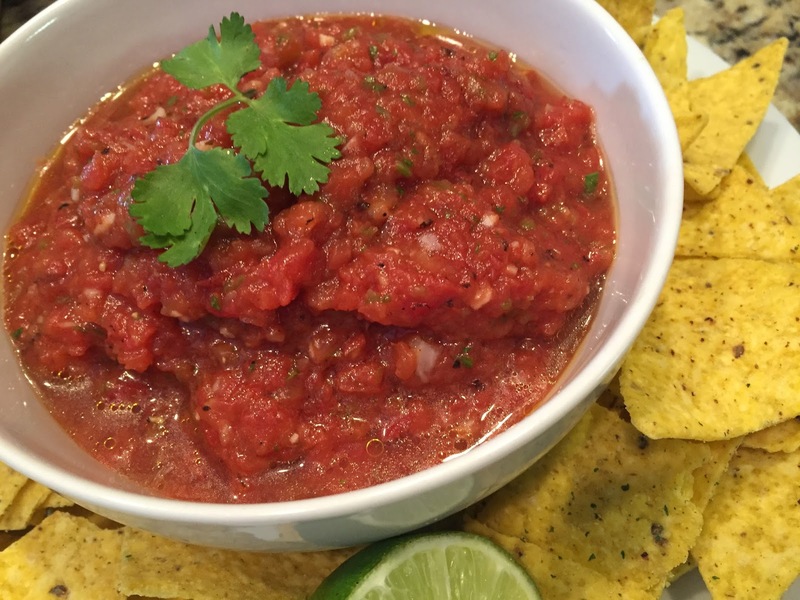 It is a simple salsa made with canned fire roasted tomatoes and a few other ingredients. 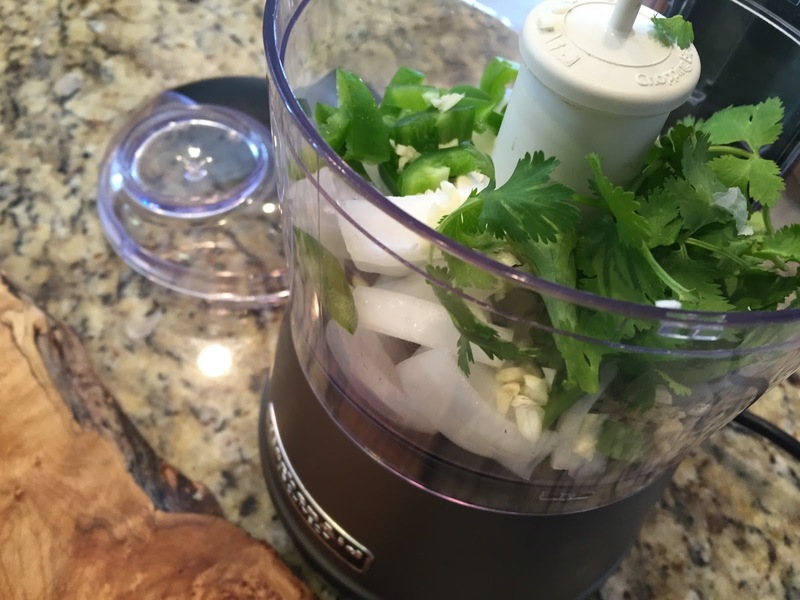 Get out the food processor and in a few minutes you are done! 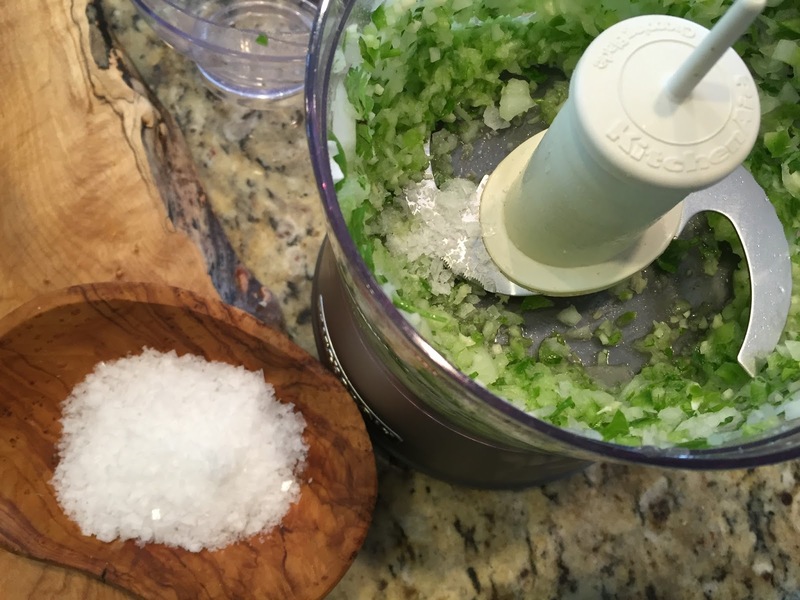 salt and pepper to taste – it needs more salt than you think- so taste! 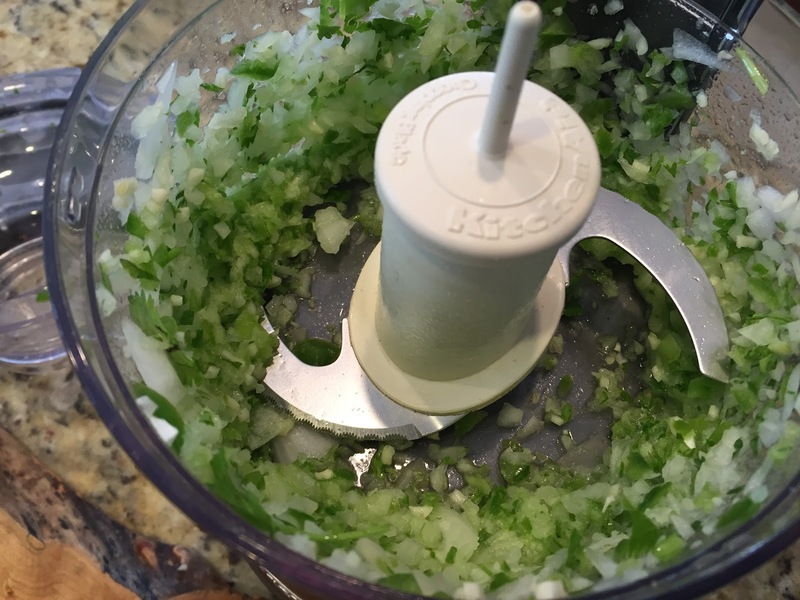 Step 1: I add the jalapenos, onion, garlic and cilantro to the food processor first. I do chop most things at least a bit before adding it to the machine. Chop. 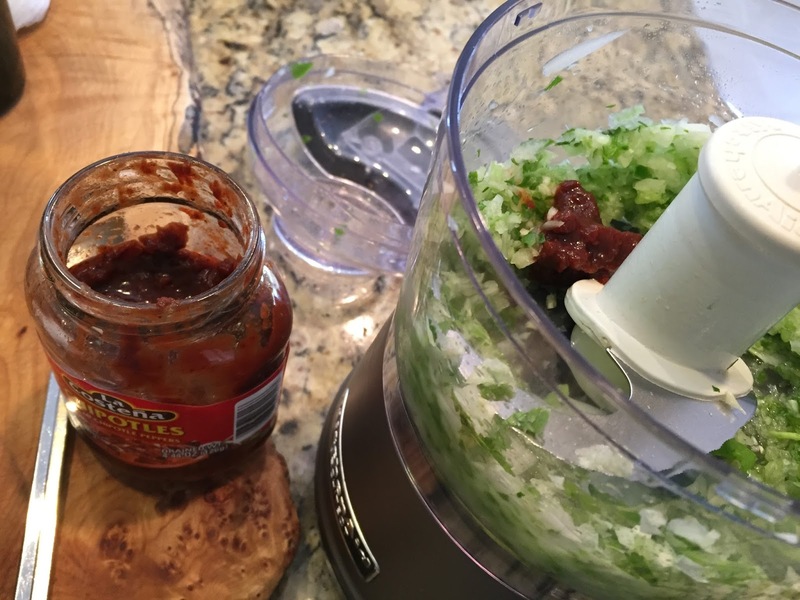 Step 2: add the salt and chipotles (you can buy them in a can or a jar typically) they are very hot so start with less and add more if you like. 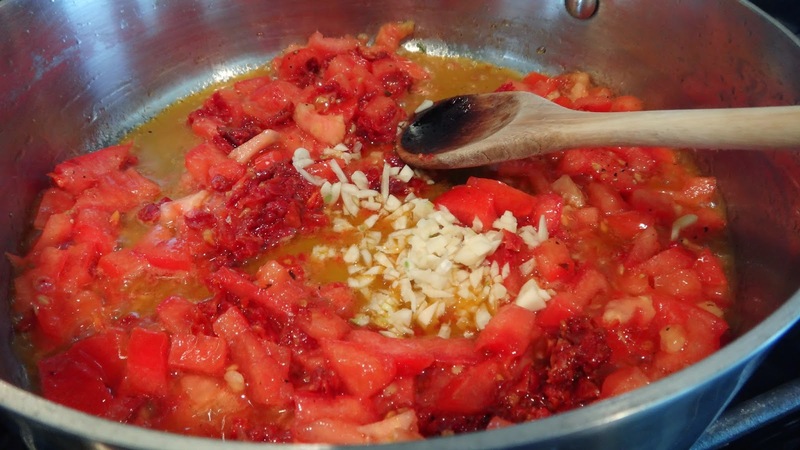 Step 3: add the lime juice, olive oil, and finally the tomatoes. Taste and adjust the salt and pepper as necessary. I also like mine with lots of lime. Serve in a pretty bowl and get the Tequila baby!! 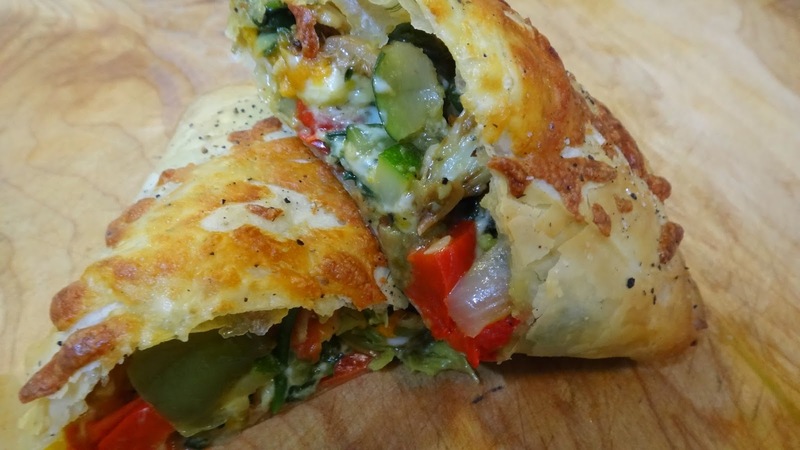 This is a great way to use up all those bits of vegetables and small pieces of cheese you have in the fridge and is a nice main for a Meatless Monday. 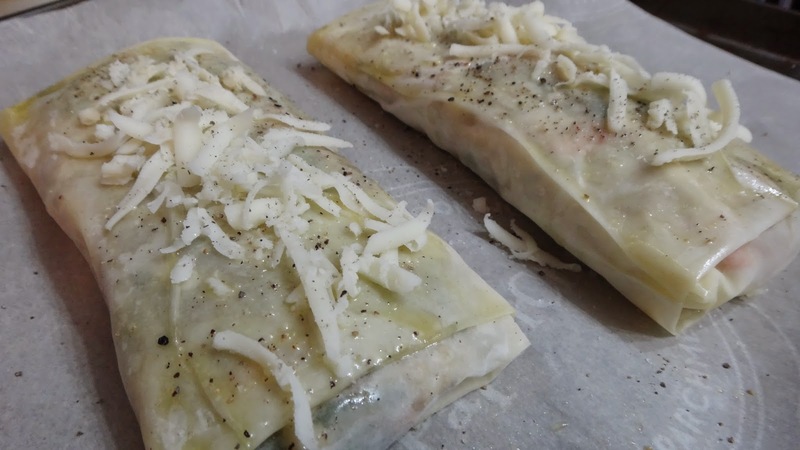 Roast a medley of vegetables that you can toss with your favorite cheese and wrap in some Phyllo pastry. 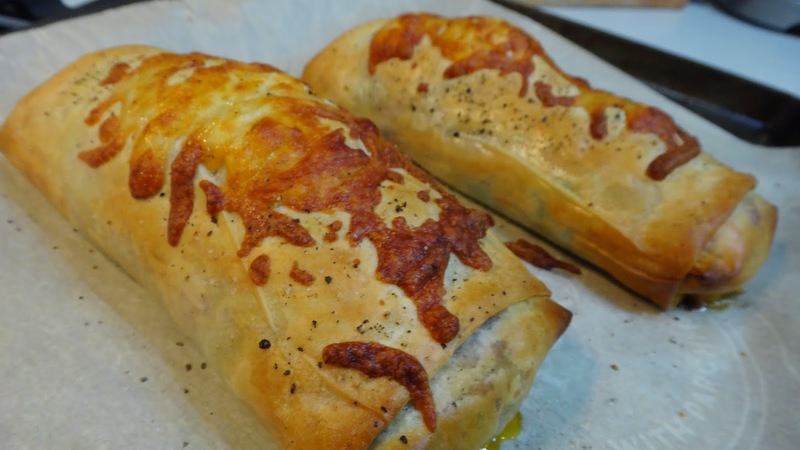 An individual flaky pocket served hot with a nice cool salad and dinner is served. This makes 4- 5 large hand pies. 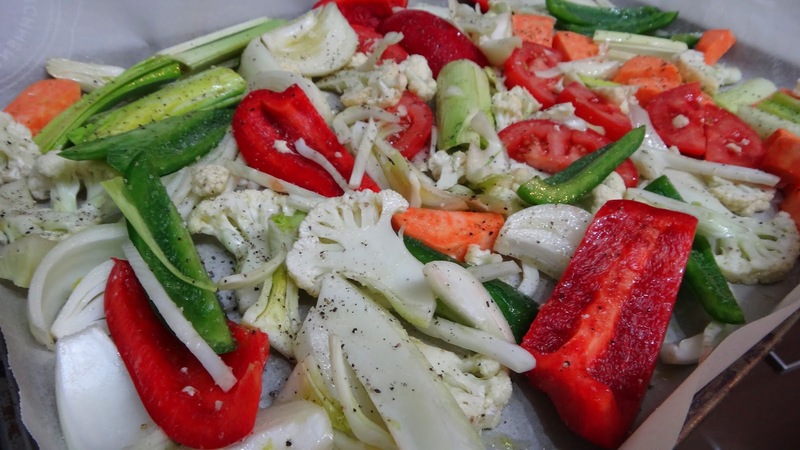 Step 1: slice tomato, red pepper, green pepper, slices of cauliflower, onion, 1/2 leek – green portion (leave the white portion to cook later) sweet potato and fennel. 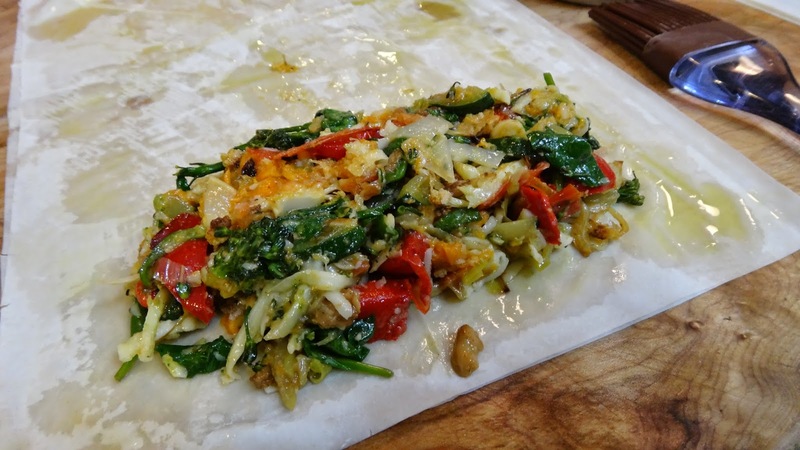 Toss with olive oil and place on a flat baking tray. Add a generous sprinkling of salt and pepper. Roast in a 425 oven for 15 minutes. 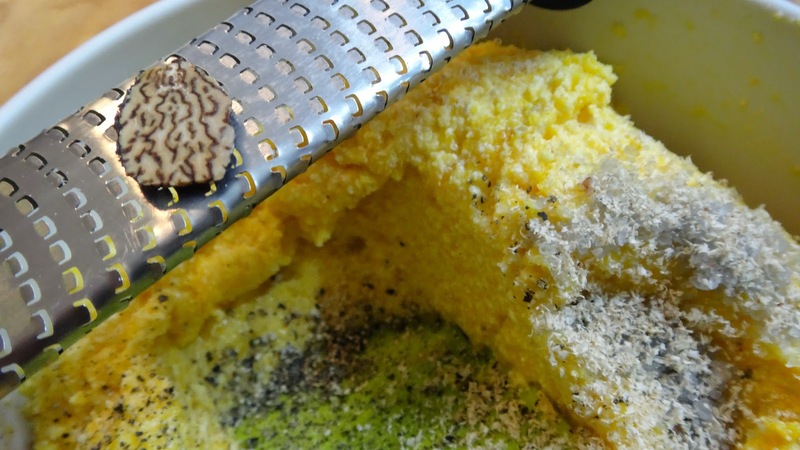 Step 2: with a spatula flip over vegetables and grate a generous sprinkle of Parmesan on top and bake for a further 10 minutes. Remove from heat and let cool. 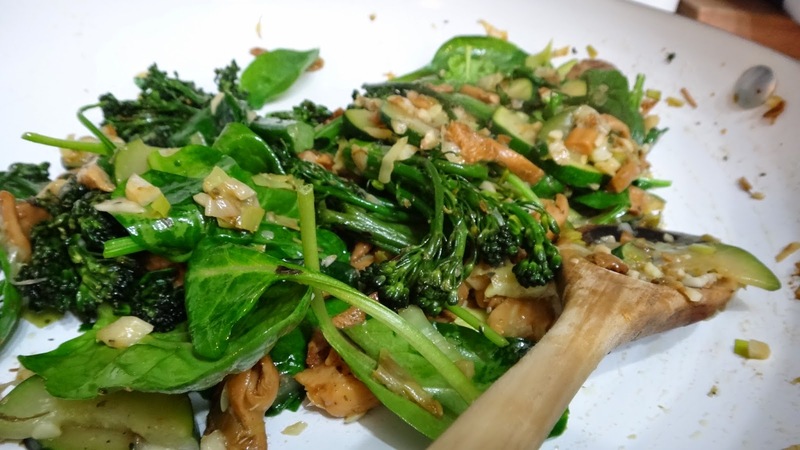 Step 3: in a saute pan add a few tbsp of olive oil and saute your more tender veggies like the mushrooms, white portion of the leek, zucchini and I had some broccolini so I tossed it in as well. I added some herbs de provence and some salt and pepper. 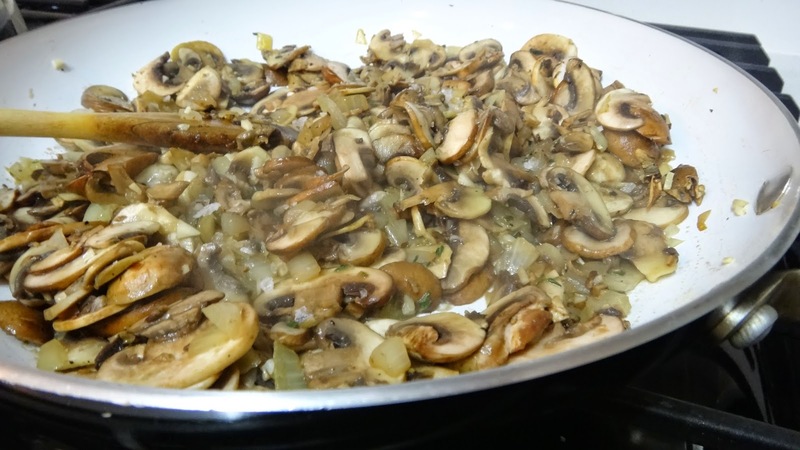 Saute on high heat until all veggies just start to brown and water evaporates. Step 4: turn off heat once cooked and add your baby spinach. 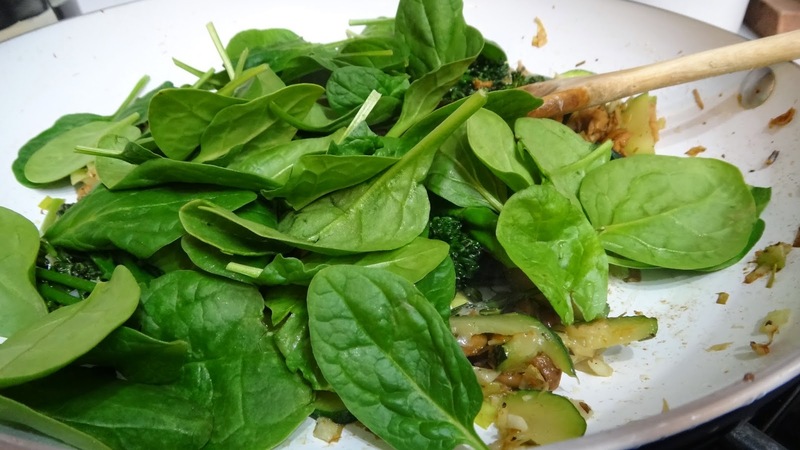 The residual heat with be enough to wilt the spinach. 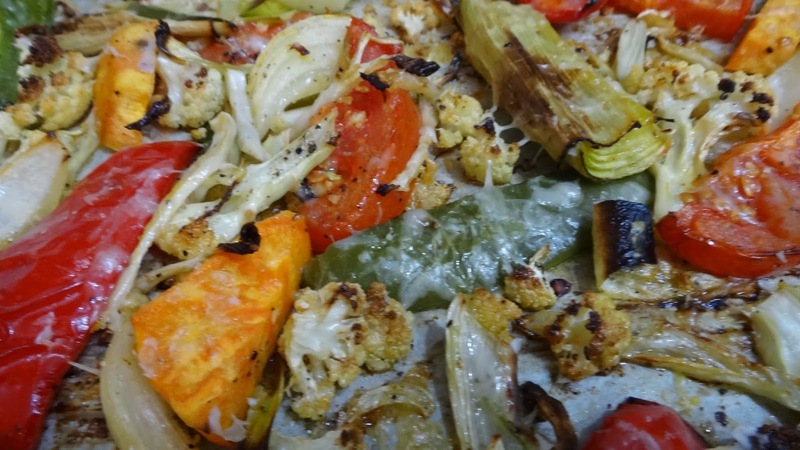 Let all vegetables cool completely. Step 5: rough chop all veggies and place in a large bowl. Add shredded mozzarella, grated Parmesan, pesto and mix. Taste and adjust salt and pepper as necessary. 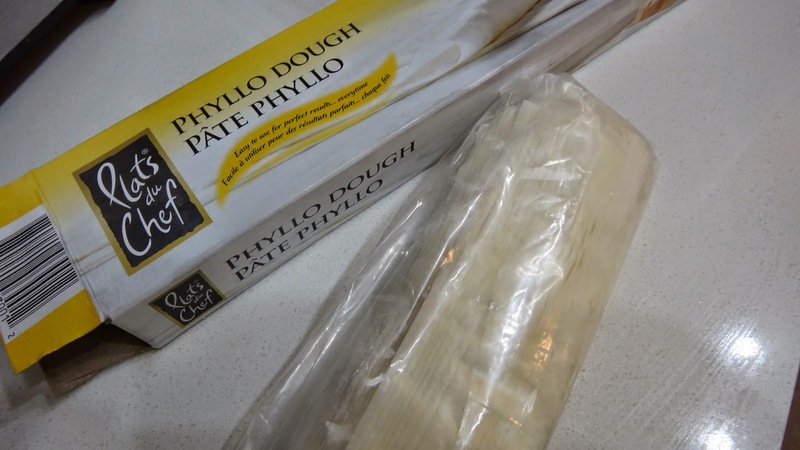 Phyllo should be thawed according to box. Take out 5 sheets and cut in half. 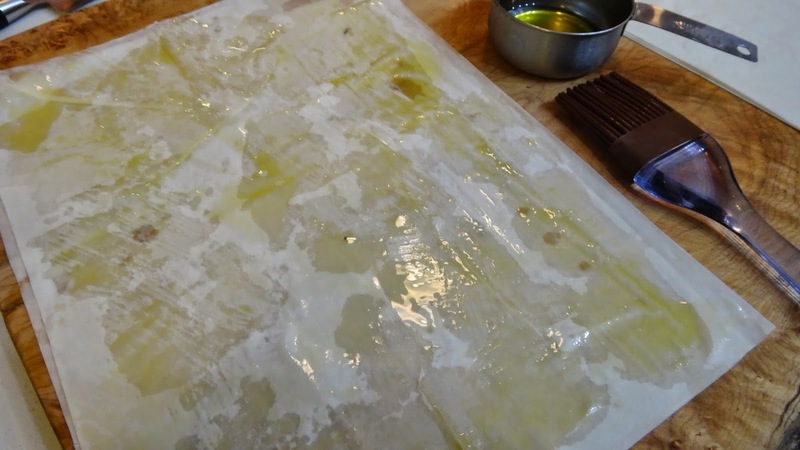 Step 6: brush a sheet with a bit of olive oil or butter. 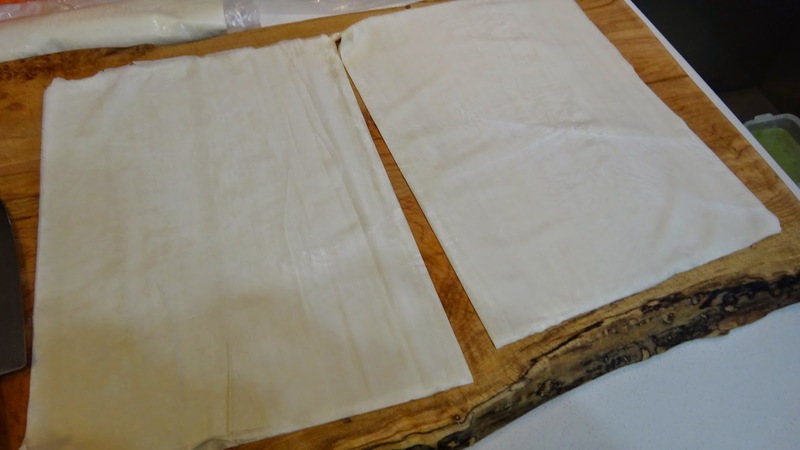 Place a second sheet on top and brush the top with a bit more oil. Step 7: place 1 cup of mixed vegetables on the bottom of the rectangle. 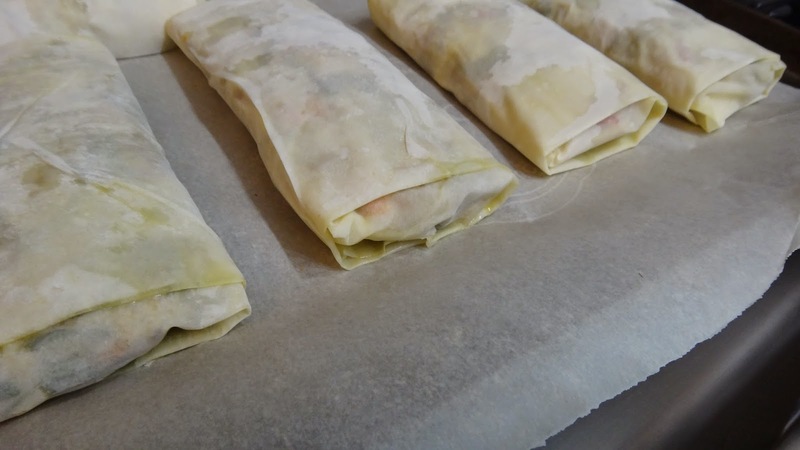 Fold like a spring roll making sure to brush the edges with more oil to have it stick. 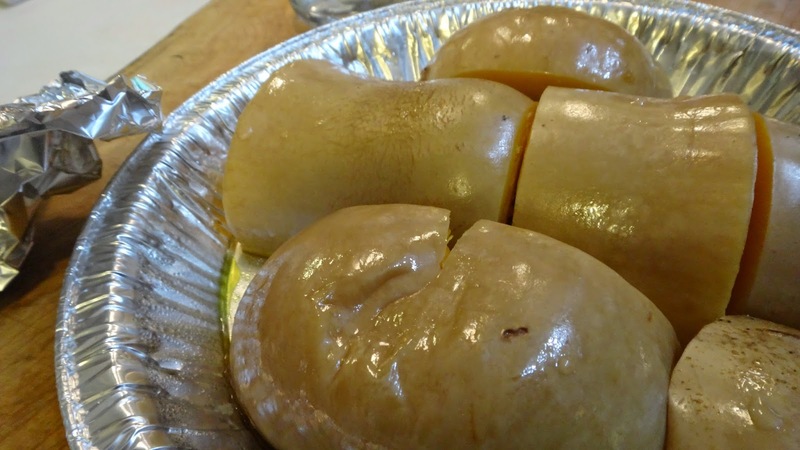 You can also freeze them at this stage. Bake 20 minutes at 425 degrees F and serve hot. 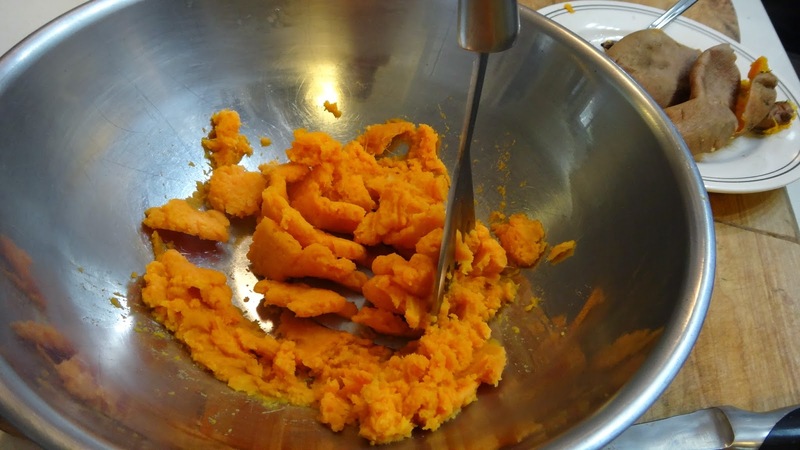 Sheila asked me if I had ever used sweet potatoes to make gnocchi yesterday. 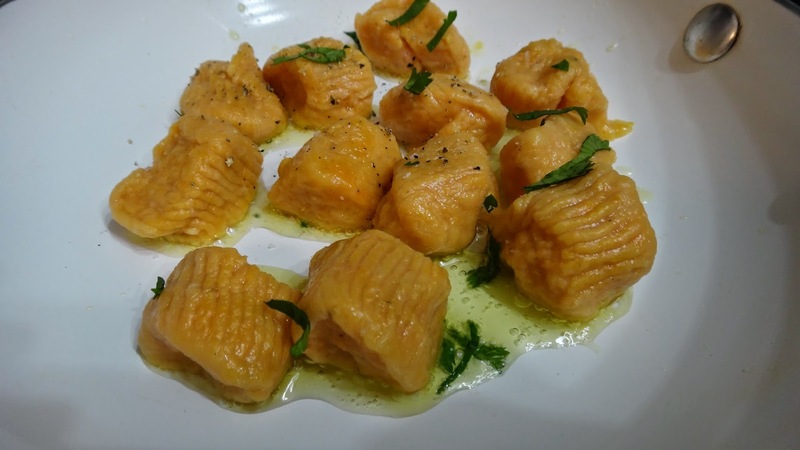 I had always thought of sweet potatoes as being too wet for making gnocchi but, then I thought if you bake them or cook them in the microwave it could work. 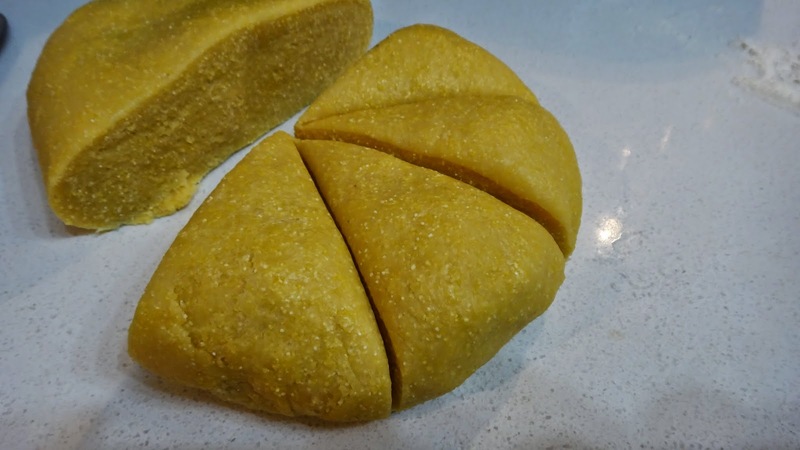 I found a few other recipes on the web and most used ricotta with the sweet potato or they were a paleo version using flours other than wheat. I wanted to try to make them just replacing the potato and here is my result. I am quite happy with how they came out. 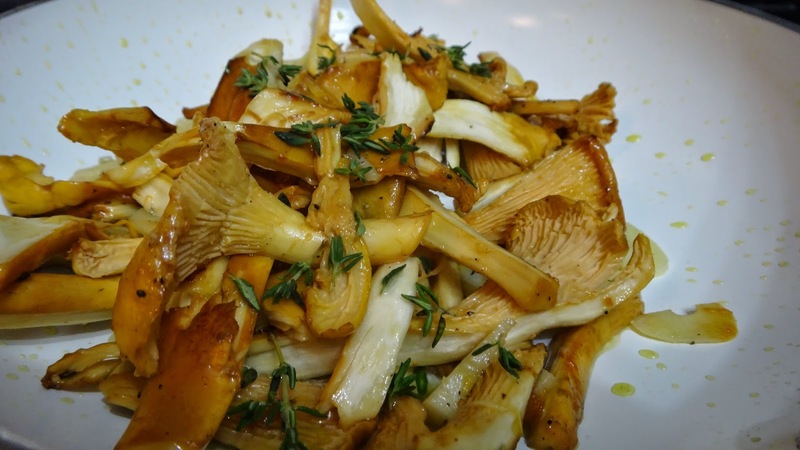 I prepared them with a bit of lemon zest, cooked in some buttery mild olive oil (you could use butter if you like) and a bit of parsley but I think fried sage leaves would work well too. 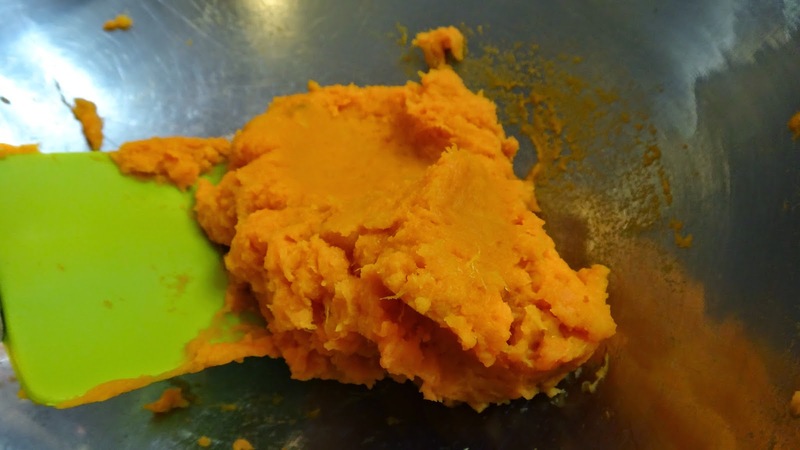 Thanks Sheila for asking me the question…YES you can use sweet potatoes. 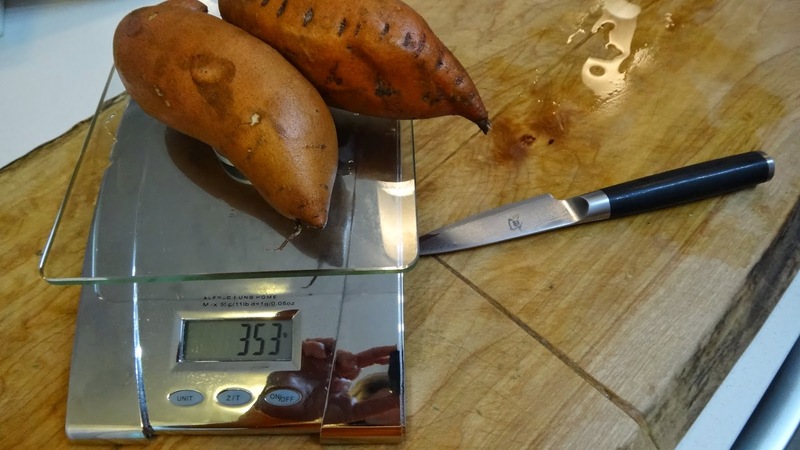 Step 1: wash and poke a couple of small sweet potatoes with a fork and microwave for 2 minutes. Flip over and cook 2 more and if still not completely soft cook another 1 minute and check until done. 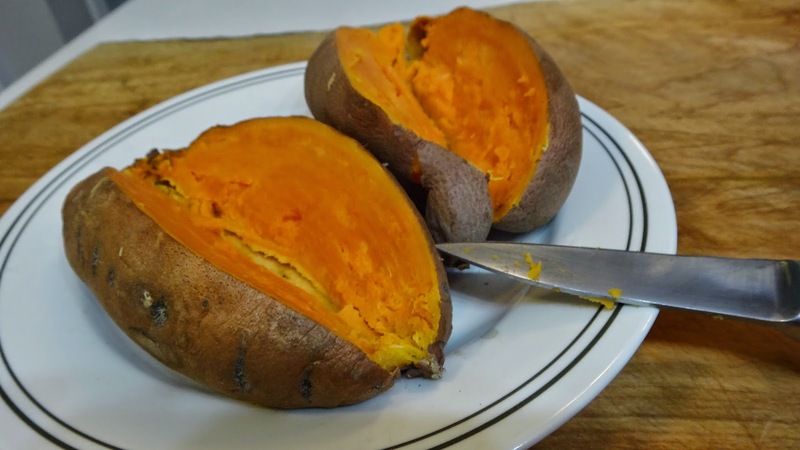 I suggest you place the sweet potatoes on a plate so that you get catch any leaks. Step 2: slice open and scrape out hot flesh with a spoon into a bowl. 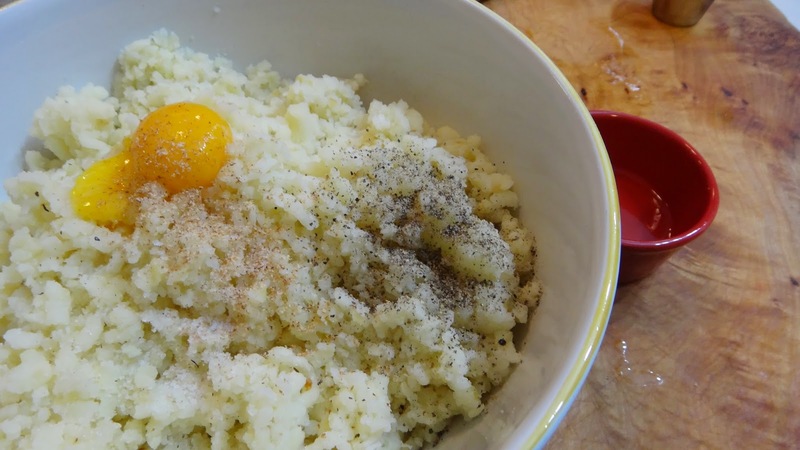 Step 3: you can mash with a potato masher or run them through a ricer. 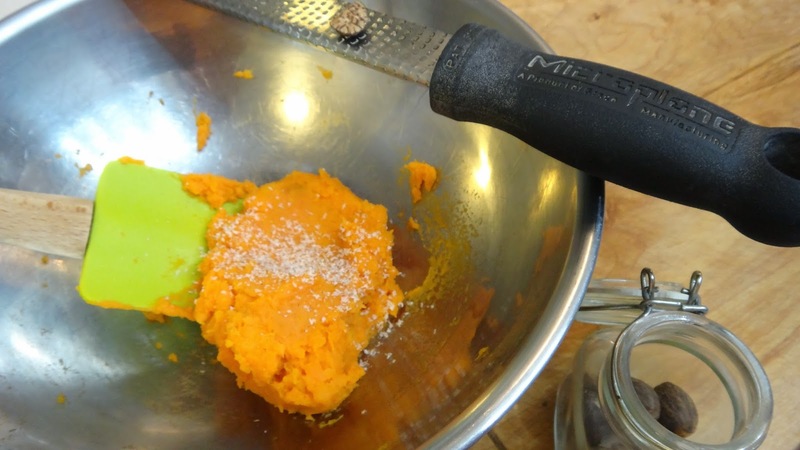 I always use a ricer for the regular russet potatoes but, this method worked fine because the sweet potato is not as dry as the potato. Step 4: you should have a nice mash that is not too wet. Add a bit of fresh nutmeg. 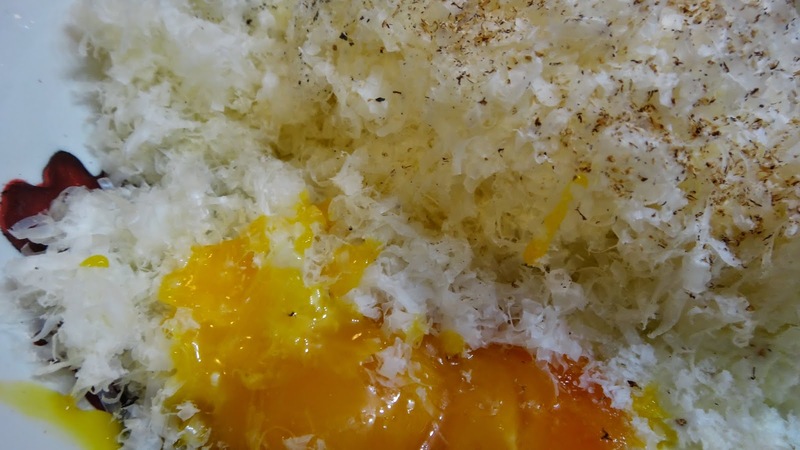 Step 5: add an egg, freshly grated Parmesano Reggiano, salt and pepper. At this stage your mix will be rather wet. 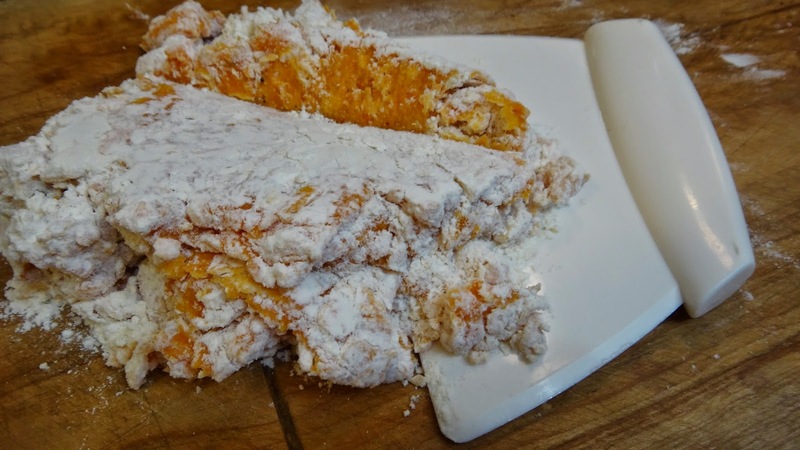 Add 1/2 cup of flour and gently fold in for a few seconds then turn out onto a counter or board. I basically use a scraper to fold over and incorporated the flour. 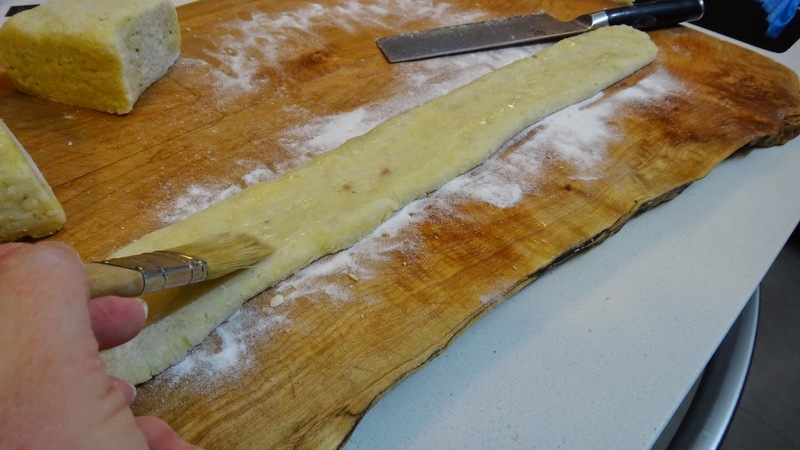 Gnocchi can be tough if you work the dough too much. 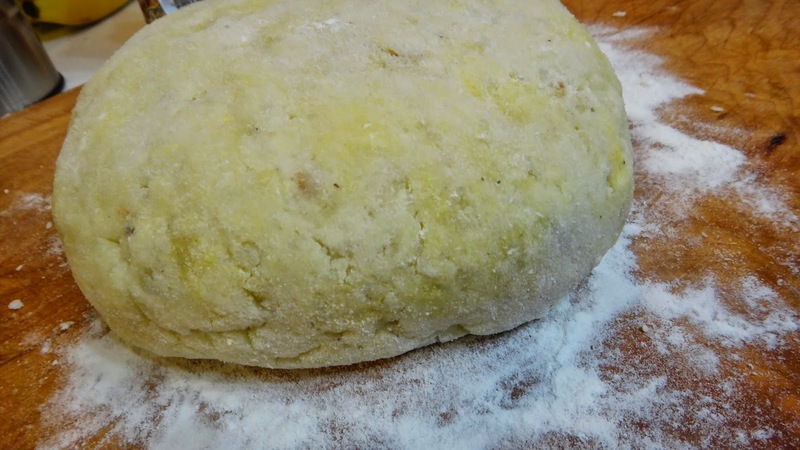 I add the last 1/4 cup of flour by gently kneading the dough. 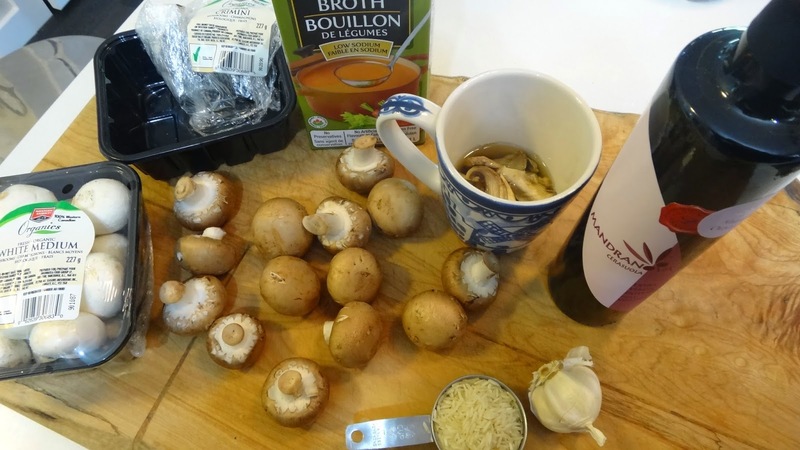 You want it to hold together when you boil them but, you don’t want to overwork the gluten and make them hard. 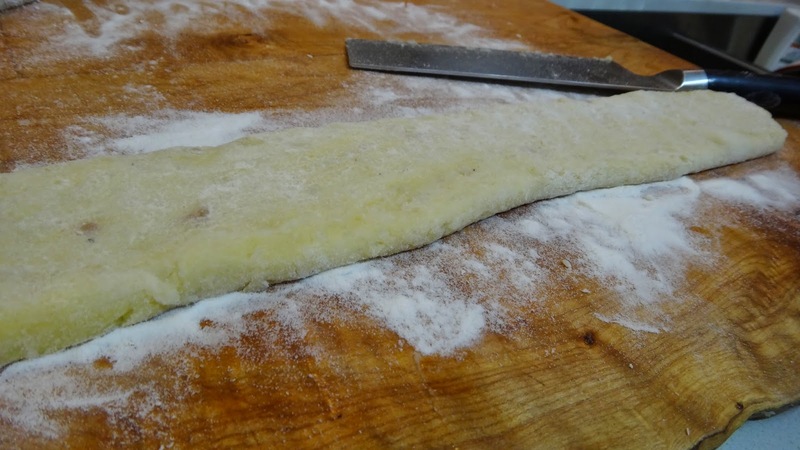 Step 6: I divide the dough into 4 pieces and form into logs. I cut with a floured knife into pieces around 1 inch in size. 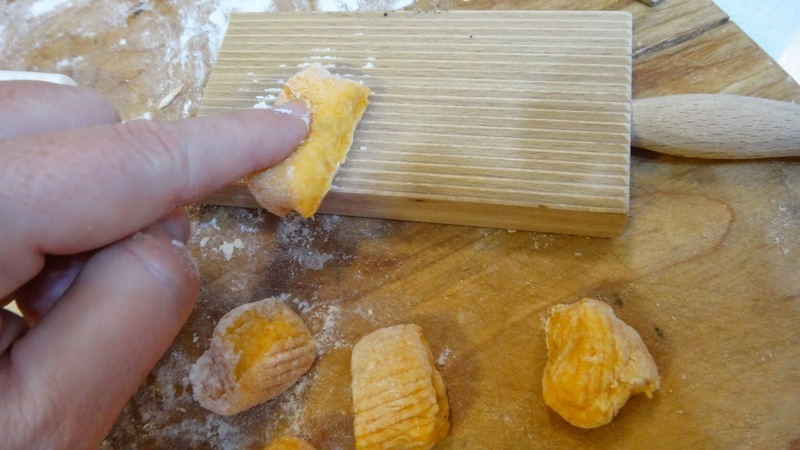 I have a cute little gnocchi board to create some ridges but, you can form them on the back of a fork or just cook as is. Some people just press the tops to form a little dent. 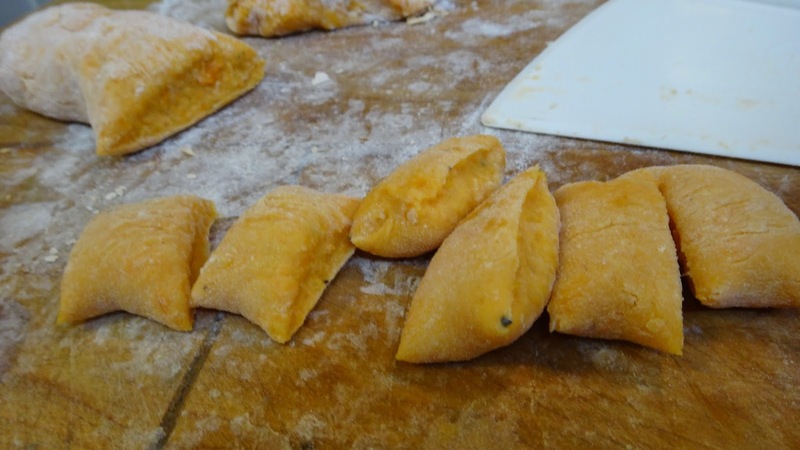 Place them on a floured sheet. You can cook them right away or freeze them. Step 7: place some in a pot of boiling, salted water. 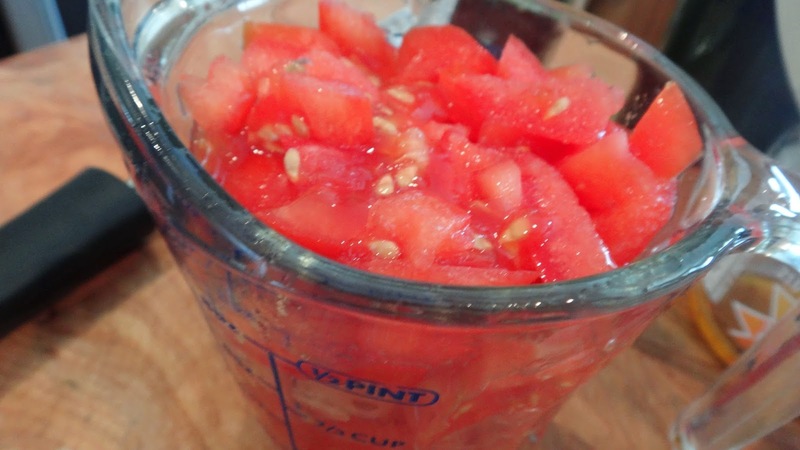 Place them in the water and gently stir once so they don’t stick to the bottom. Wait until they float and cook 1 more minute. This will probably take 2 – 3 minutes in total. 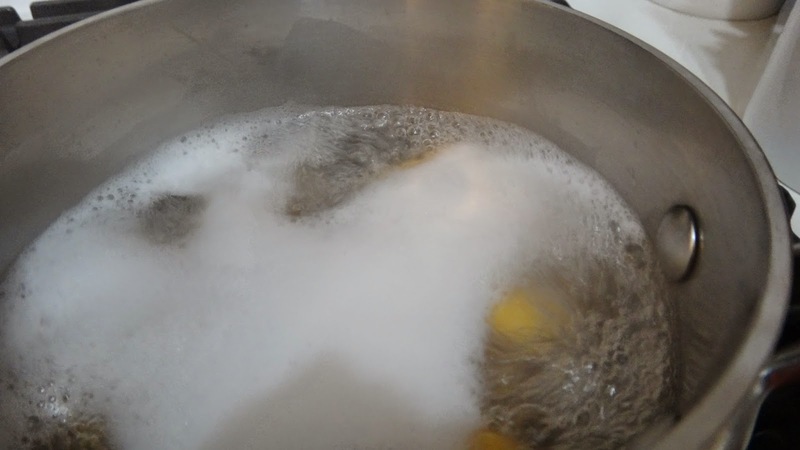 I remove them with a spyder and place them directly from the water to a heated pan. Step 8: with a bit of great extra virgin olive oil or a bit of butter. Saute the gnocchi for a minute on each side to get a touch of browning. 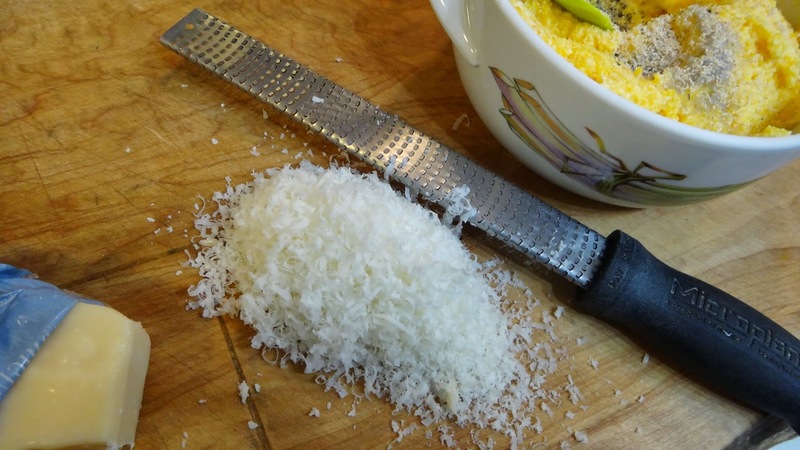 I grated a bit of lemon zest and tossed in some chopped parsley, salt and pepper. 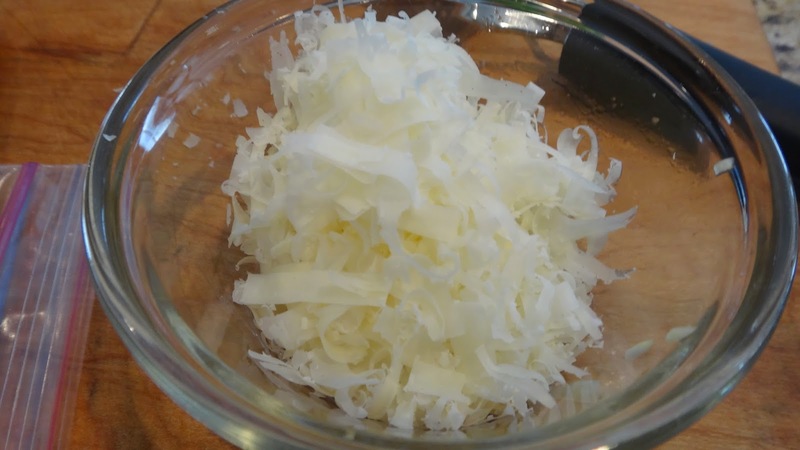 Serve hot with a few scrapes of Parmesano Reggiano. Sometimes you just need something fresh and nourishing. 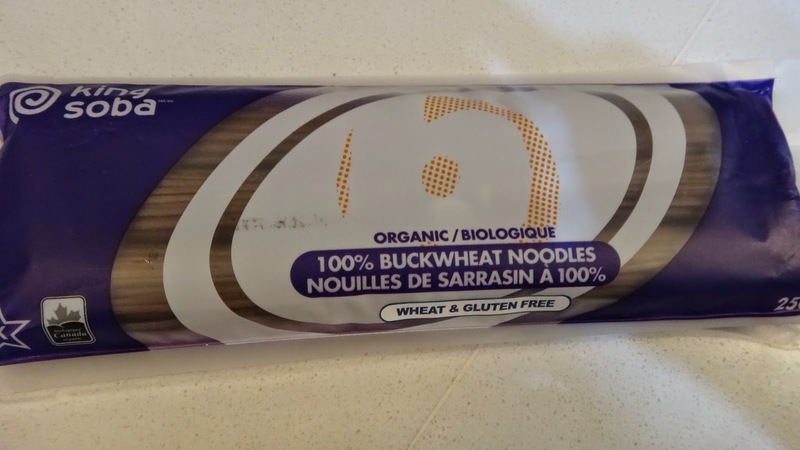 Soba noodles are available in the Asian section of your grocery store and are made from Buckwheat which also happen to be a gluten-free option if made from 100% buckwheat flour. 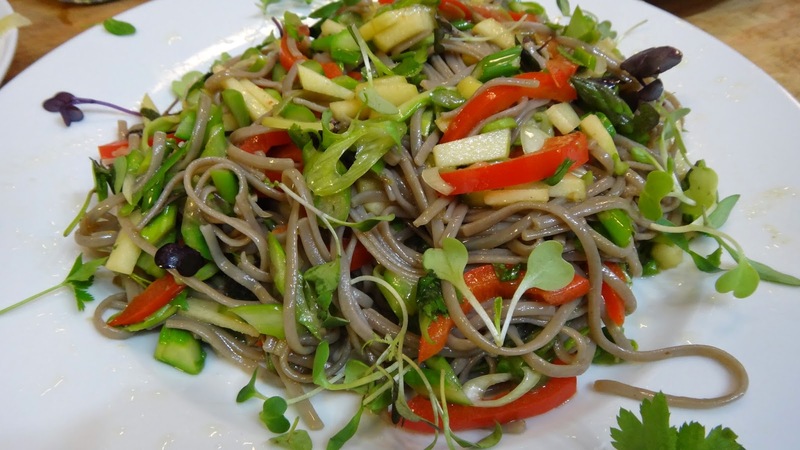 This salad is made with loads of fresh vegetables, all tossed with some Soba noodles and a tasty dressing. These noodles are easily found in your favorite Asian market or even in the Asian section of most grocery stores. 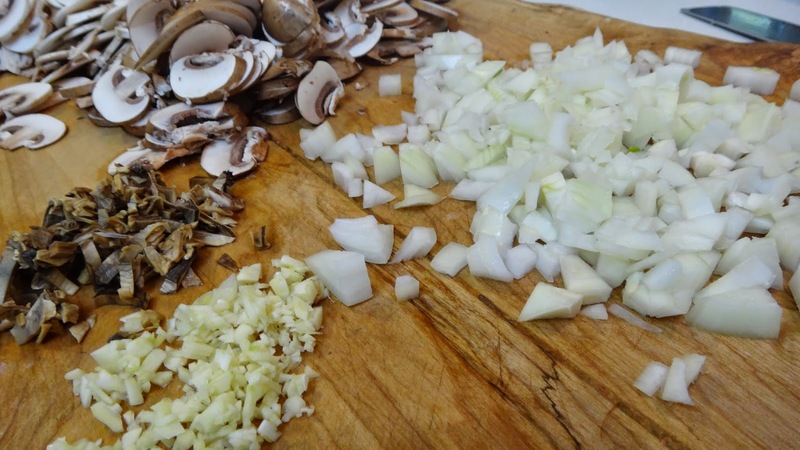 Step 1: I like to gather all my ingredients and chop, peel or measure all things so that when I am ready to cook everything goes quickly and more importantly you don’t accidentally forget something! Get your water boiling -add a good pinch of salt and cook your noodles according to the package. 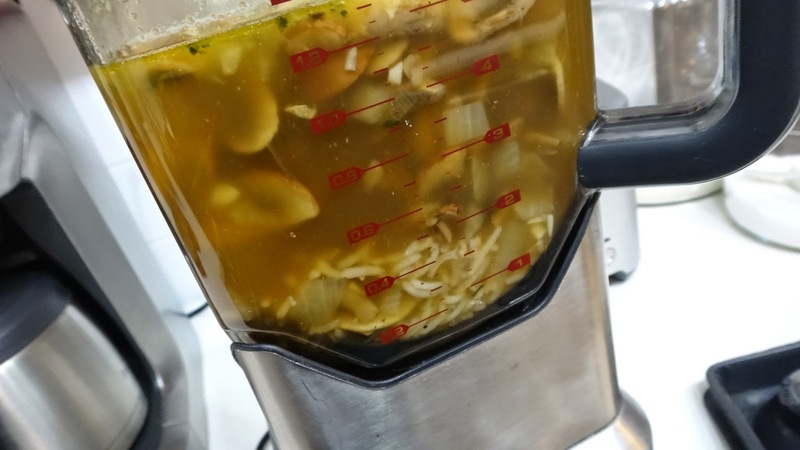 Drain and toss with a bit of your dressing or plain olive oil so they remain separated or these noodles will stick together like glue. 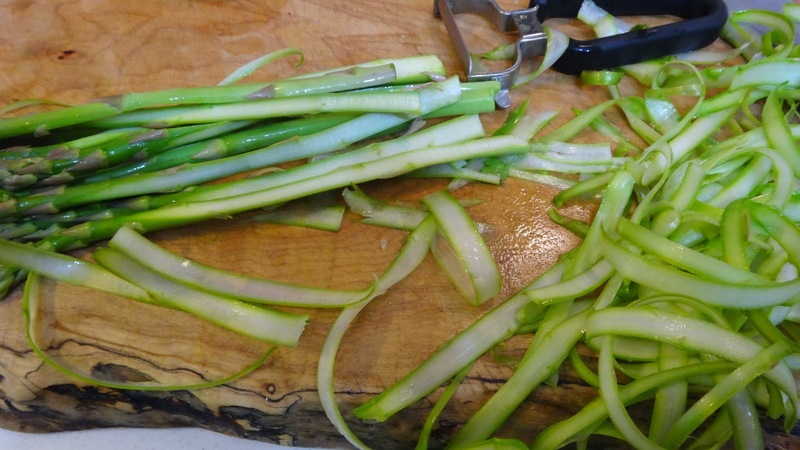 Step 2: take some washed Asparagus and peel long strips with a potato peeler. 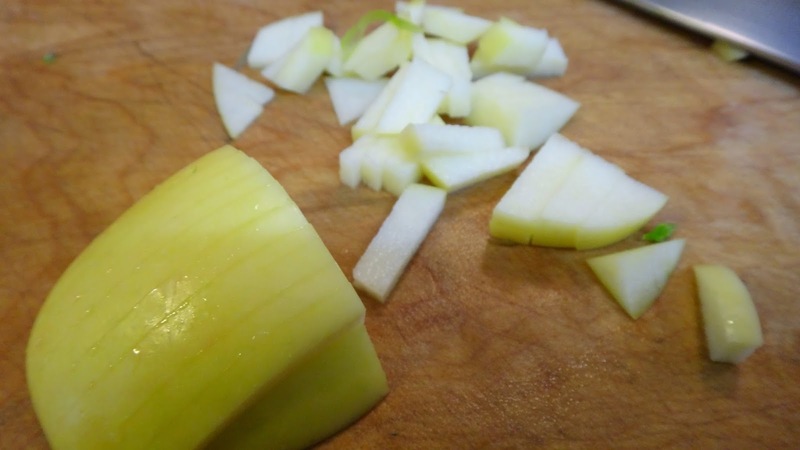 You will make strips along one side and then get to a point where the peeler no longer works properly. I flip it over at this stage and peel strips from the outer edge towards the center. I do this with each spear, then I take those centre pieces and chop them finely for another texture in my salad. 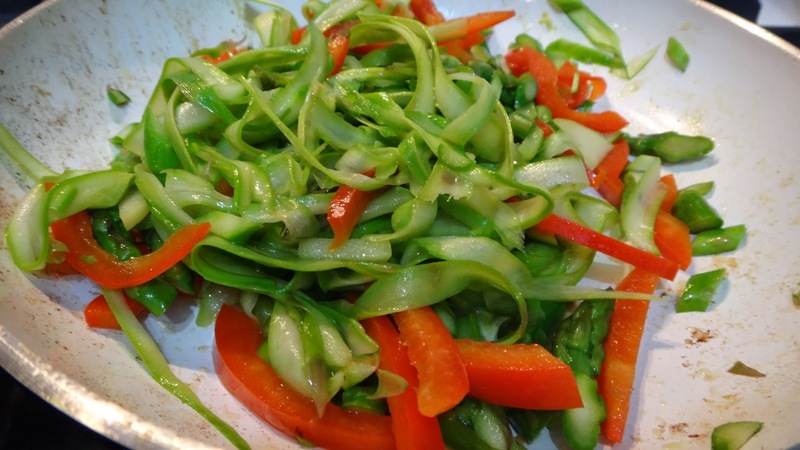 Step 3: chop some apple, red pepper and whatever other vegetables you love. 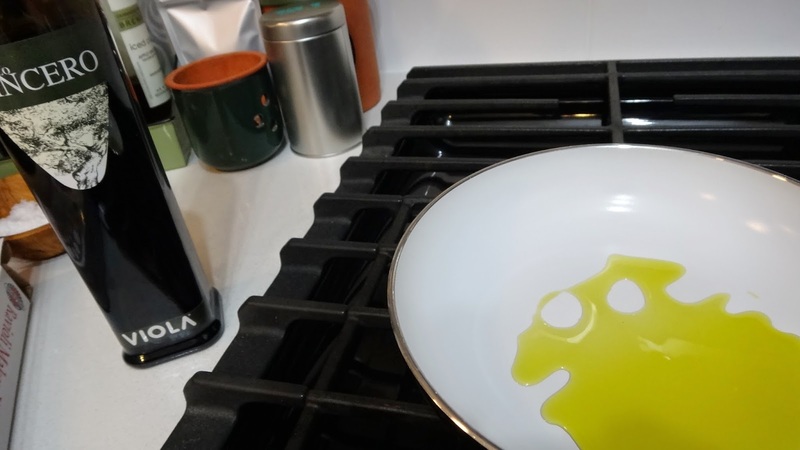 Step 4: in a saute pan add some of your favorite extra virgin olive oil, some salt and pepper and saute on high heat for a minute or two. Step 5: in a small bowl create a dressing by adding 1/4 cup olive oil, sesame oil, soy, honey, salt, ginger, garlic, Sriracha and red chili for a bit of kick. Mix well. 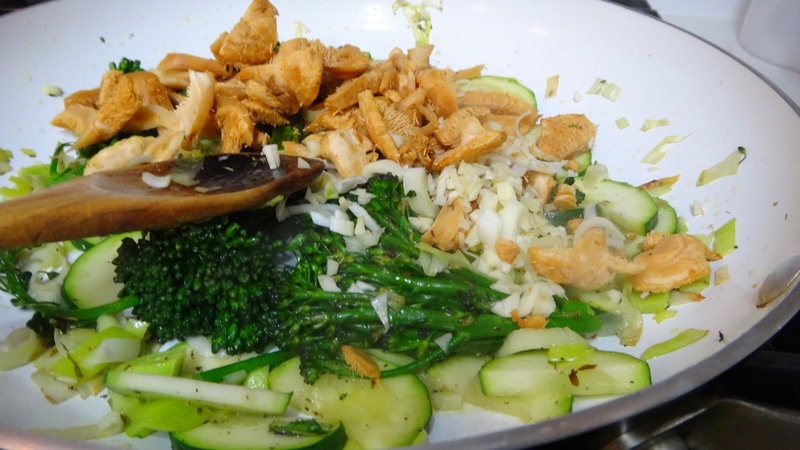 Finally, toss all your briefly cooked vegetables, along with your noodles in the dressing. You can eat this salad warm or room temperature. I garnish with some cilantro leaves and some baby greens. This is one of the nicest decadent treats I have had in a long time!! 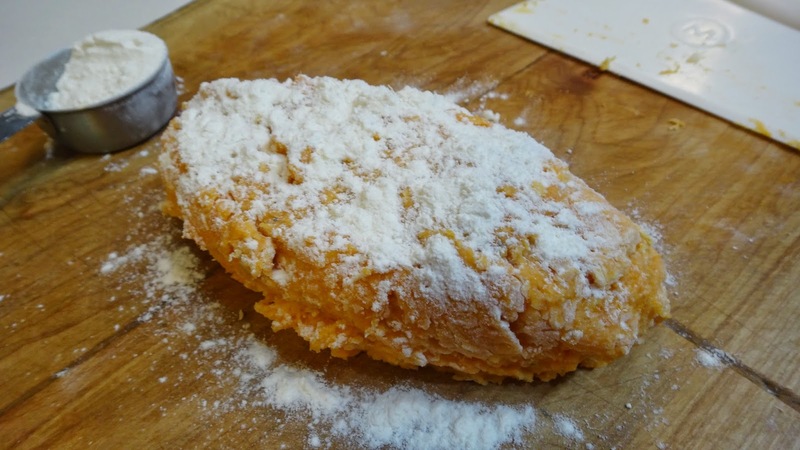 These are gorgeous little puffy pillows that have the perfect contrasting spicy Arrabbiata sauce and some Parmesan shavings on top. 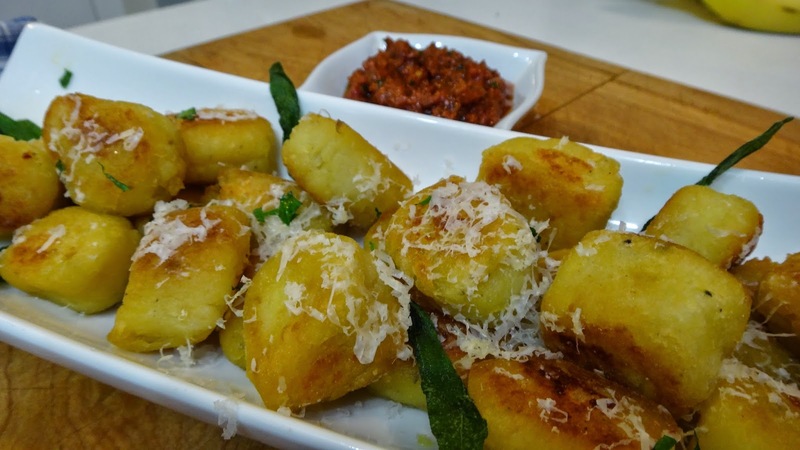 This recipe is Gennaro Contaldo’s recipe from You Tube for Stuffed Fried Gnocci, with Arrabbiata Sauce If you have never seen Gennaro you simply much watch his You Tube videos, he is my favorite. I love his passion and love of good food. I think one of my favorite shows was on BBC Two Greedy Italians with Gennaro and Antonio Carluccio. 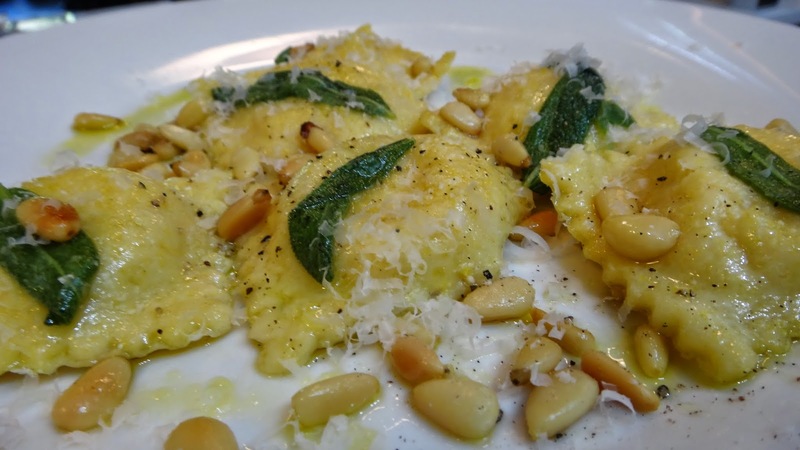 This recipe is Gennaro’s recipe for the perfect Christmas starter. I think the recipe is just perfect. It takes a bit of time but, so so so worth it!! I promise you. 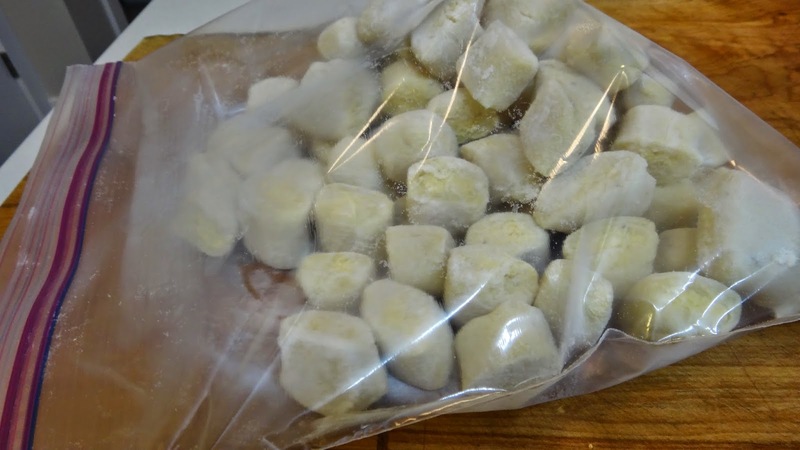 You can also freeze the gnocchi (I tried it last night) and let them come to room temperature before frying them. I do not recommend boiling them because they are stuffed and get heavy. If you make them as he does they are puffy and gorgeous!! COME ON!! It’s for Christmas, you don’t eat this everyday!! 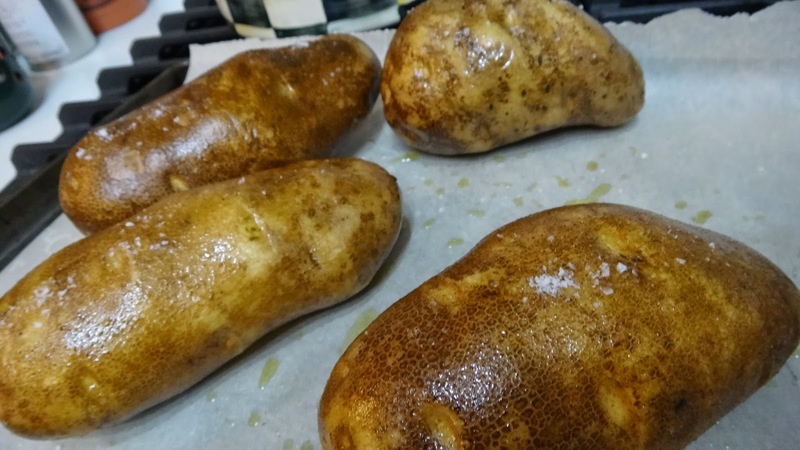 1.5 kg (4-5) Baking Potatoes – I used Russet you want dry not waxy potatoes. 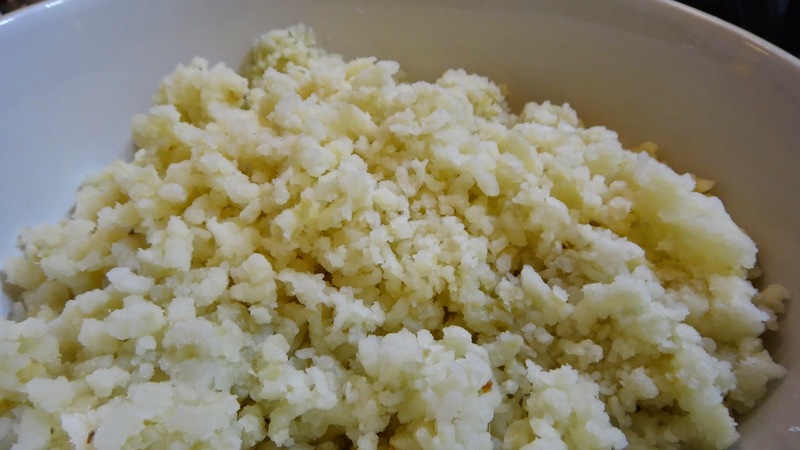 Step 2: once potatoes are cool enough to handle (don’t wait until they are cold they should still be hot for ricing) peel skins and rice in a potato ricer or food mill. 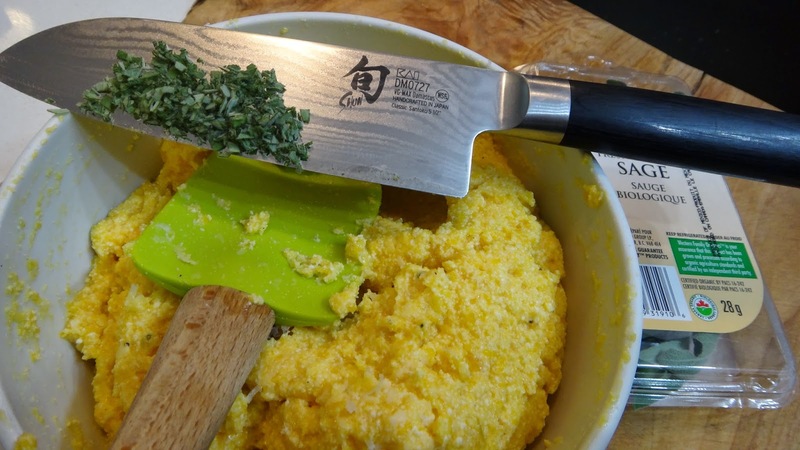 This tool is really the secret to the best mashed potatoes too..It’s like a giant garlic press. 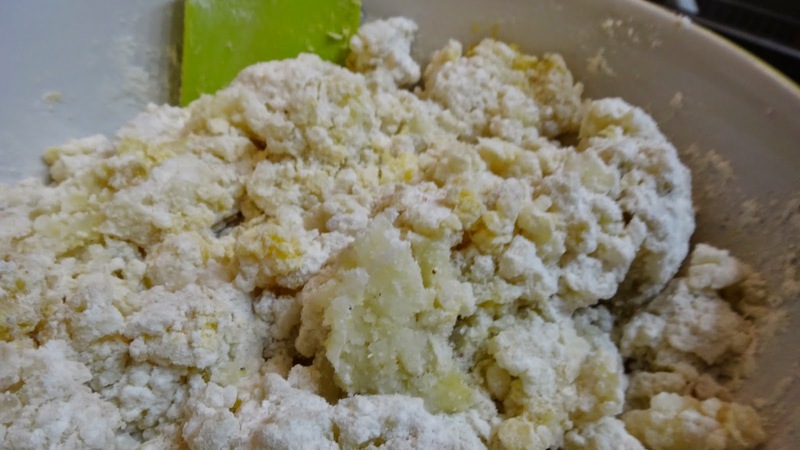 You place cooked potatoes in it and squeeze out the little squished pieces that look like rice! 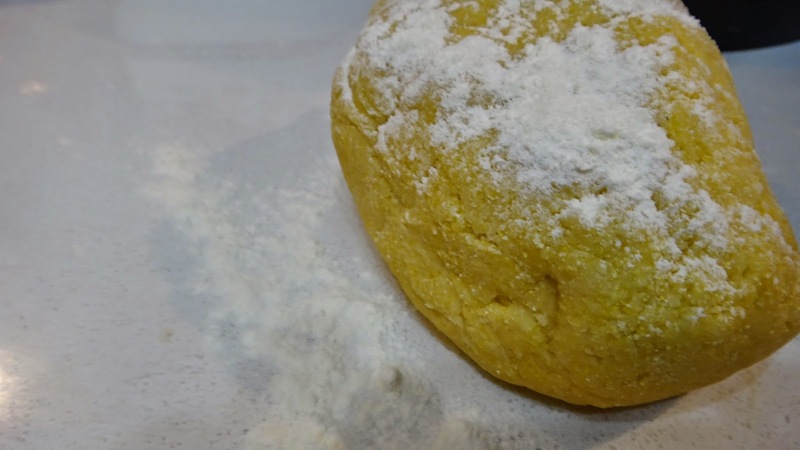 Step 3: add egg yolks (keep 1 egg white for brushing on dough – food glue! 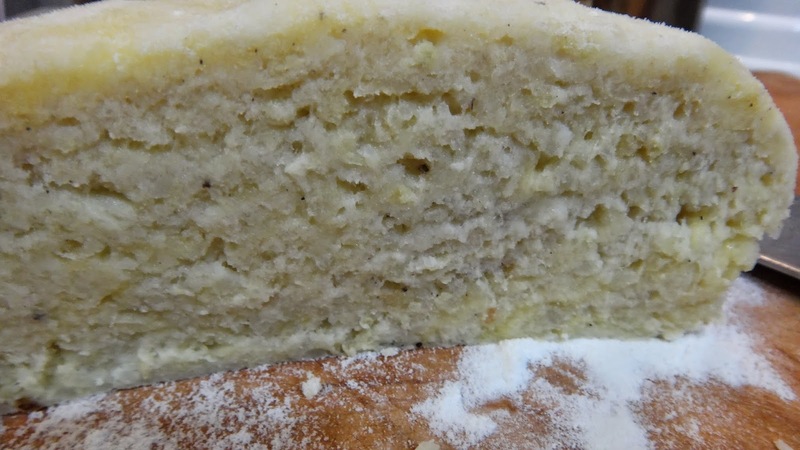 ), nutmeg, salt and pepper (it takes lots) and flour. Mix lightly with a spatula. I like to fold it like I am incorporating whipped egg whites into something. 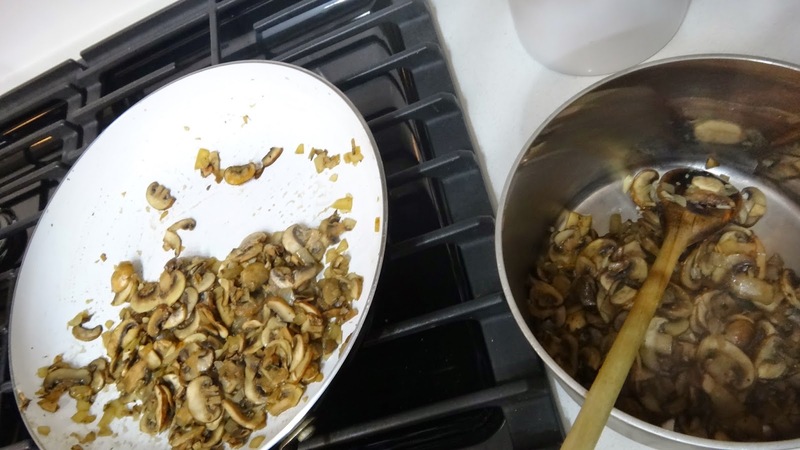 Just a few turns and then you can mix lightly with your hands before turning out everything from the bowl onto counter. 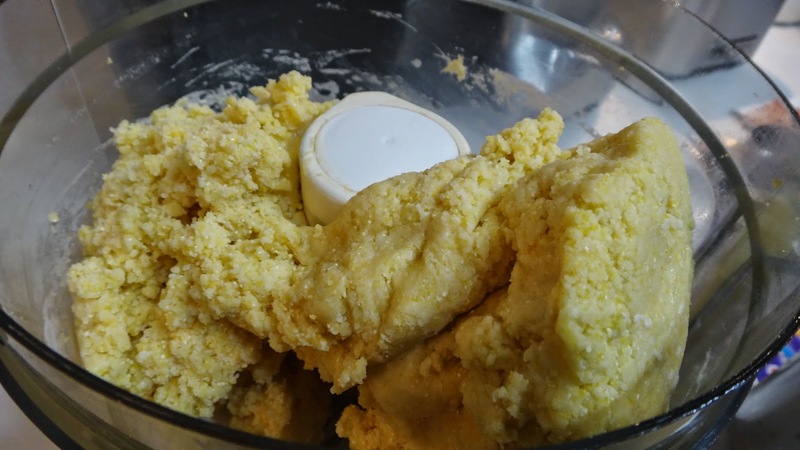 You want to just gather all the flour and create a dough. 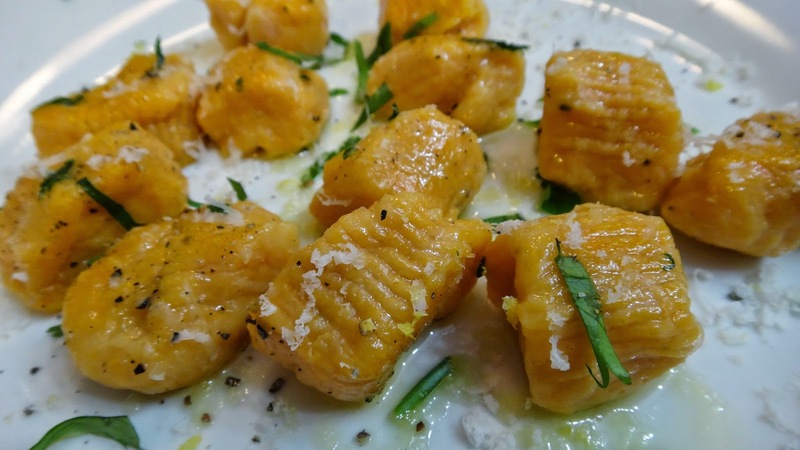 You do not want to overwork or the gnocchi will become tough. Taste to see if you need more salt and pepper. 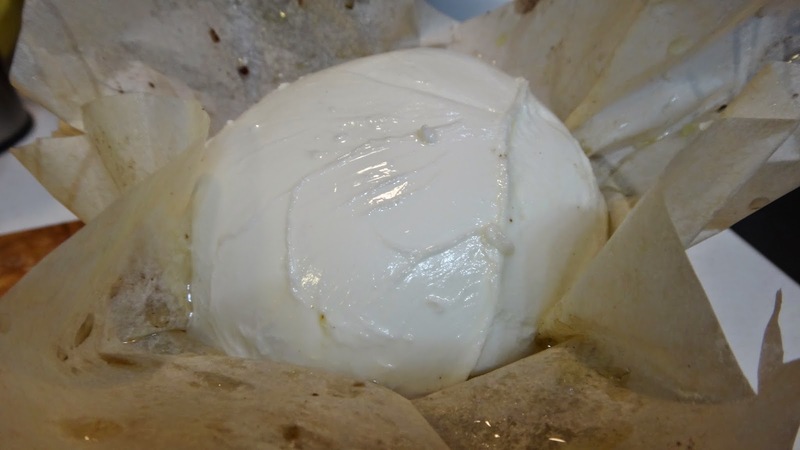 Step 4: if you cannot find smoked mozzarella you can make your own! Add some food safe wood chips to a smoker box for the barbecue and light the wood on fire in your outdoor grill. Once the smoke starts going I place the ball of mozzarella on a plate/bowl next to the smoker box. Close the grill lid and let the wood smoke permeate the cheese. It will not melt the cheese if it is just a handful of chips you are burning. 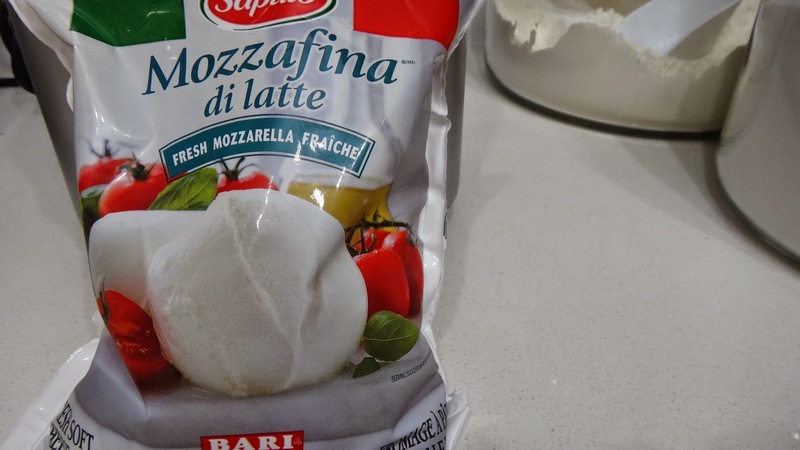 I remove the mozzarella after 5 minutes and it is smoky. Gennaro had a really nice charred one in his video! Step 5: make filling in another bowl. 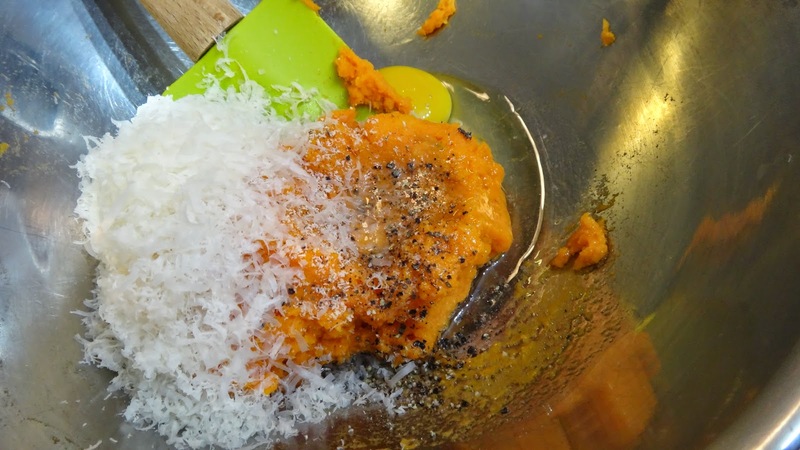 Add ricotta, finely grated Parmesan, smoked mozzarella torn/squished into pieces with your hands, Add salt, pepper, nutmeg and egg yolks. Mix well. It should be on the drier side (like a paste) not runny. Taste and adjust salt and pepper if necessary. 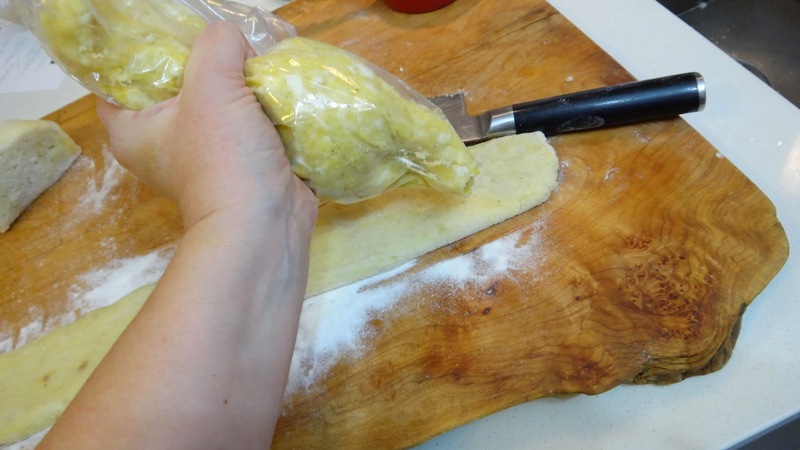 You can place in a piping bag or Ziploc bag with one end cut to pipe filling onto potato dough. 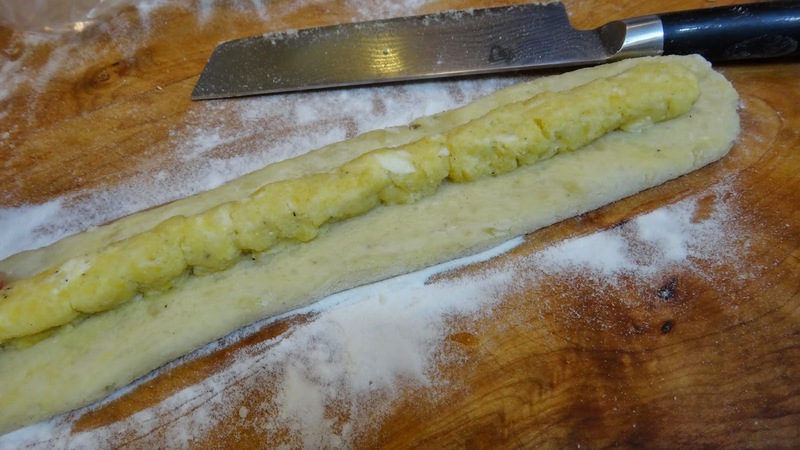 Step 6: Divide potato dough into 4. 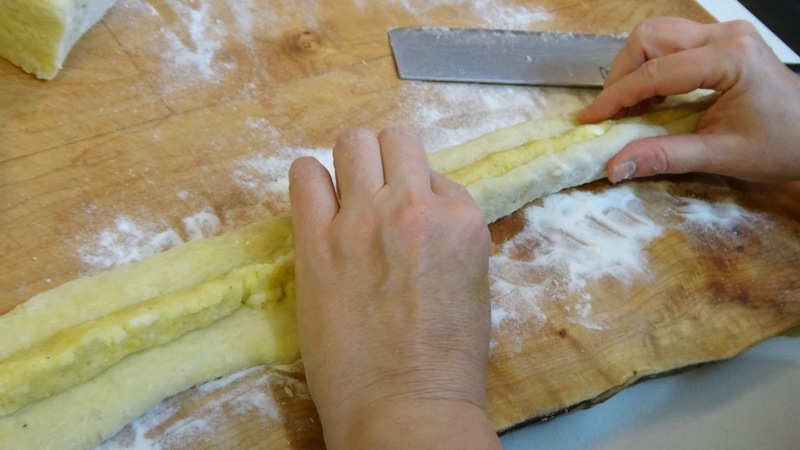 Roll one section into a thick rope (approx 24 inches long and 2 1/2 inches wide) using plenty of rice flour to avoid sticking. 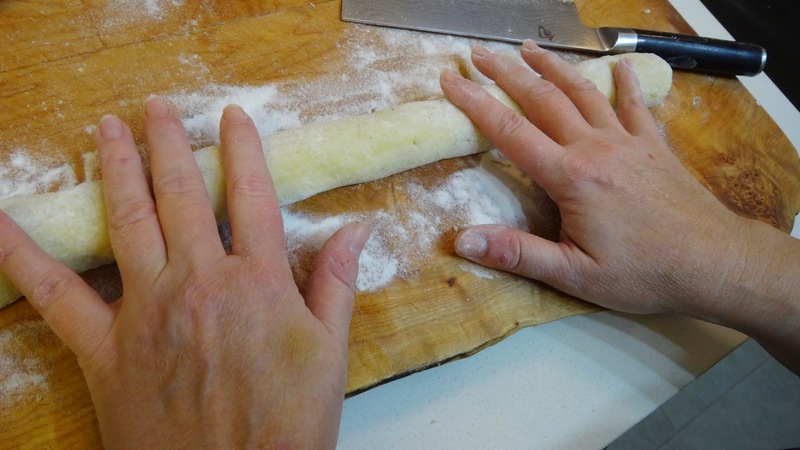 Step 7: press log with heal of your palm to flatten or use a rolling pin. Step 8: brush with egg white. Step 9: add a row of filling. My filling was dry enough that I could roll it out with my hands. 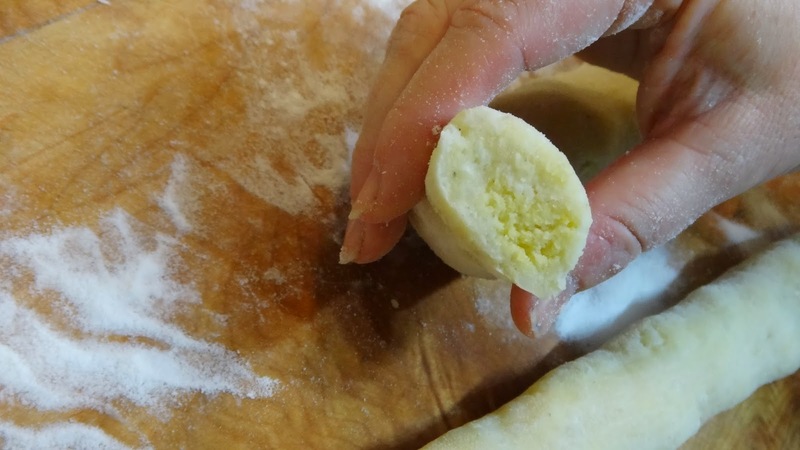 Step 10: roll the potato dough over the filling and gently seal and roll to encase with more rice flour. Step 11: chop into 1 inch pieces or the size you like. 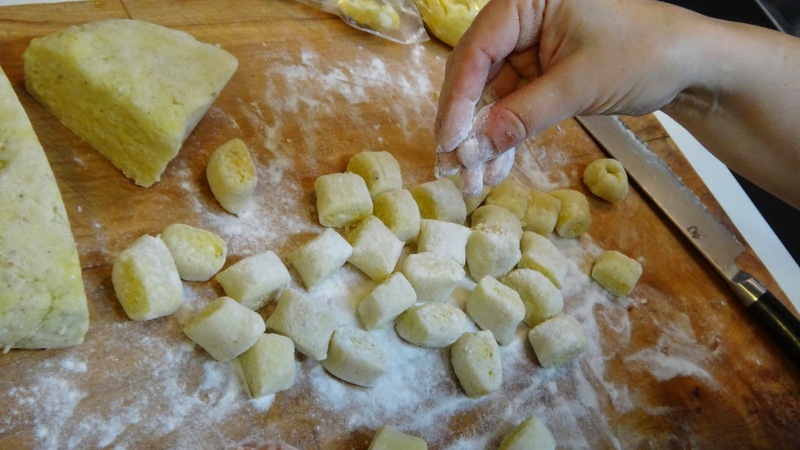 Place finished gnocchi on a cookie sheet with lots of rice flour to avoid sticking. 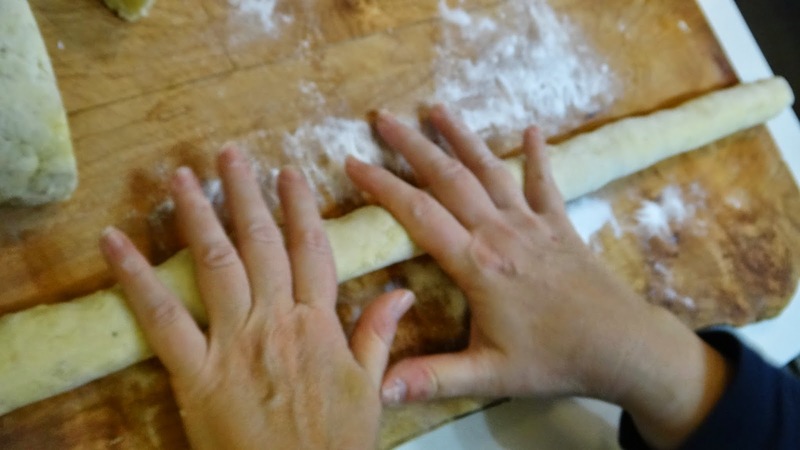 Repeat for the other 3 rolls – this recipe is perfect for 4 rolls of dough and 4 equal rolls of filling. 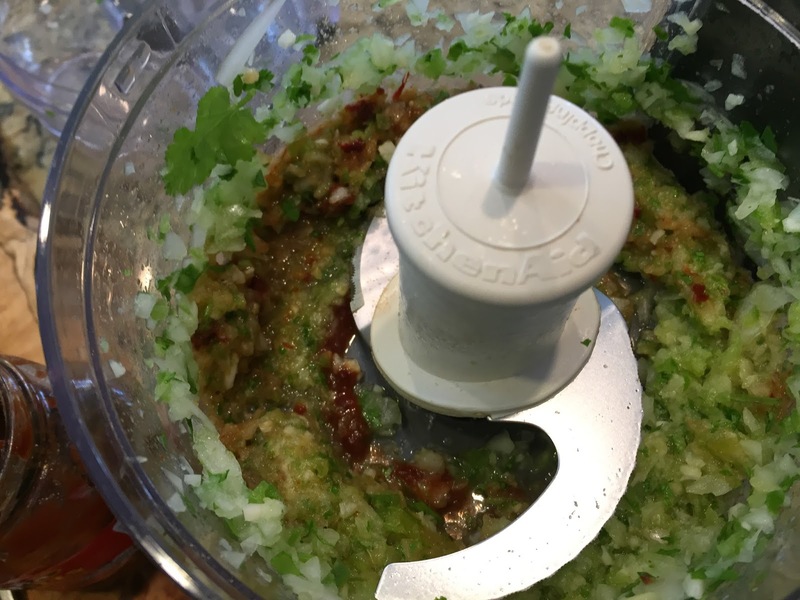 Step 1: in a food processor add sun dried tomatoes and pulse to mince. 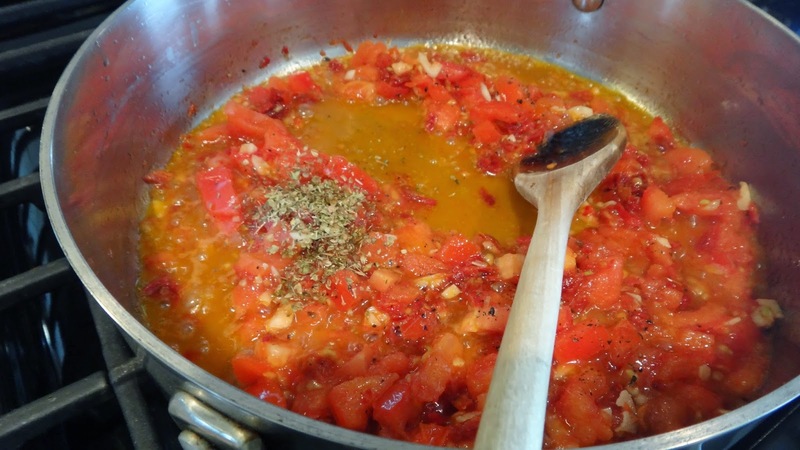 Step 2: add minced tomatoes to a saucepan along with chili flakes, oregano, salt, parsley and olive oil. Cook on low heat for 3-4 minutes to soften. This is my addition Gennaro did not add water. Step 3: remove from heat and add to a blender. 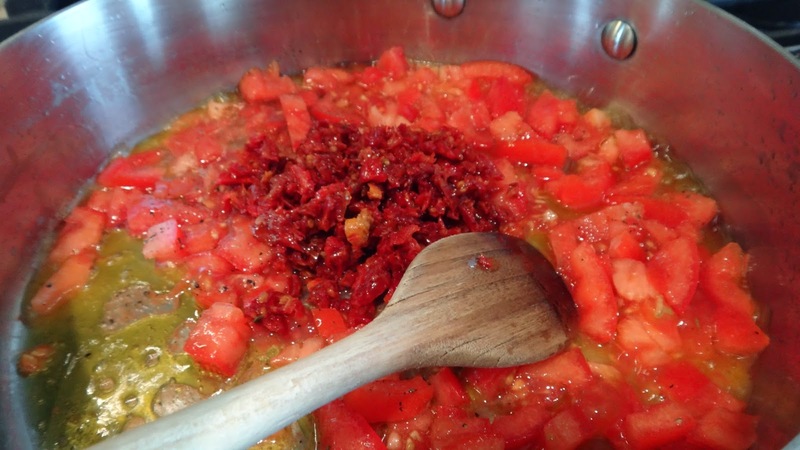 Add water and blend until becomes a thick chunky sauce. If you need to add a bit more water to get it to the consistency you like feel free. Taste and adjust salt. 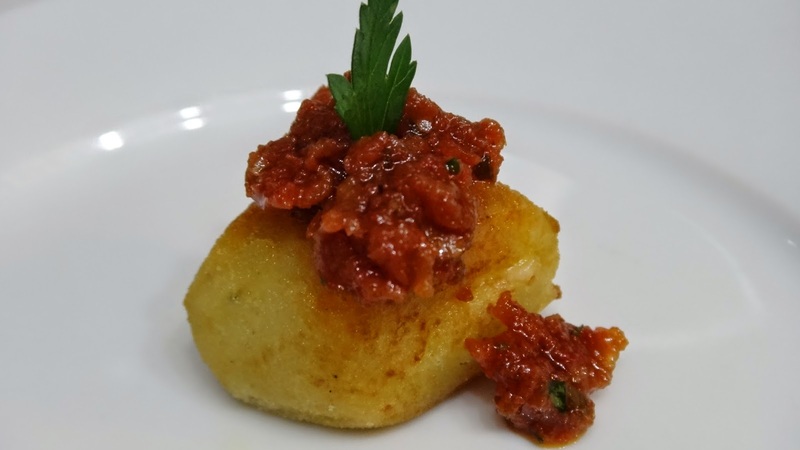 It will taste spicy but, it will mellow over time and the fried gnocchi go so well with the contrasting spicy sauce. 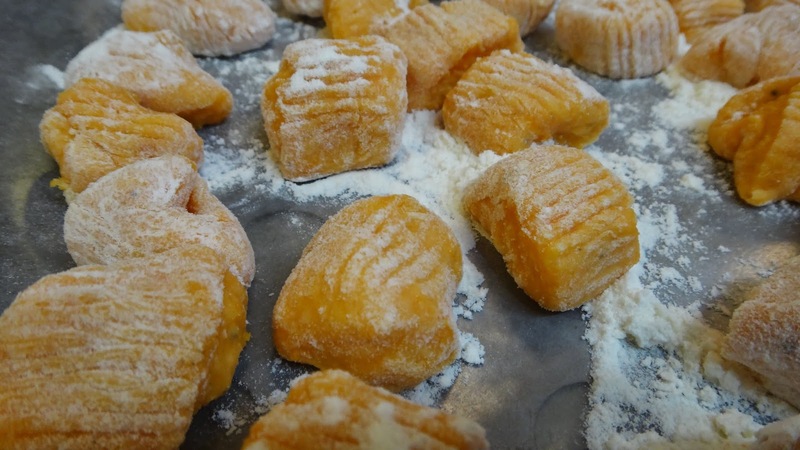 Fry the gnocchi in hot oil at 350 degrees F if you have a deep fryer this works well. 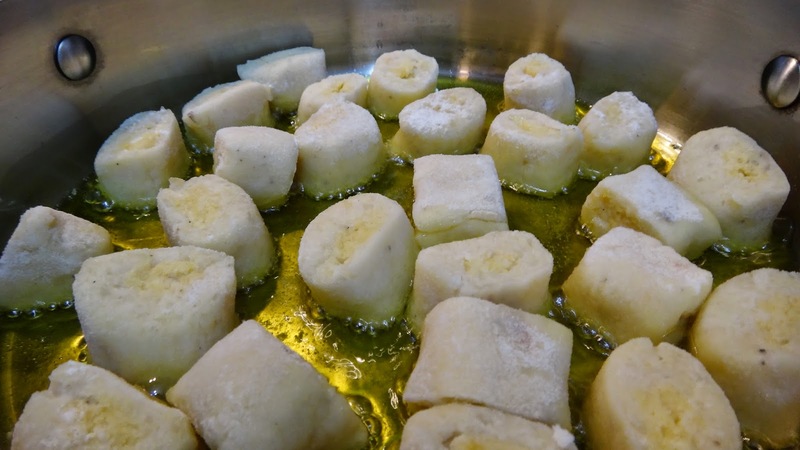 I shallow pan fried (oil goes halfway up the gnocchi. 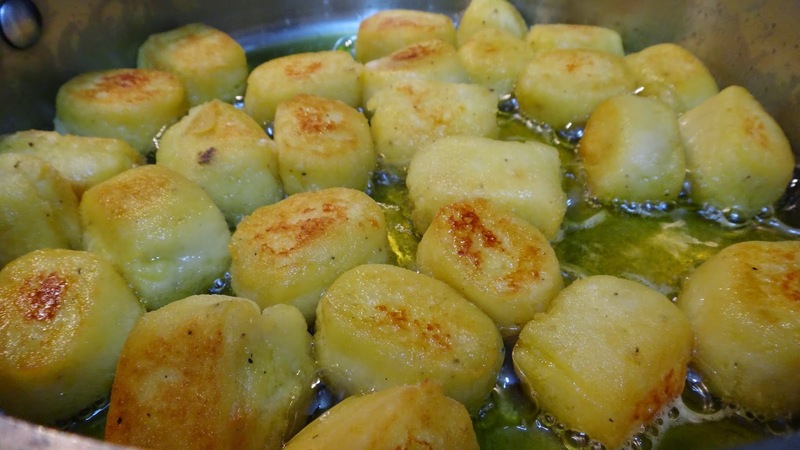 I cooked them in good olive oil (cause it is a delicious unrefined oil and yes you can fry with it ) If you have a deep fryer this method is easier because you don’t have to fiddle and turn but, both work fine. 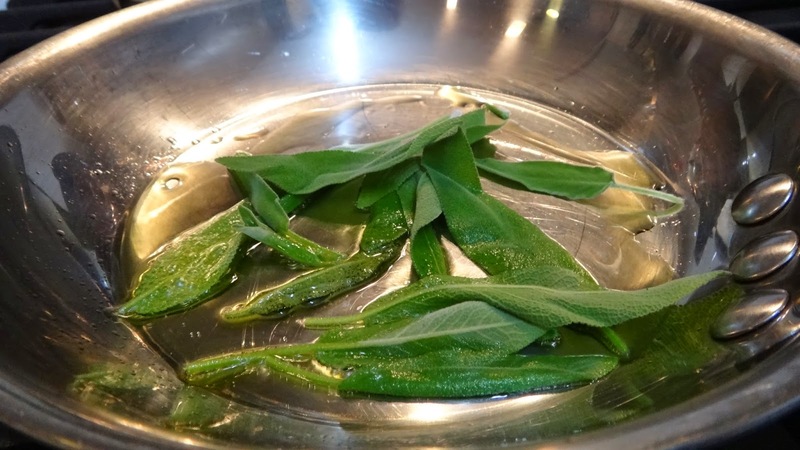 Quickly fry some sage leaves in a bit olive oil. Serve on a pretty plate or cutting board. 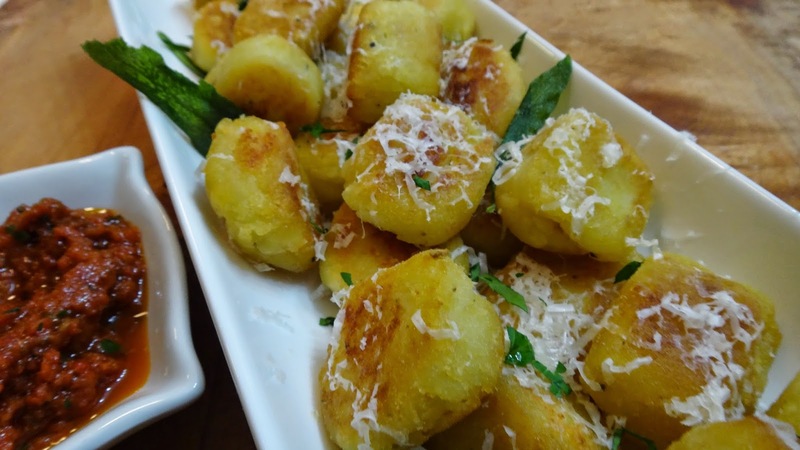 Sprinkle with a bit of salt, add some shaved Parmesan and decorate with some fried sage leaves. 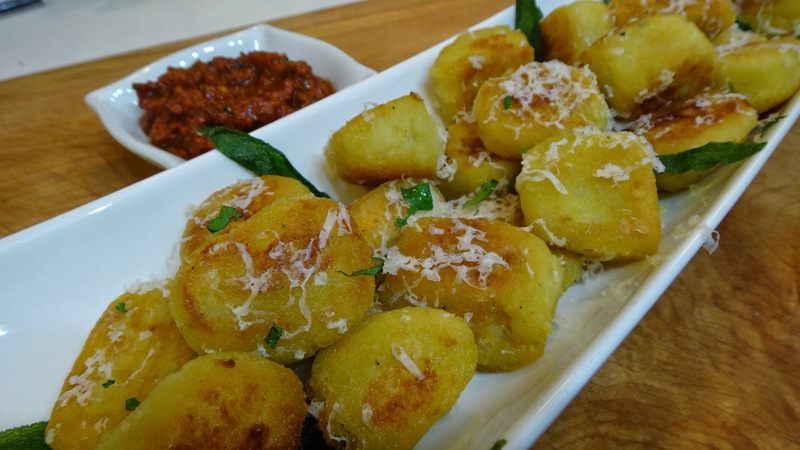 Dip or top the gnocchi with the sauce and prepare to be amazed! Big Pete went out of his mind!! told me I could make those anytime I liked!! Thank you Gennaro! !I love it. I ate some and froze the rest. 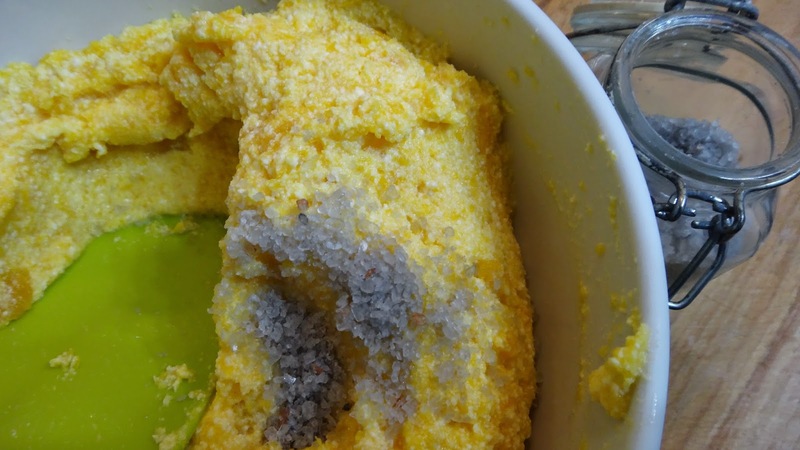 If you are cooking from frozen. 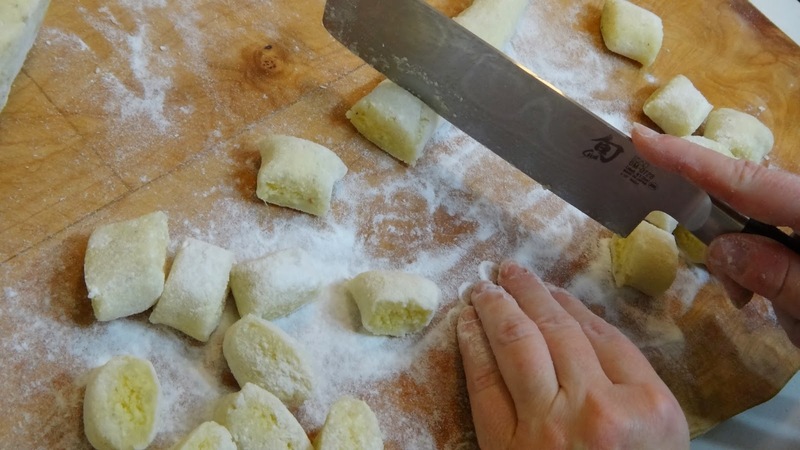 Take out gnocchi and let come to room temperature making sure they are separated to avoid sticking together before frying. Do not boil these they get heavy and are not gorgeous and fluffy. This is delicious combination of Ricotta cheese and butternut squash served simply with good olive oil, some pine nuts and fresh sage leaves. 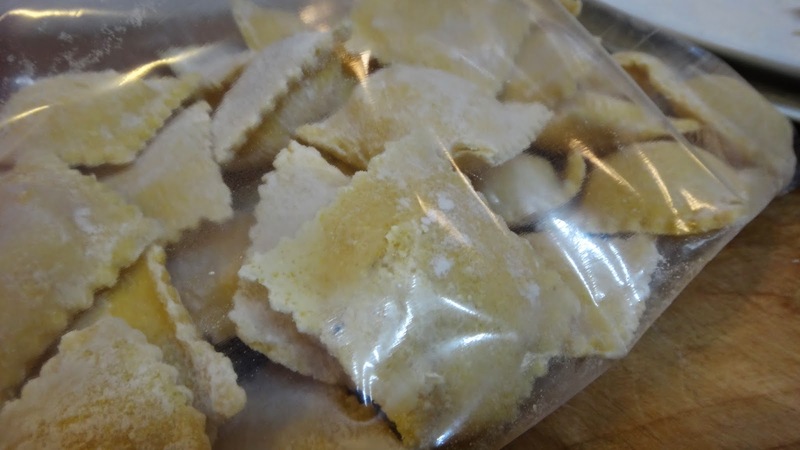 If you do not have a ravioli form these can easy be made with a cookie cutter or even a glass to cut the ravioli. 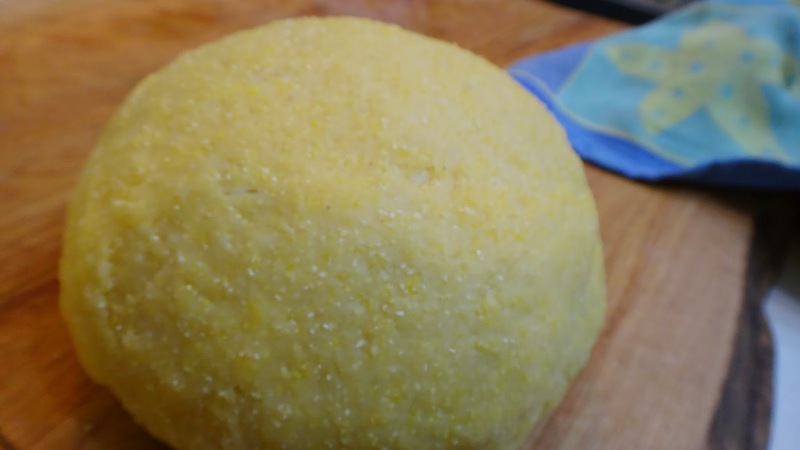 I have also added a bit of semolina to the dough to add some texture but you can make a smooth dough by using all flour and omitting the semolina or cornmeal. These can be frozen perfectly for a rainy day when you want something quick. 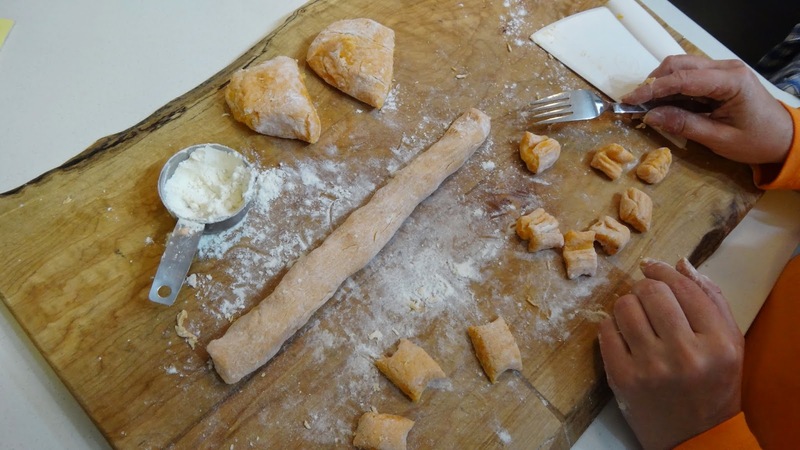 Step 1: Take a small butternut squash and slice into a few large pieces. 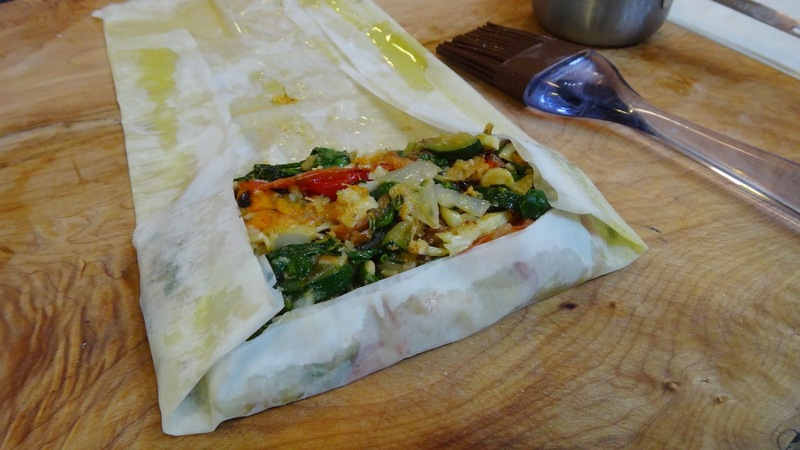 Add 1 tbsp olive oil and cover with foil. 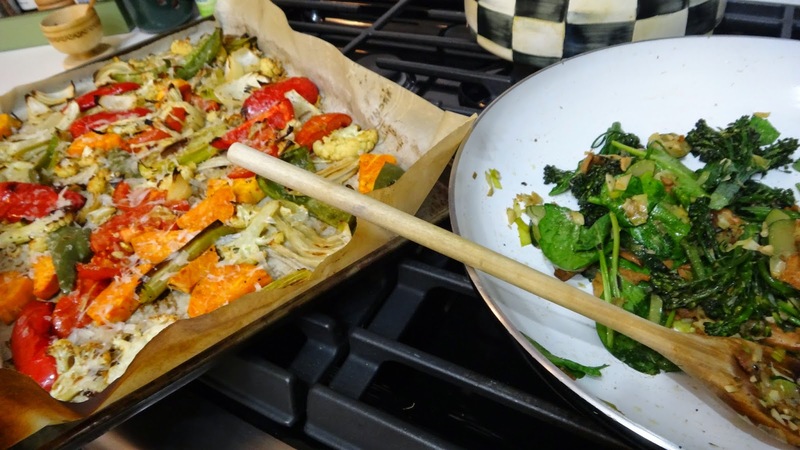 Roast at 375 degrees F for 45 minutes – 1 hour depending on the size of the squash. 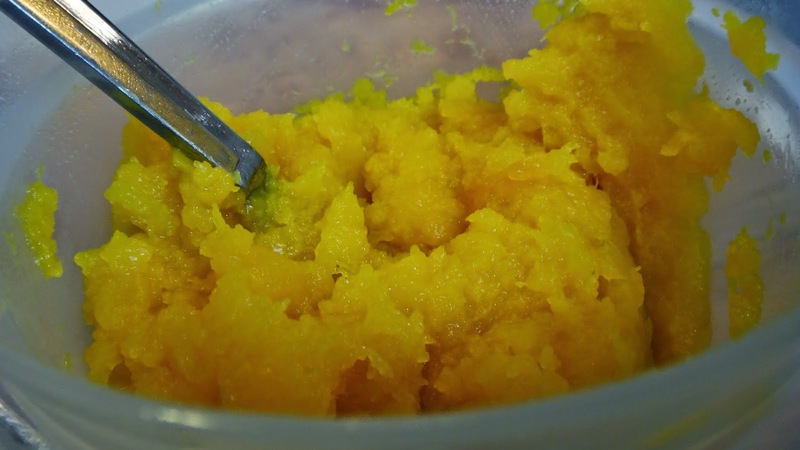 You want the squash to be very soft once cooked. I don’t remove seeds or skin until the squash is cooked. I scoop out seeds (which you can roast and salt) and then scoop out the very soft flesh. I discard the skin. 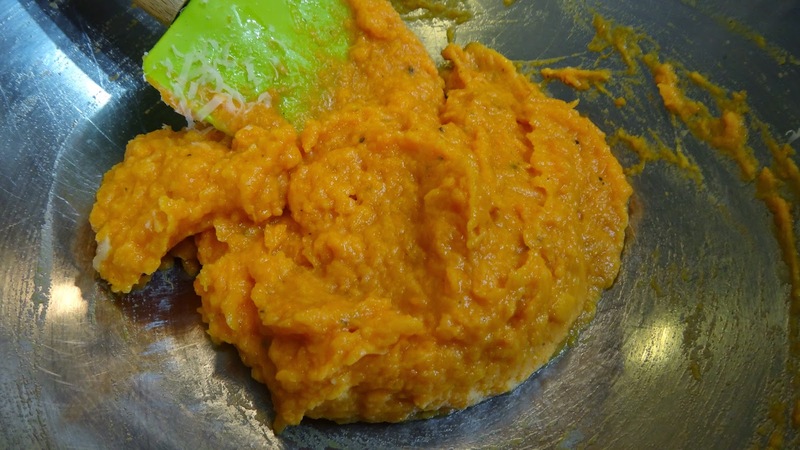 Step 2: in a small bowl add the squash and puree easily with a fork. 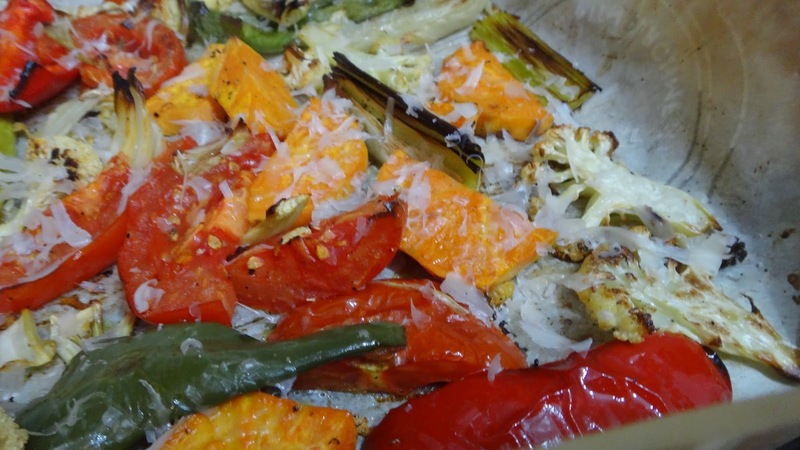 You do not want the squash too wet so roasting is better than boiling it. If you find the squash very wet you can press in a paper towel or clean tea towel. 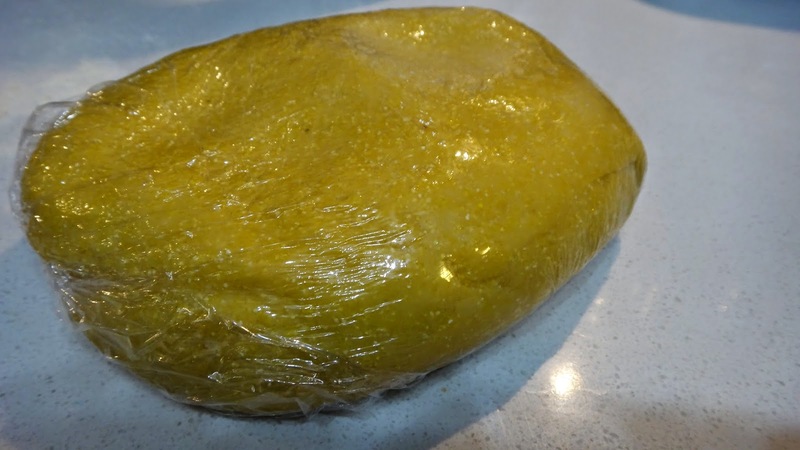 You are looking for an end product that is like a thick paste. Step 4: add a few scrapes of fresh nutmeg. 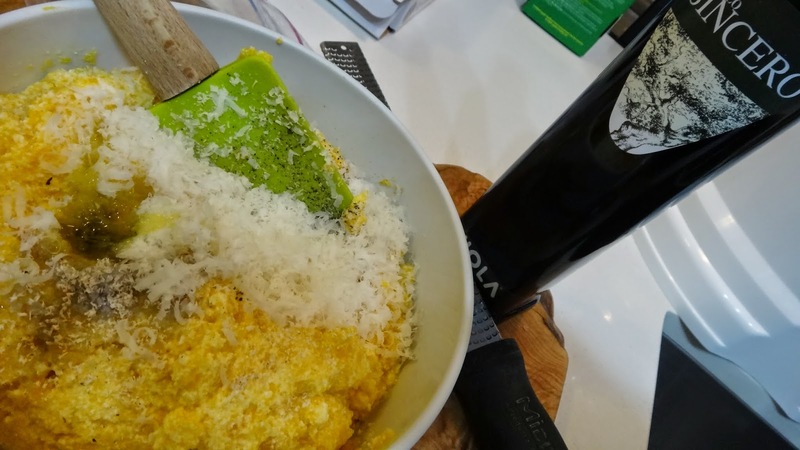 Step 5: add the ricotta cheese and grated Parmesan cheese. 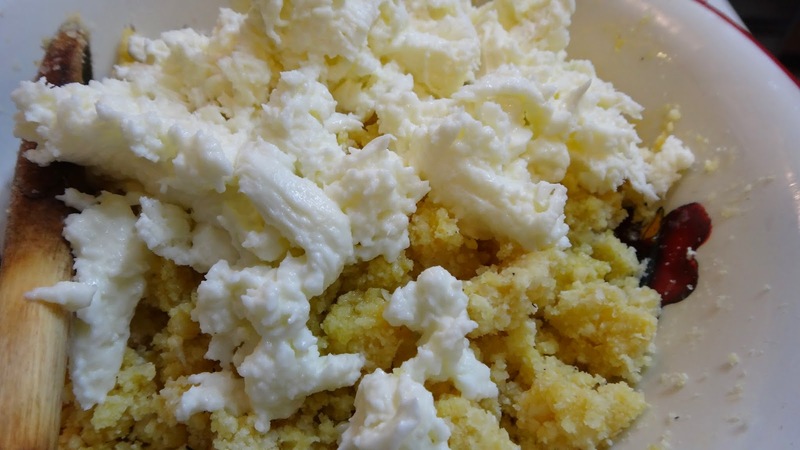 If your ricotta is very wet you can drain it for 1 hour in a sieve or press in a cloth/ or paper towel to remove most of the water. The squash has water in it and you do not want the filling too wet. You can also add more cheese! Step 6: add about a tbsp of chopped sage leaves. Put in fridge while you make the pasta. Step 7: add the pasta ingredients into a food processor. 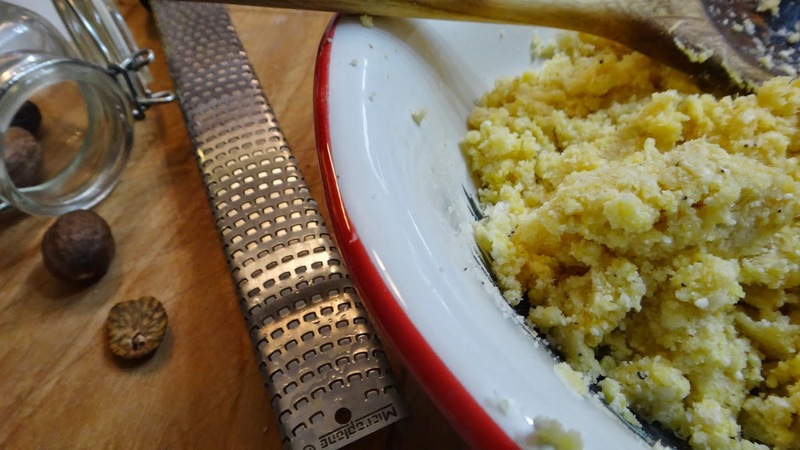 You can add the semolina or omit it entirely. 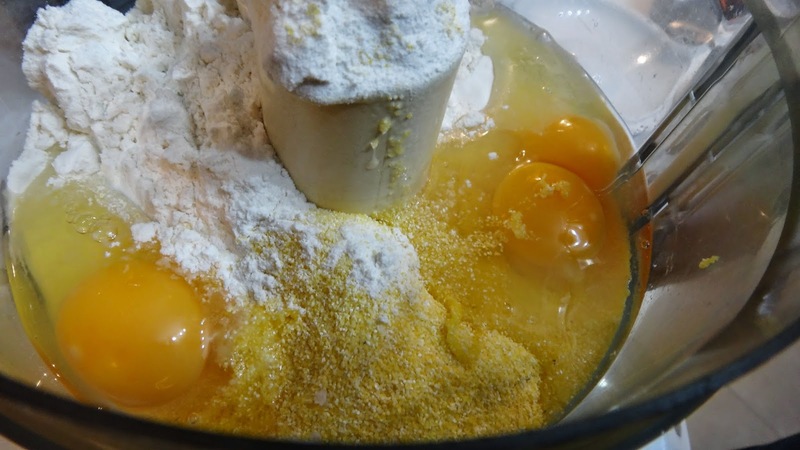 If you omit it add the 1/4 cup equivalent in flour to the recipe. 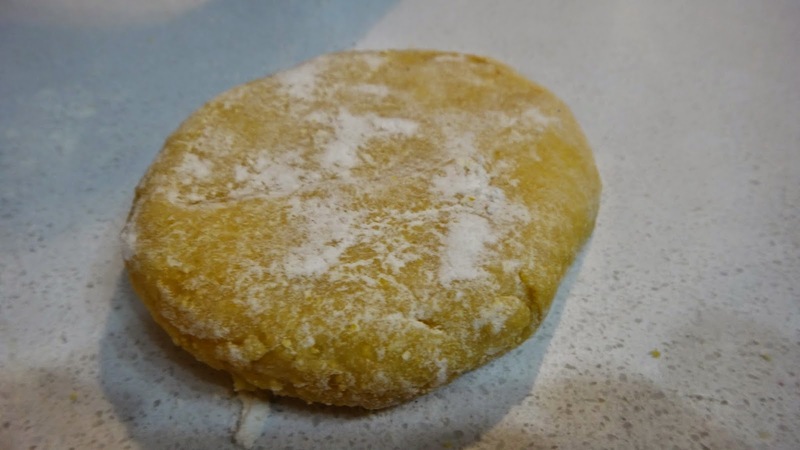 The “all flour” dough is a much smoother, fine dough. Step 9: take ball out of processor and with a bit of flour form a nice smooth ball. 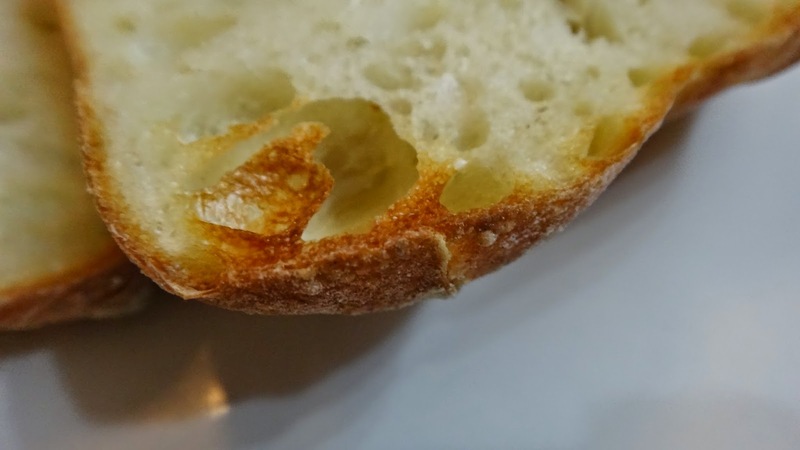 Knead it for a minute or two to get a nice smooth ball. 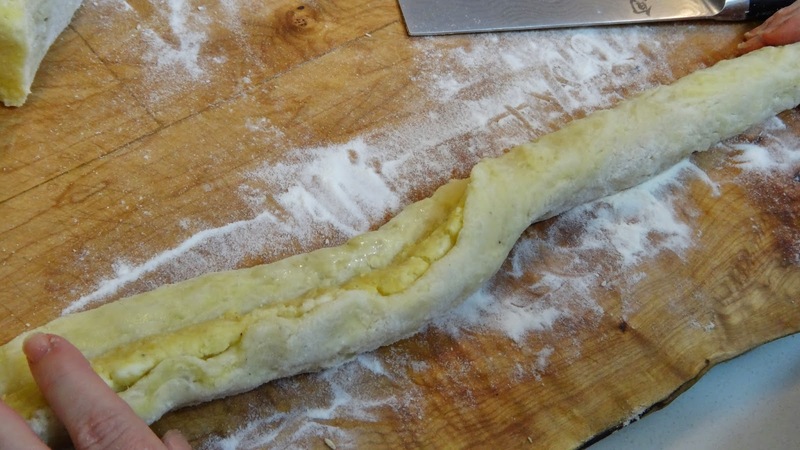 Step 10: wrap the dough and let rest in the fridge for 30 minutes. Step 11: remove from fridge and cut ball in half and then each piece into 4 = 8 even pieces. I run the dough through a few settings. 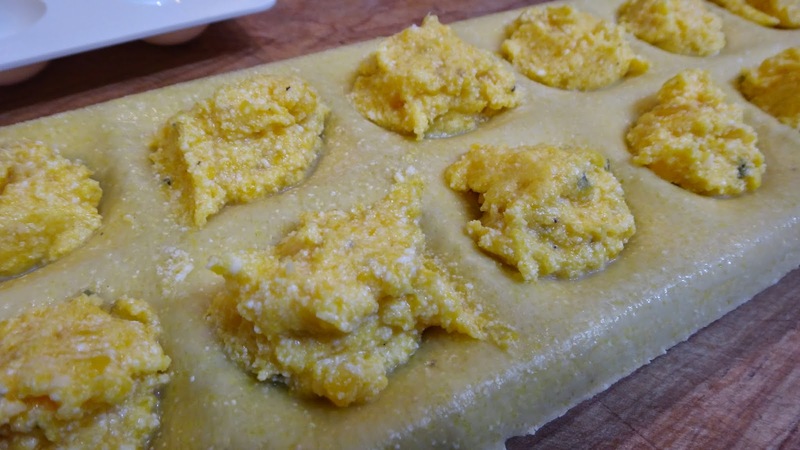 You do not want it too thin or the filling will break open when cooking the ravioli. 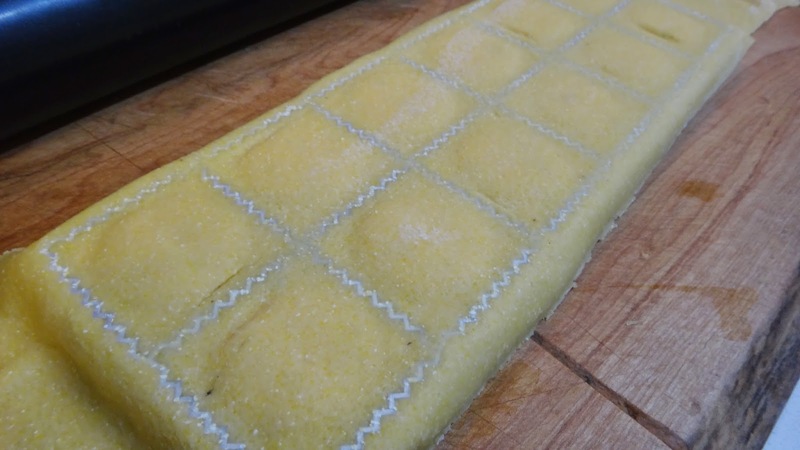 Step 13: roll out 2 sheets and place one on the bottom of a generously floured ravioli form (I just got this one and I love it!) 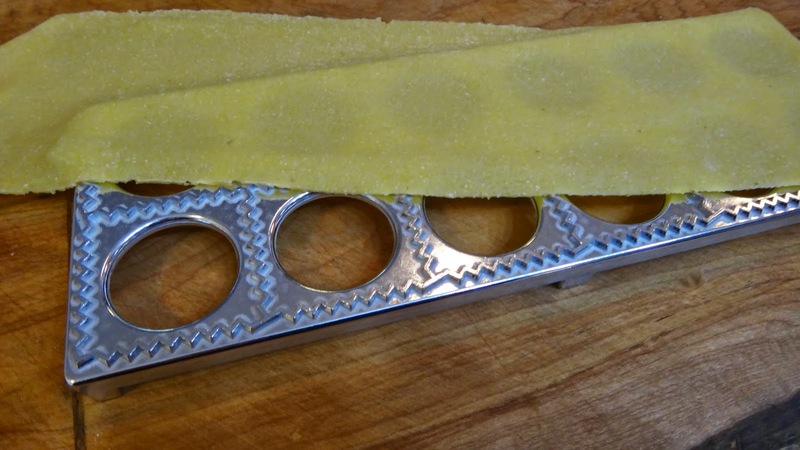 I used to make them by placing one sheet on the bottom and placing spoonfuls in the same kind of order then placing the next sheet on top and pressing in between and either cut with a knife to make squares or use a small glass to form round ravioli. 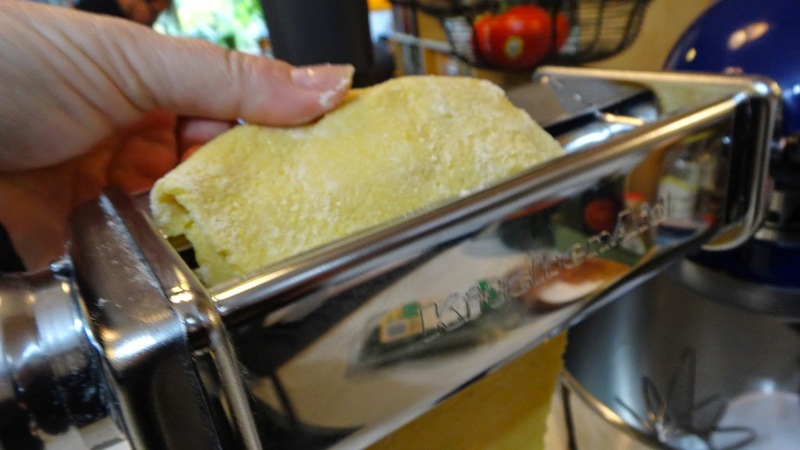 This press has a need form to make the ravioli. Step 14: add a teaspoon of filling to each hole. I add a bit of water around each by dipping my finger in a glass of water. 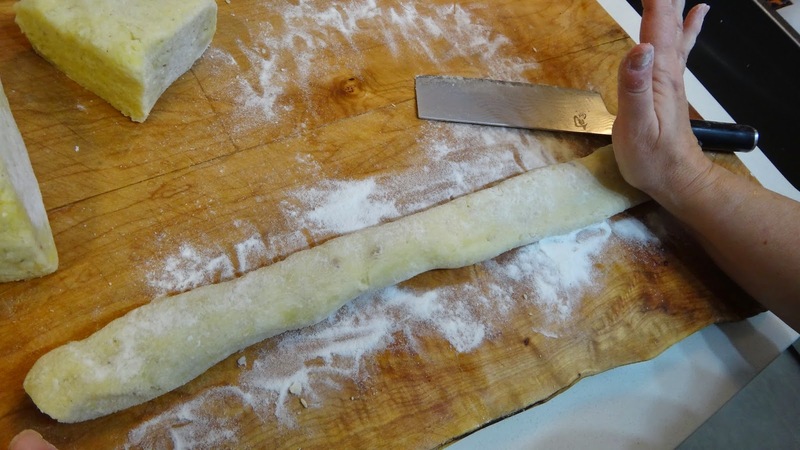 Step 15: place top sheet on ravioli and take a rolling pin to seal and cut each. I love the open bottom to this mold so you get nice fat ravioli. 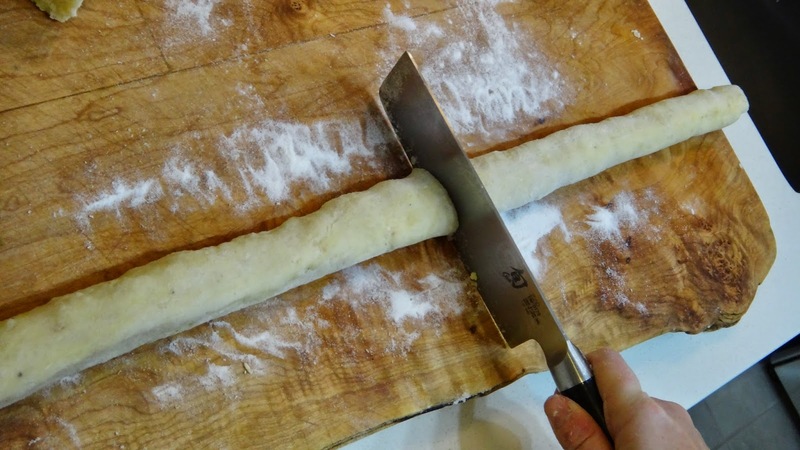 Remove excess dough around edges. 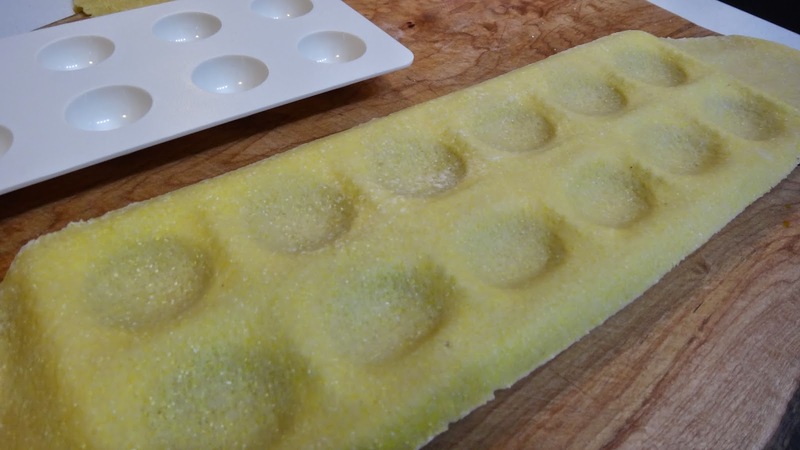 Flip mold and knock on counter for ravioli to release from mold. Step 16: toss in lots of flour and place on a plate or sheet to be frozen individually. Do not let them touch while freezing. Step 17: once frozen put them in a Ziploc bag. They can be removed and boiled frozen right from the bag when you want to cook them. 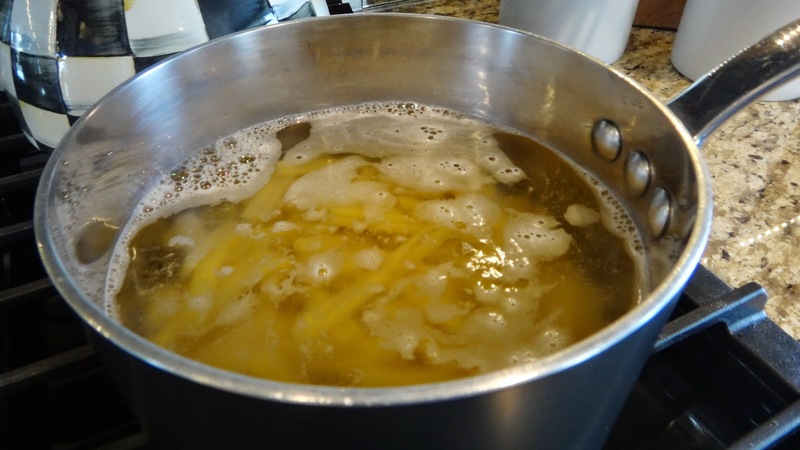 Step 1: to cook: boil a few ravioli in salted water at a rolling boil. Wait until they float to the top and cook 1 minute. 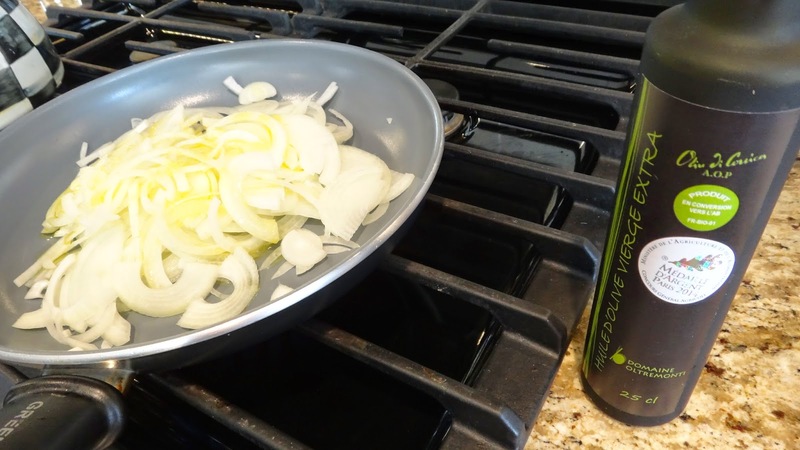 In a saute pan add a few tbsp of extra virgin olive oil. 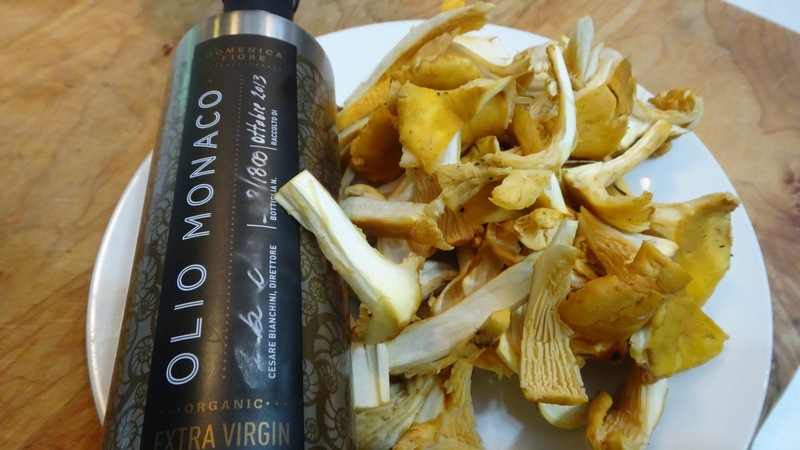 I used a lovely Tuscan variety called Viola Sincero which is a Moraiolo oil that is a nice medium oil with a nice peppery finish. 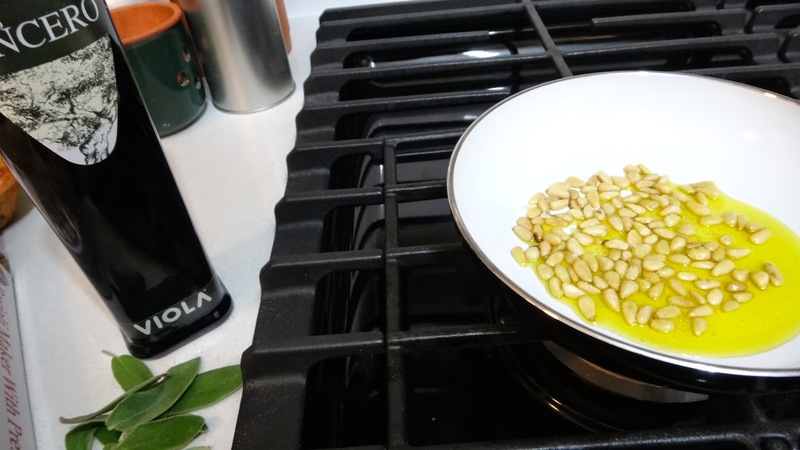 Step 2: add some buttery pine nuts and toast for a minute or two until just starting to brown. I keep the pine nuts in the freezer since nuts go rancid easily if left out. 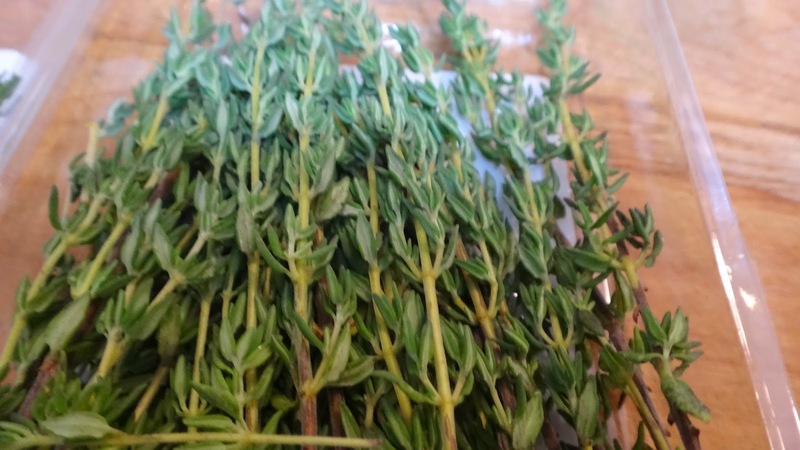 Add some fresh sage leaves. They will fry and get nicely crisp. Cook 1 minute. 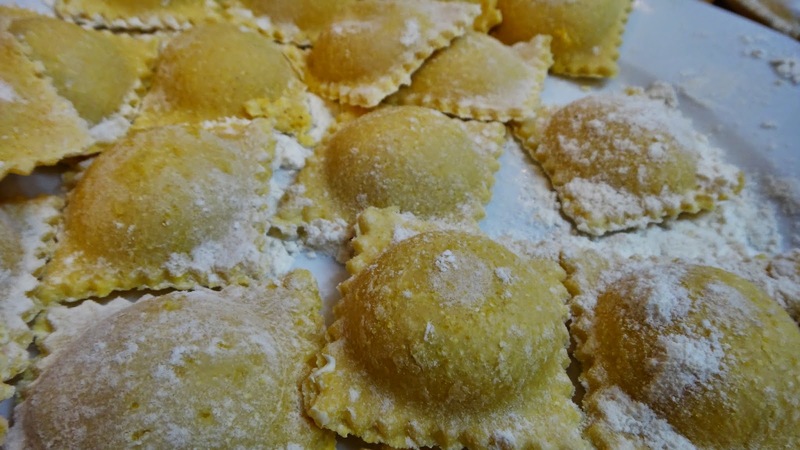 Step 3: add your cooked ravioli to the pan and cook another minute. 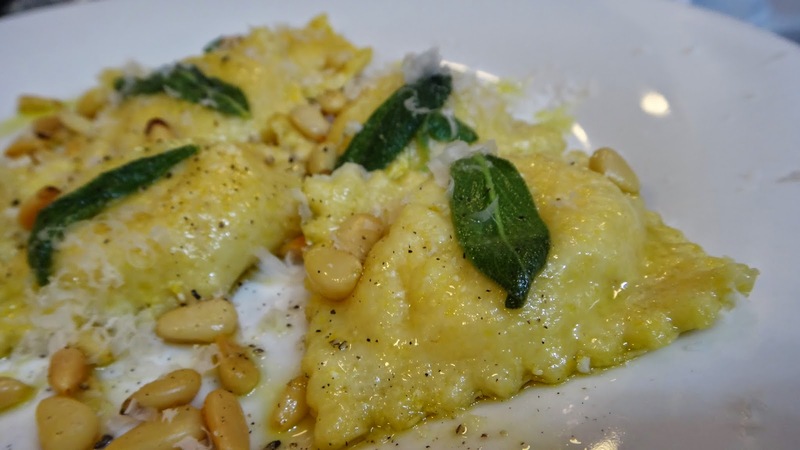 Serve with a generous shaving of Parmesan or Pecorino and don’t forget the salt and pepper! 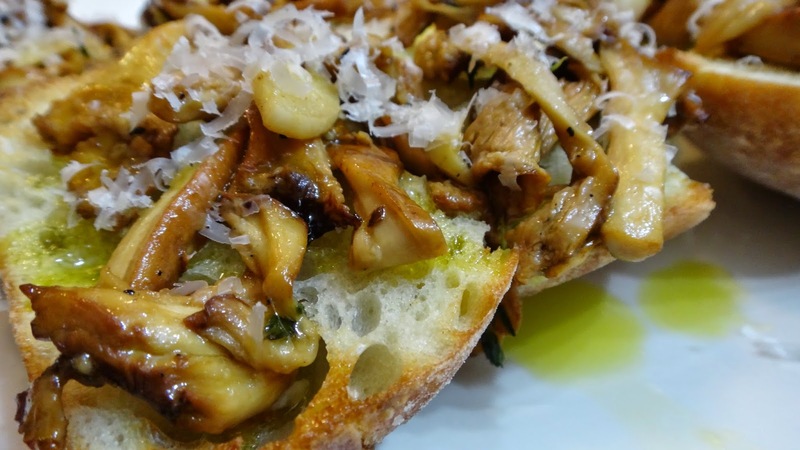 When you have access to some beautiful mushrooms like my favorite chanterelles mushrooms, you must try a simple bruschetta like this one. Some beautiful mushrooms, some good olive oil, garlic and crusty bread and a glass of wine to start your next dinner! You know you want to cook this! 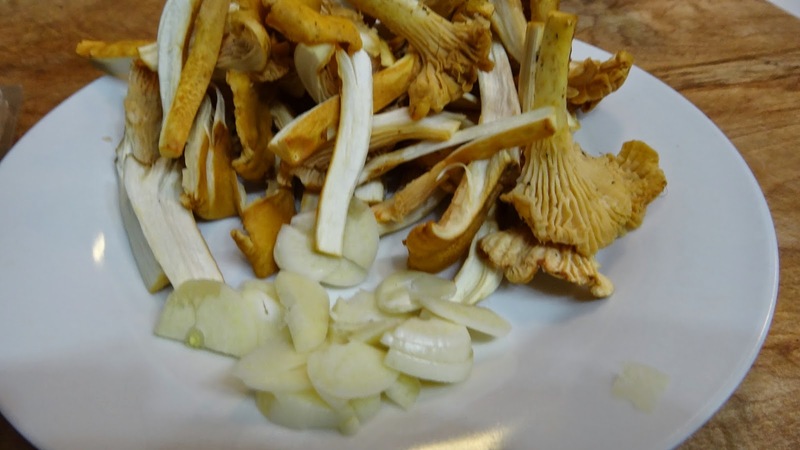 a pkg or pile of Mushrooms- mine are chanterelles mushrooms expensive but worth it! 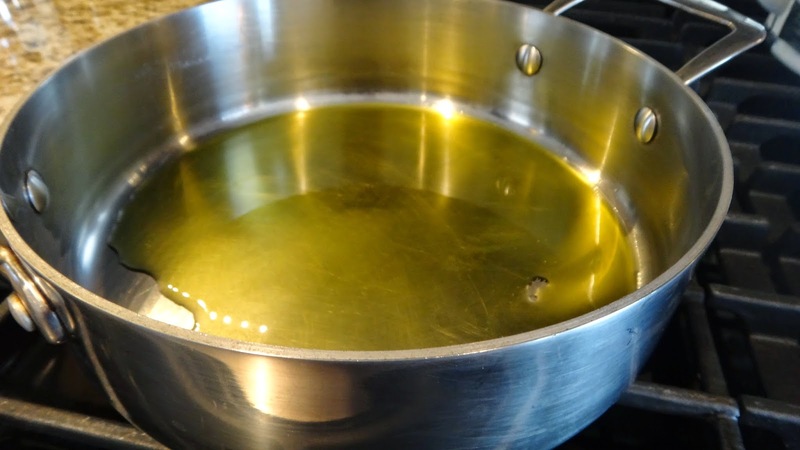 Step 1: Look at that pretty oil!! 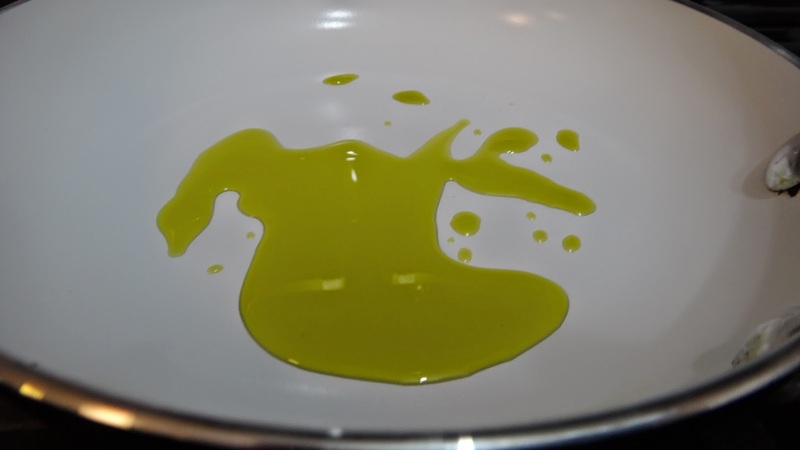 Add a few tbsp of best quality of extra virgin olive oil in a small pan. Add some sliced garlic and a sprinkle of salt and pepper. 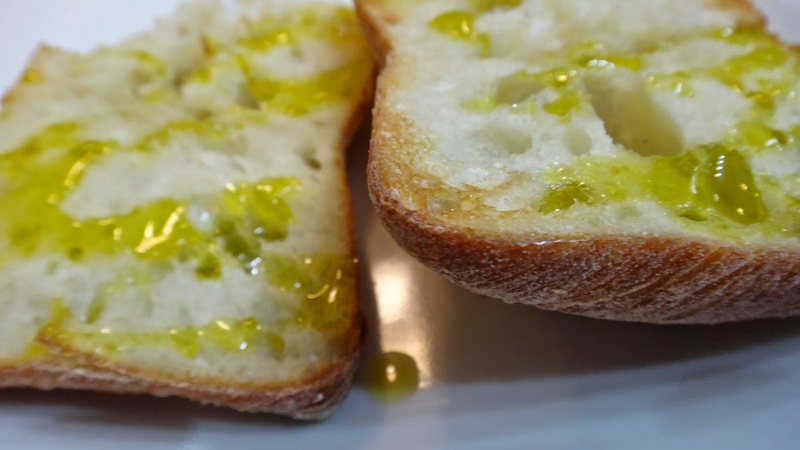 You could also add a tbsp of butter if you like but, I honestly love the olive oil on it’s own. 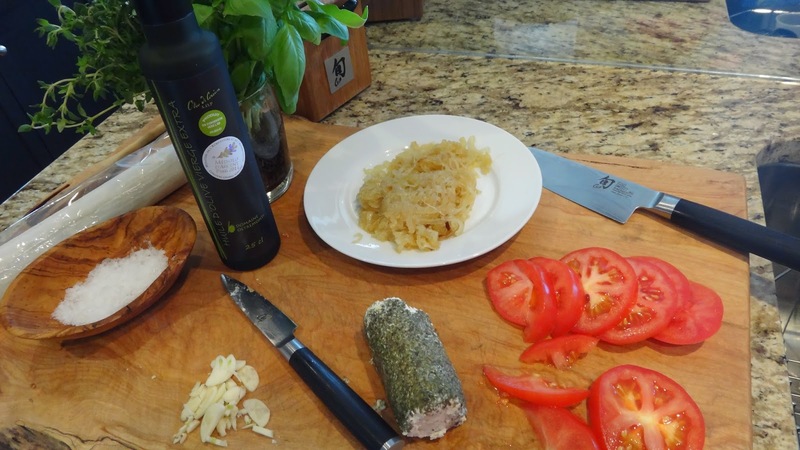 This is a peppery robust oil perfect for this dish. 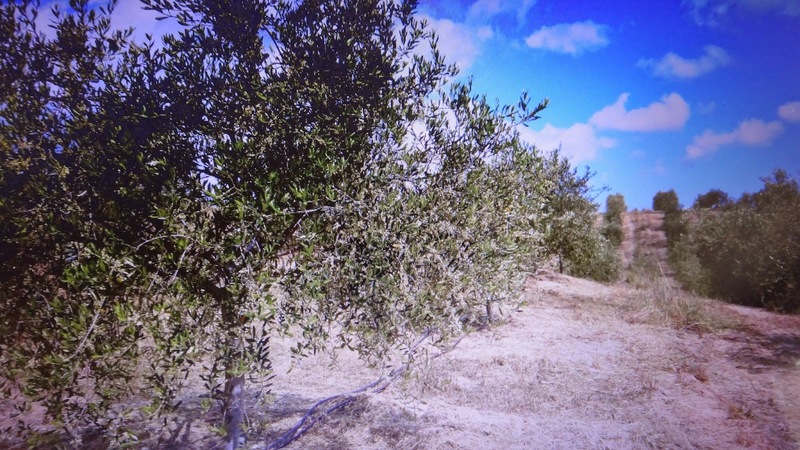 I used Domenica Fiore from Orvieto in Italy. Cook on medium heat for 2-3 minutes. 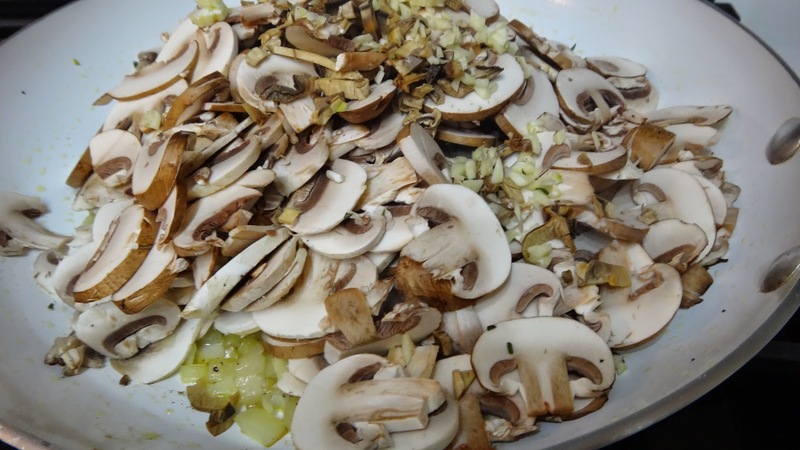 Step 2: I brush the mushrooms to clean off any dirt and simply tear into pieces. 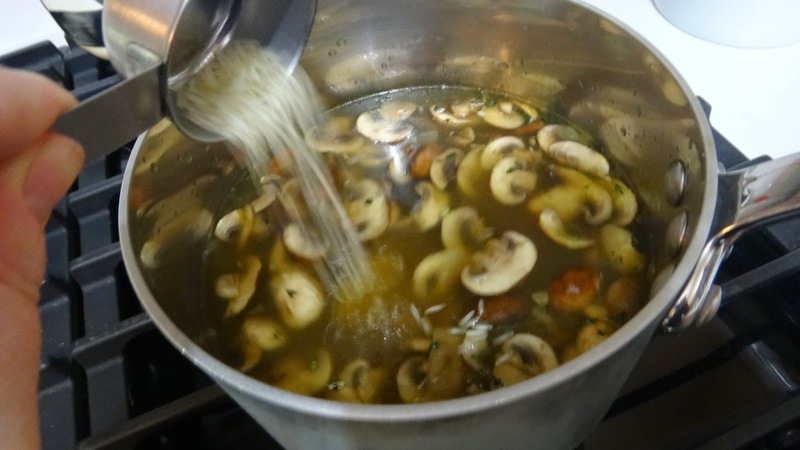 Step 3: add the mushrooms to the hot oil and strip a few sprigs of thyme and add to the mushrooms. Add a bit more salt and pepper if necessary. You need to taste the mix. I cook for a few minutes and then remove from the heat. 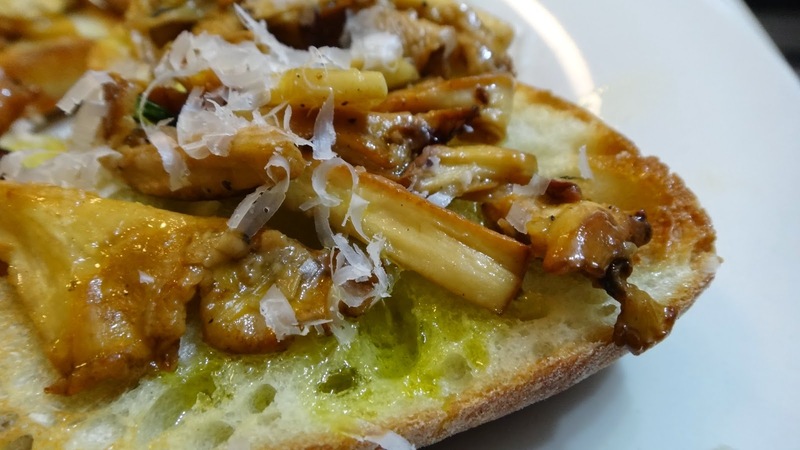 Step 4: toast some hearty bread, rub the top of each piece with a raw peeled garlic clove. Just a few scrapes back and forth should do it. 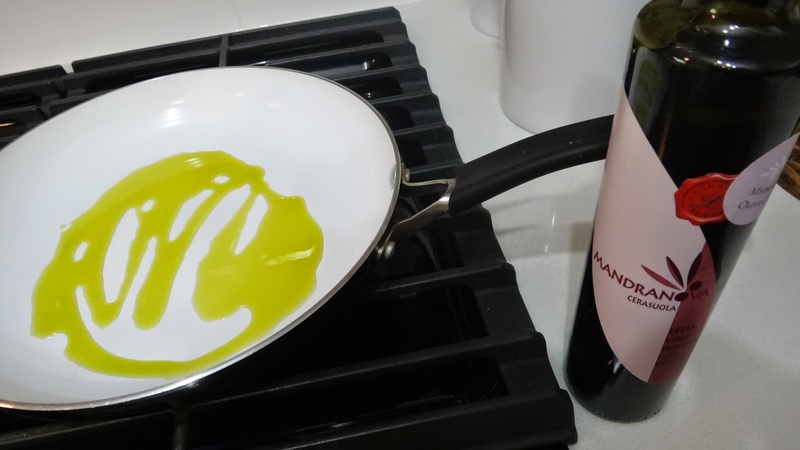 Pour on some more olive oil. When I open up the fridge and look at my ingredients I often see a couple of ideas at the same time. This is a good example of using almost the same ingredients two different ways. 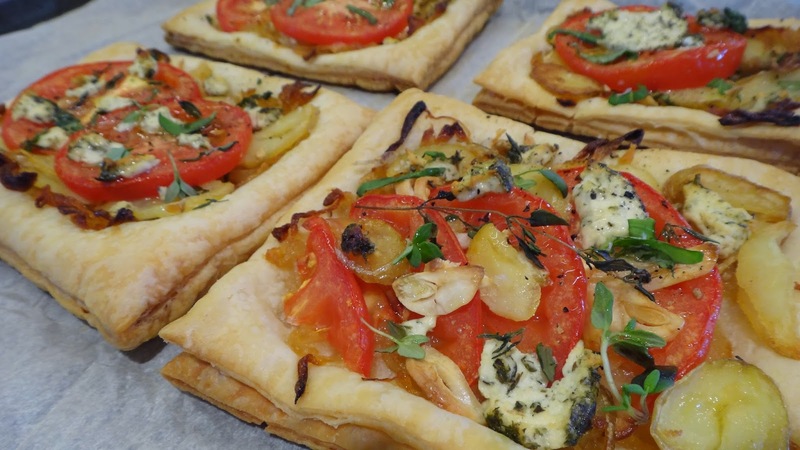 I have made some vegetable and goat cheese tarts on puff pastry and also a potato salad which could also be served with puff pastry that is cut into strips and twisted like a bread stick. 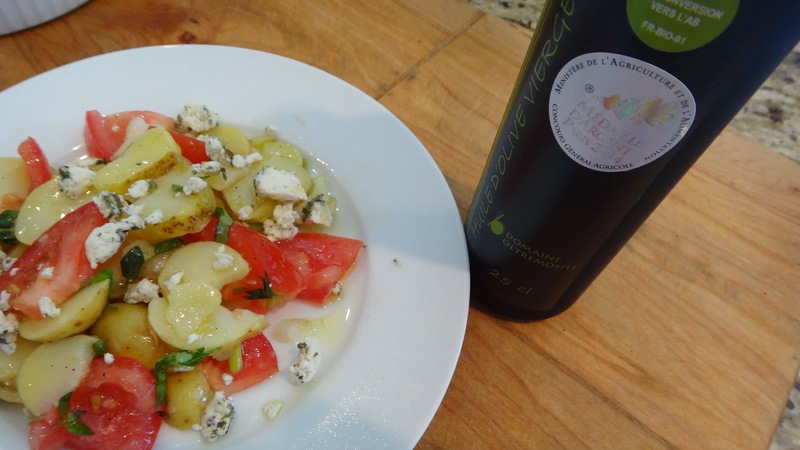 I have used a beautiful extra virgin olive oil from Corsica as a perfect compliment. 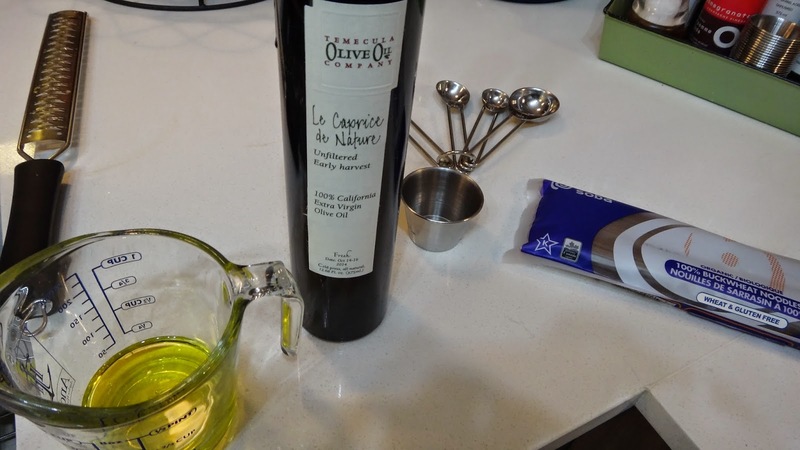 This organic oil is produced by my new friend Emilie. 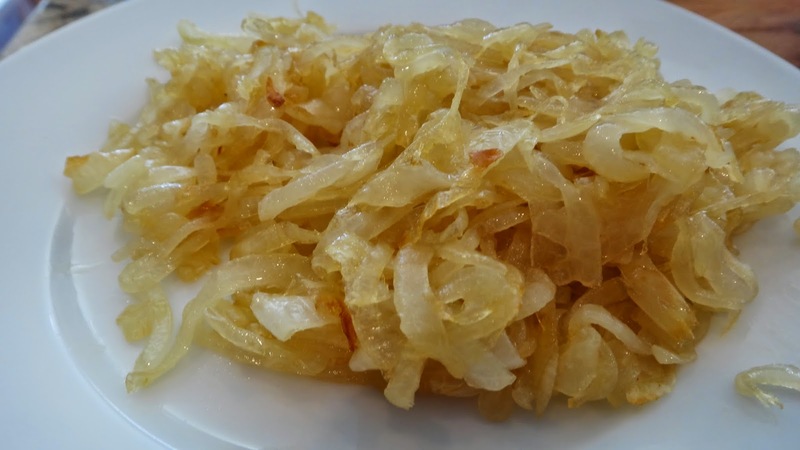 It is a mild, fruity oil with the faintest bit of pungency at the end. Beautiful! 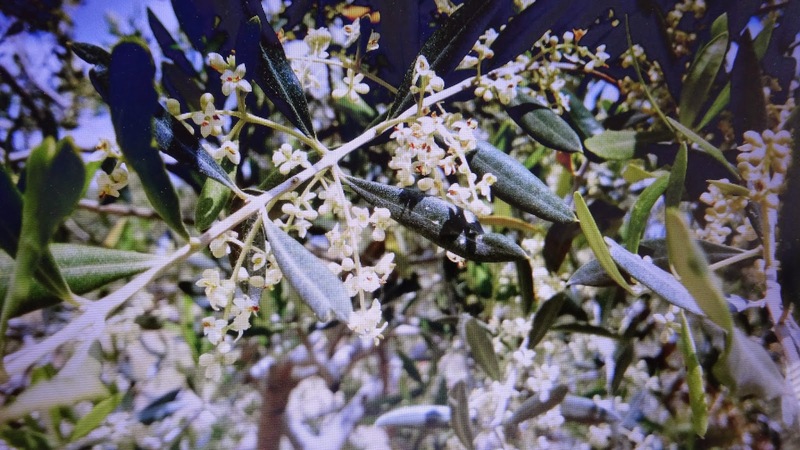 These are the olive blooms and trees from Domaine Oltremonti Olive Groves in Corsica, France. 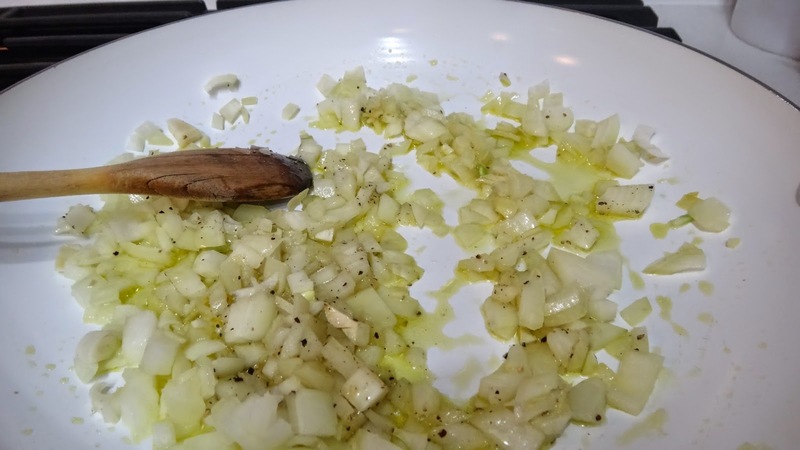 Step 1: slice and cook onions in some exceptional extra virgin olive oil like a mild and fruity Domaine Oltremonti…..
and a splash of good quality apple cider vinegar. 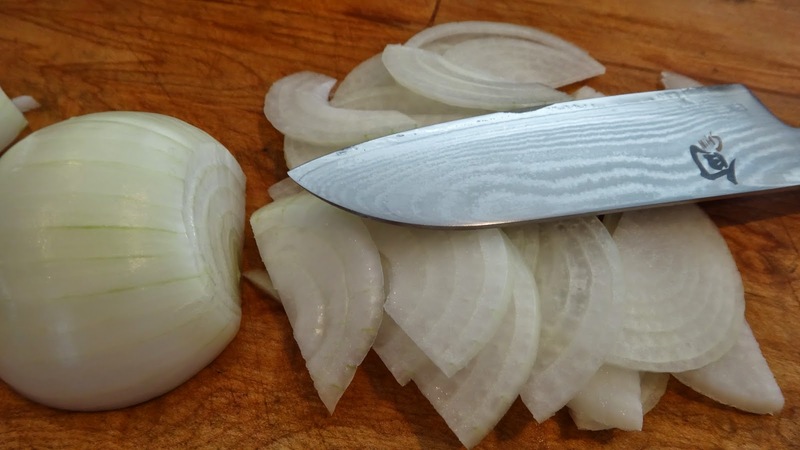 I cook on medium heat, stirring often for approx 20-25 minutes to get nice lightly carmelized onions. Set aside. 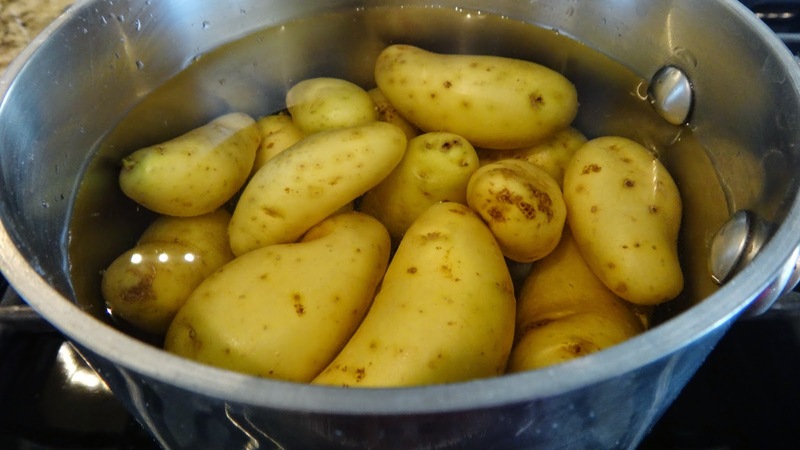 Step 2: boil some new potatoes until cooked and tender. A waxy potato works best here. 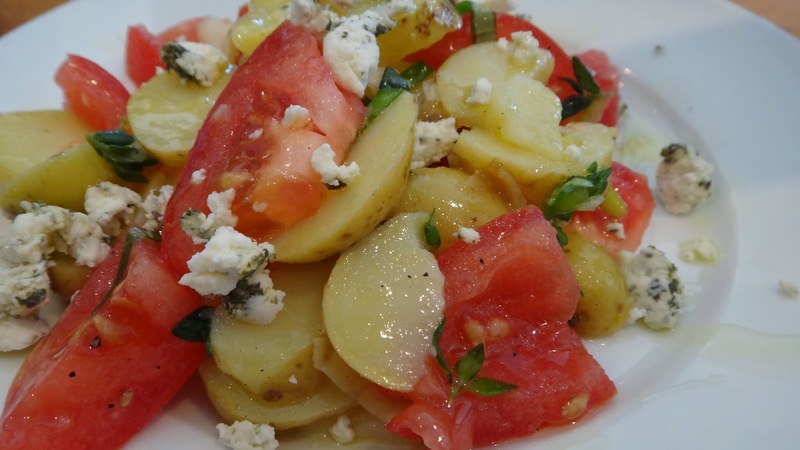 Step 3: gather all your ingredients, slice potatoes, garlic and slice tomatoes. 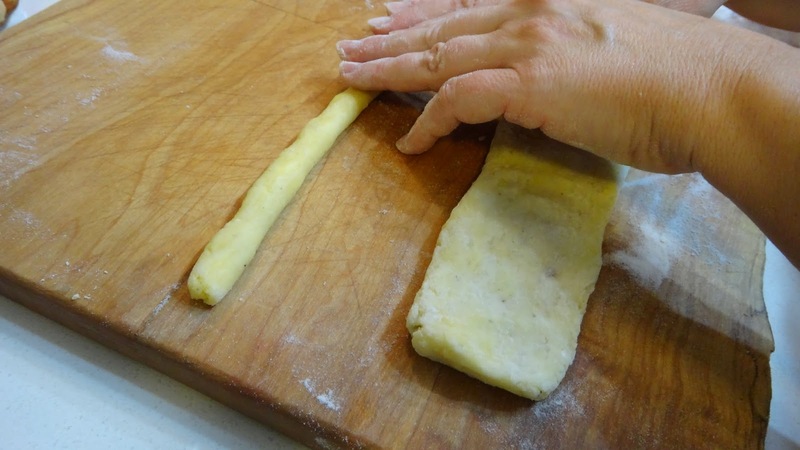 Step 4: slice the store bought puff pastry into 4 pieces or cut out circles if you prefer. Layer your ingredients in any way you like. 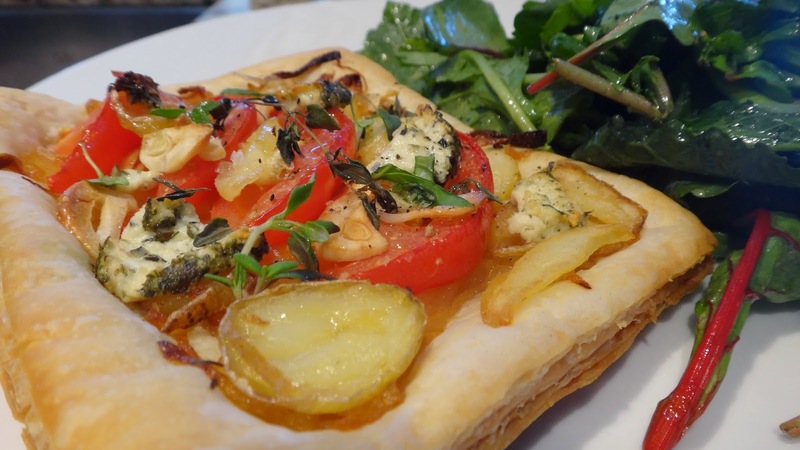 If you like lots of goat cheese, smear on a layer directly on pastry, layer potatoes, tomatoes, a sprinkle of thyme, a few garlic slices, top with salt and pepper and bake in a 375 oven until puffed and browned. Layer them all the same or completely different. 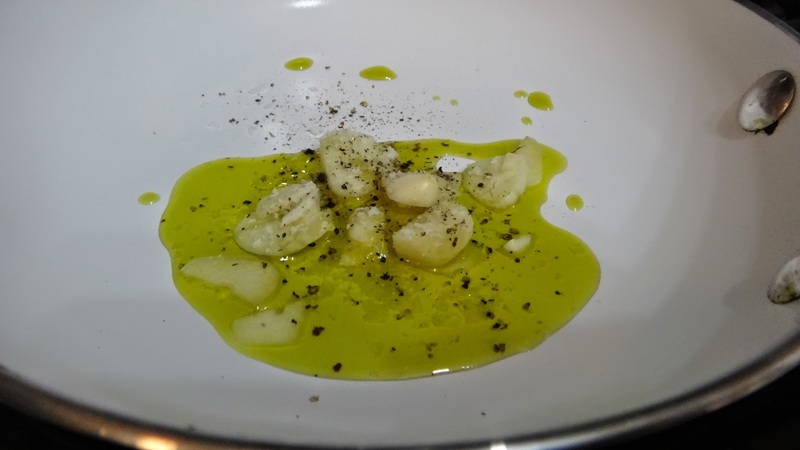 Once they come out add another drizzle of beautiful olive oil and perhaps a sprinkle of salt and pepper. 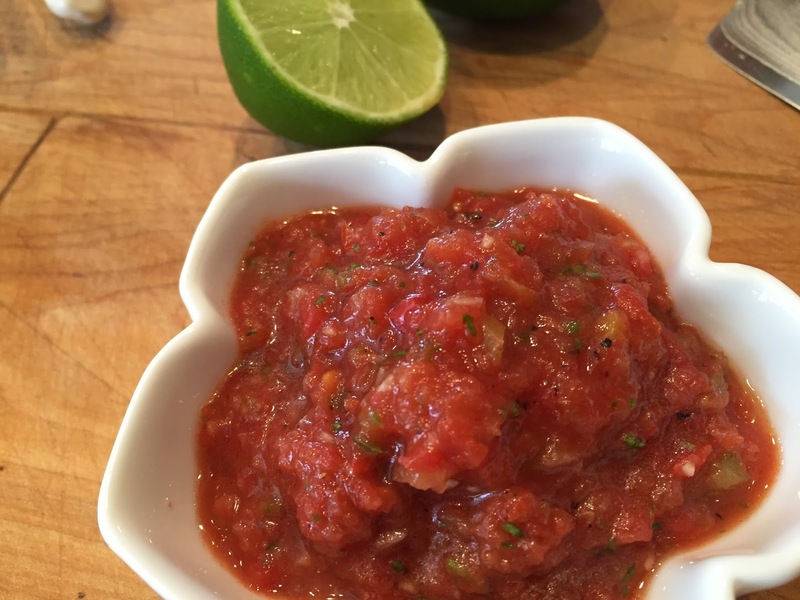 serve with a green salad and you have a nice appetizer or lunch. 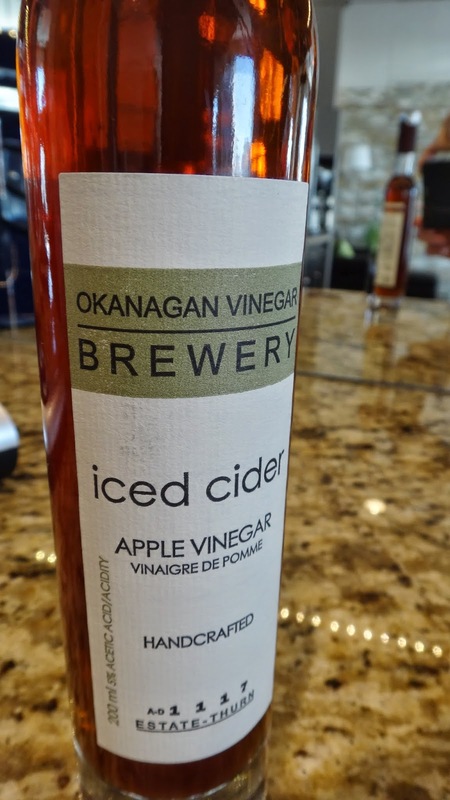 Take the same ingredients and create a delicate potato salad with oil and apple cider vinegar dressing. 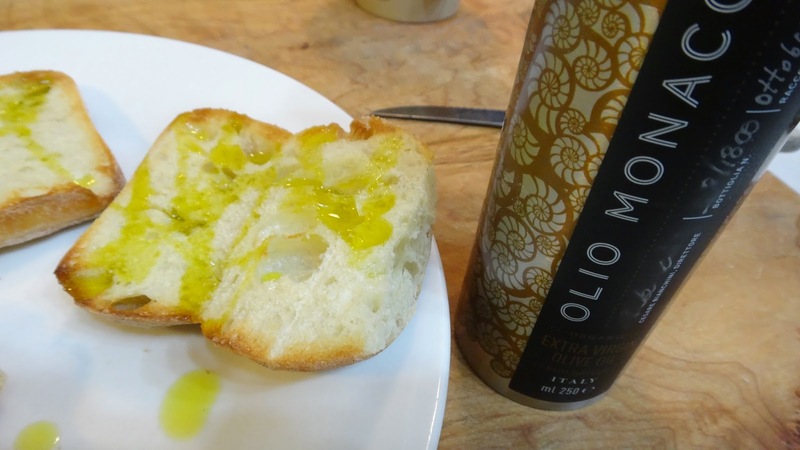 If you have a beautiful bottle of extra virgin olive oil USE IT!!! 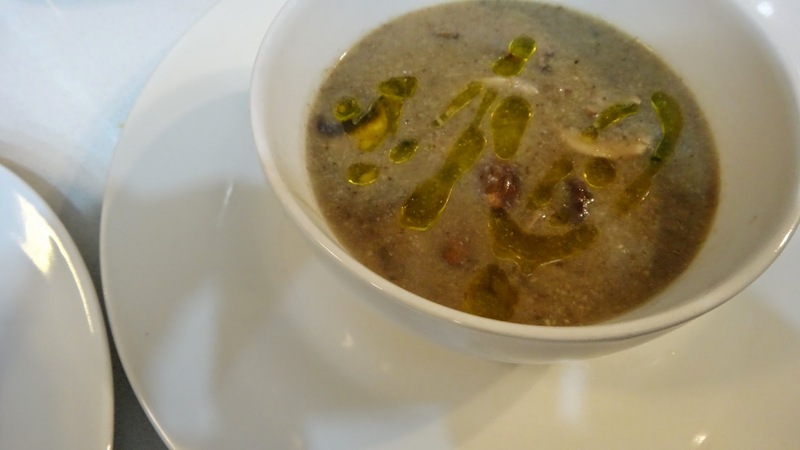 It is best used when fresh don’t save it and have it go rancid….use it lavishly and enjoy it everyday. 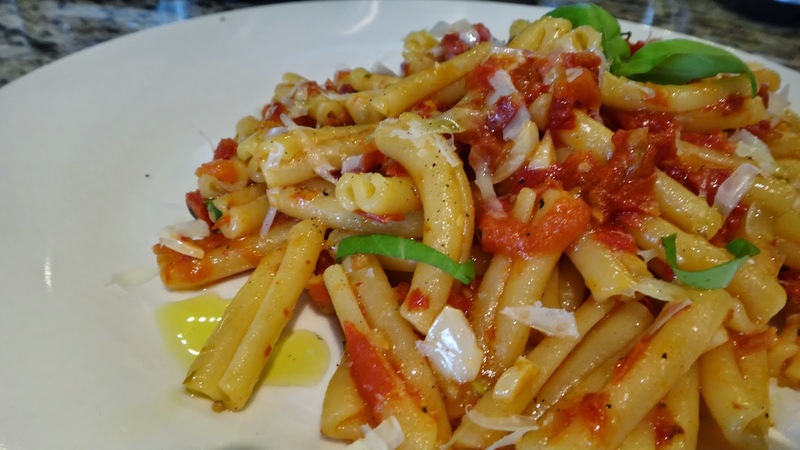 “Butta la pasta!” is an expression in Italian which means throw in the pasta. This was what the farmer would yell from the field on his way in. 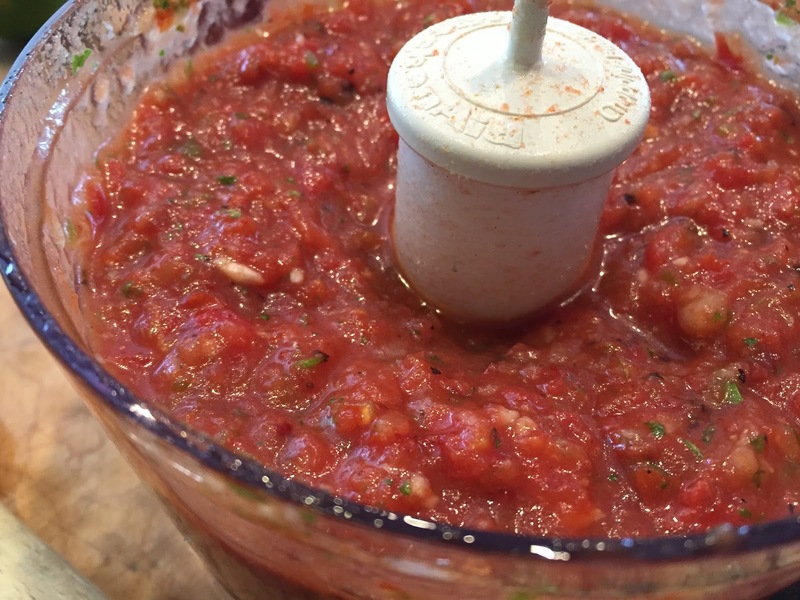 I like to say this for the simplest, fastest pasta sauces like this one. In the time it takes to make the sauce the pasta is cooked!! 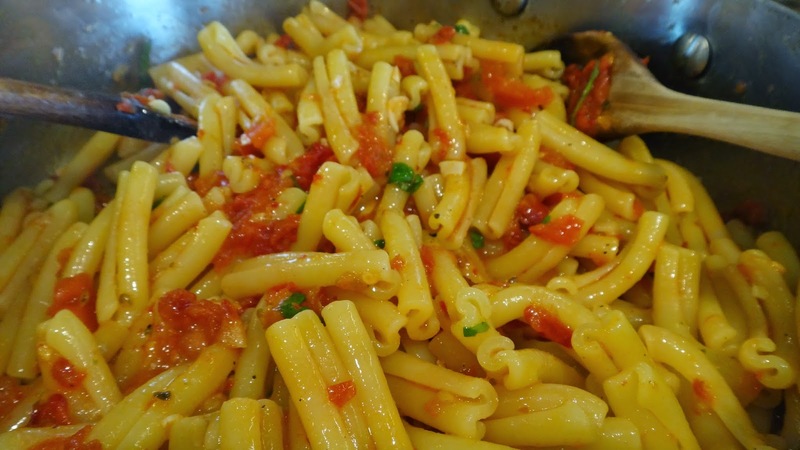 This is a variation on a typical pasta with a simple pomodoro (tomato) sauce. 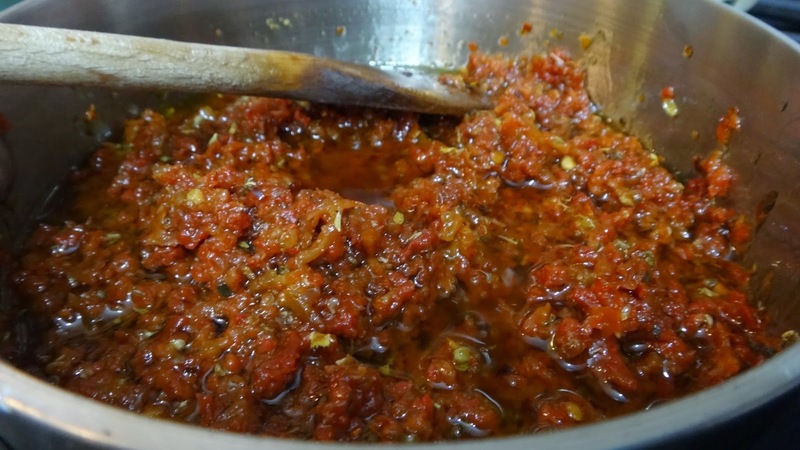 I have taken a combination of sun dried tomatoes, fresh tomatoes, garlic, chili flakes, fresh basil and great extra virgin olive oil to create a fast dinner. 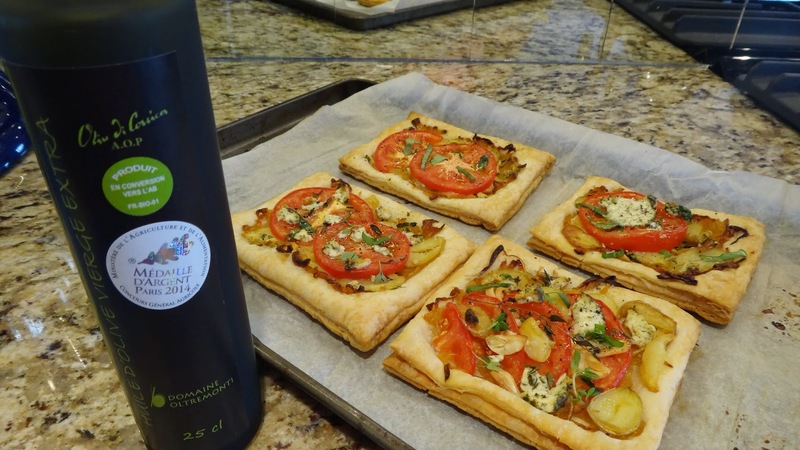 You can add a drizzle of aged balsamic vinegar and a sprinkle of Parmesano Reggiano to finish this classic. 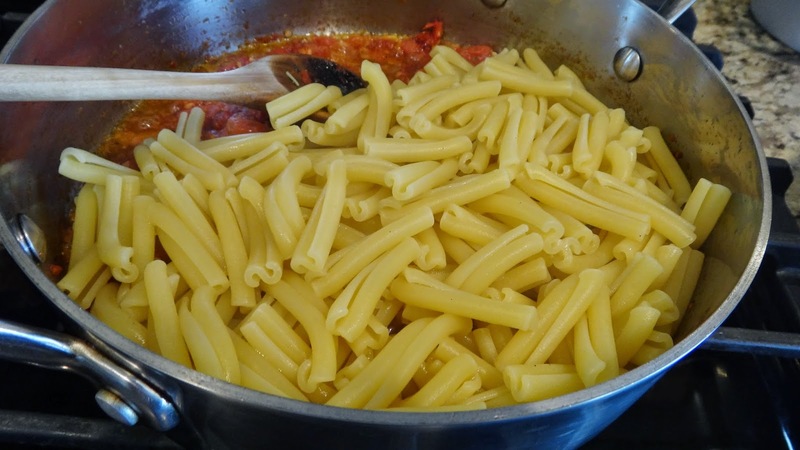 You can also use a penne or spaghetti pasta if you prefer but, try this. 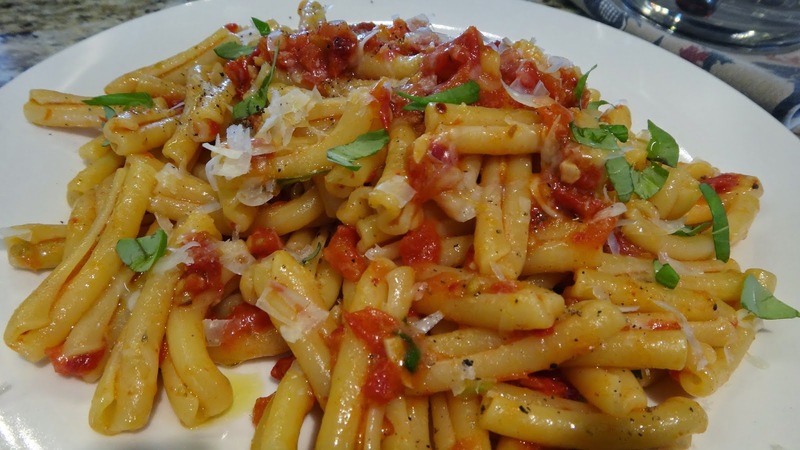 The sun dried tomatoes add another layer of flavour and the olive oil creates a simple glorious sauce. 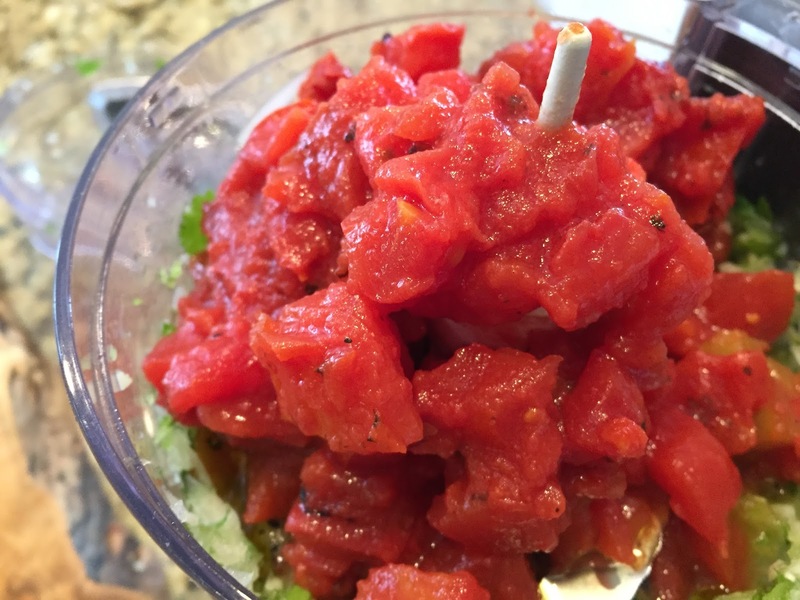 Step 2: chop your fresh tomatoes – you want them to have a lot of water content because this will create your simple sauce. 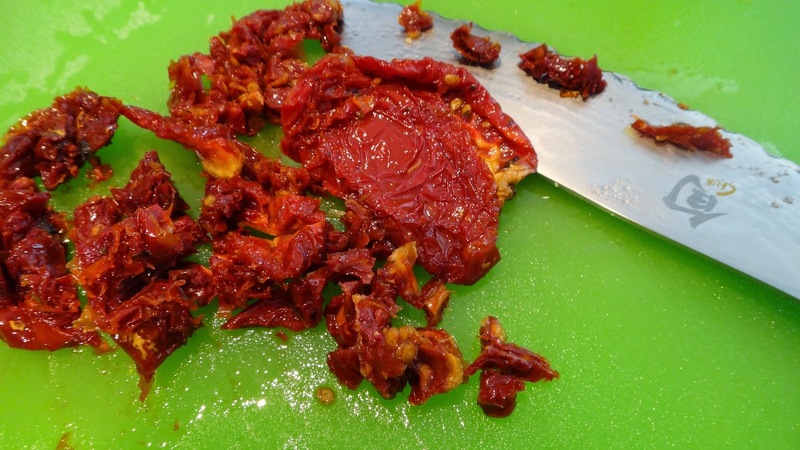 Step 3: chop your sun dried tomatoes and garlic. 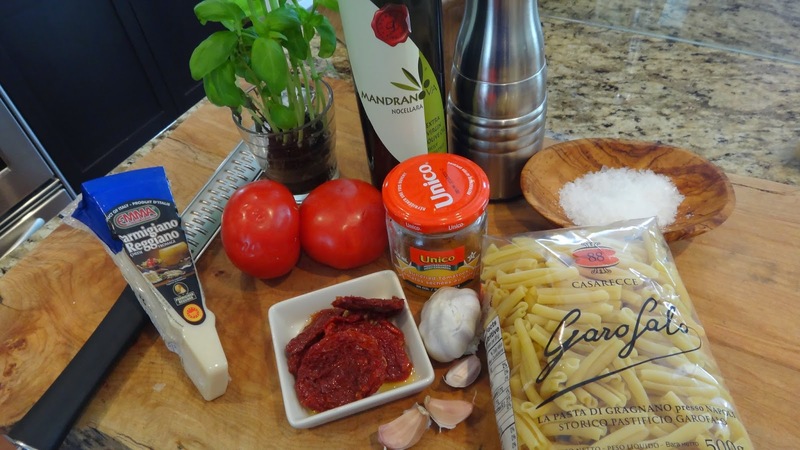 Have everything ready to go because your sauce will be done in the time it takes to cook the pasta. 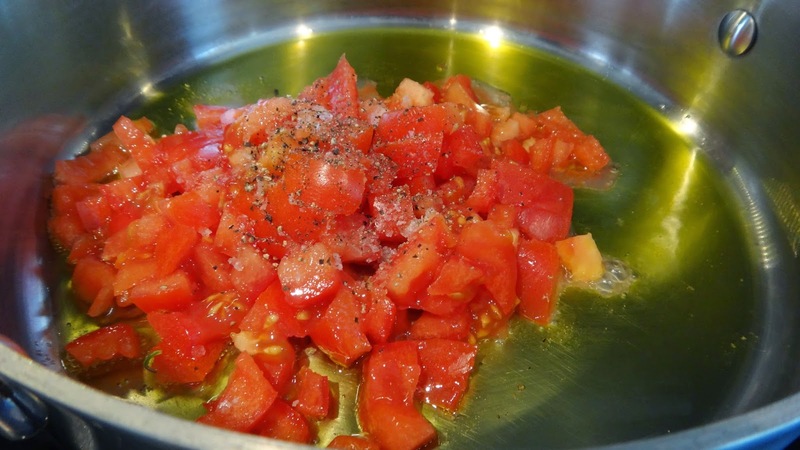 Step 4: in a large pan on medium heat add good quality extra virgin olive oil and tomatoes. 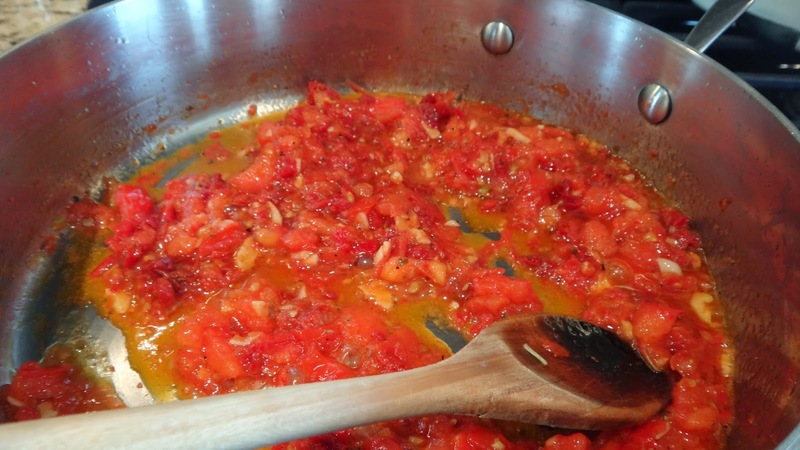 I want the tomatoes to sweat out their liquid which will mix with the olive oil to help create a gorgeous sauce. 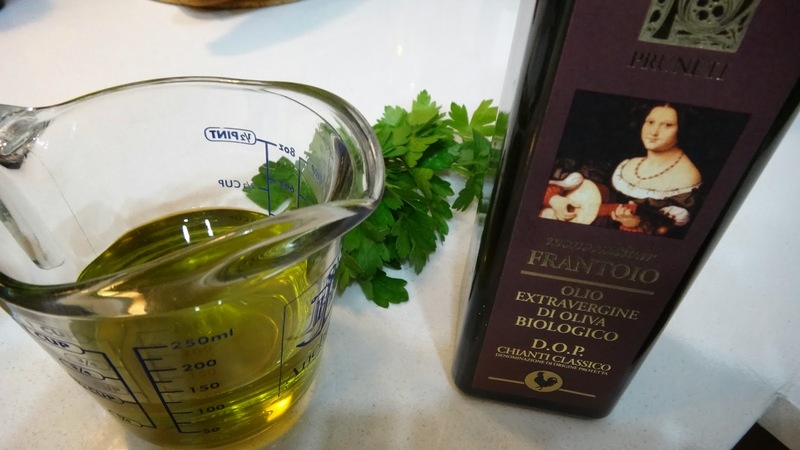 You may think this is allot of oil however, it is a glorious healthy fat that will create the most beautiful simple coating for your pasta. Add a generous sprinkle of sea salt and pepper. Cook for 2 minutes. 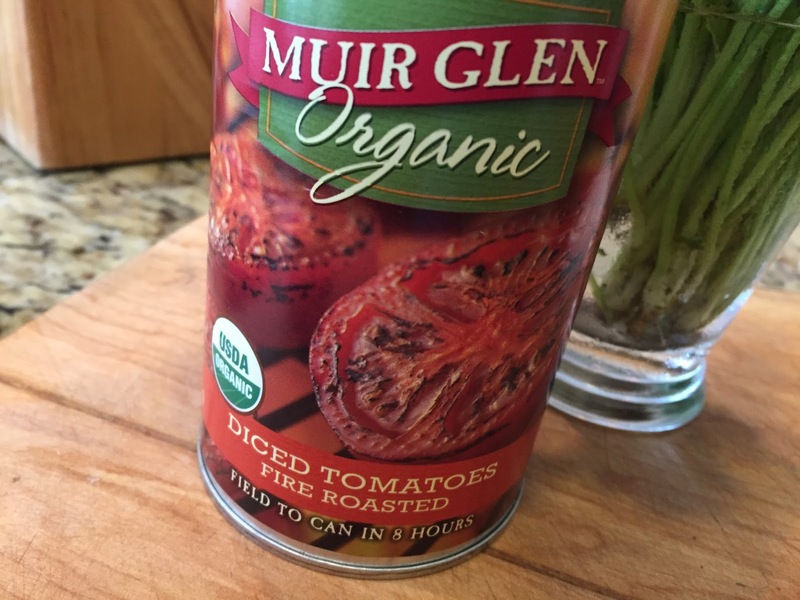 Tomatoes love salt don’t omit this. 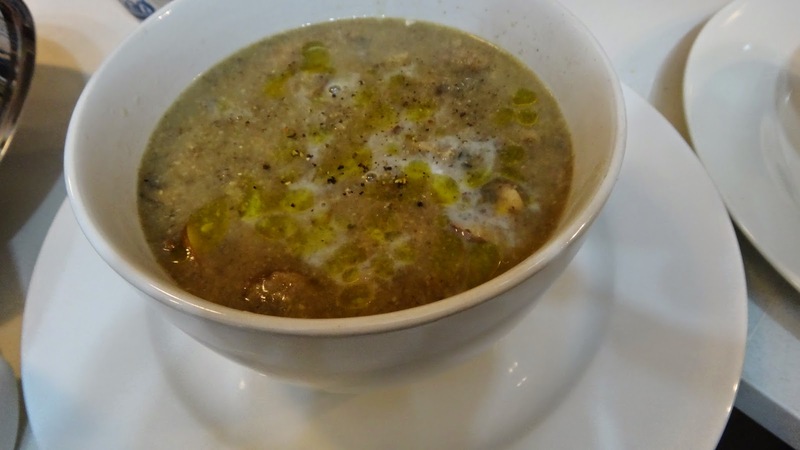 You can always start with some and add more at the end once you taste it if you feel unsure of your amounts. I never like to add measurements for salt and pepper because you need to add and taste to get accurate amounts. 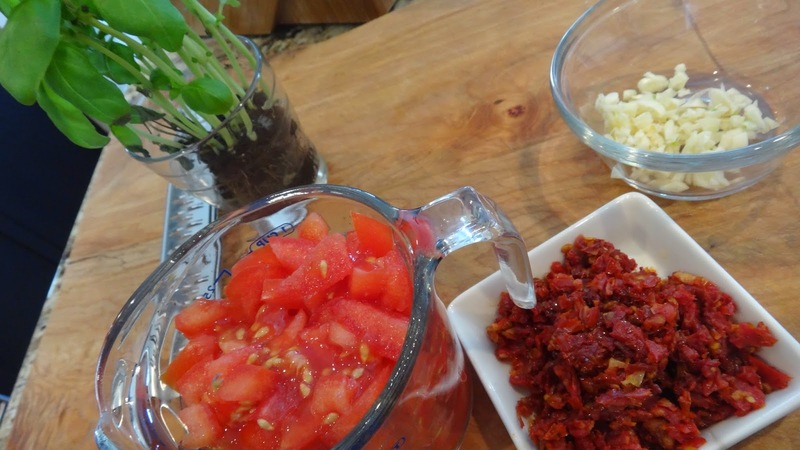 Step 5: add your chili flakes, your sun dried tomatoes, garlic and seasonings. Stir and cook on medium low for another 4-5 minutes. 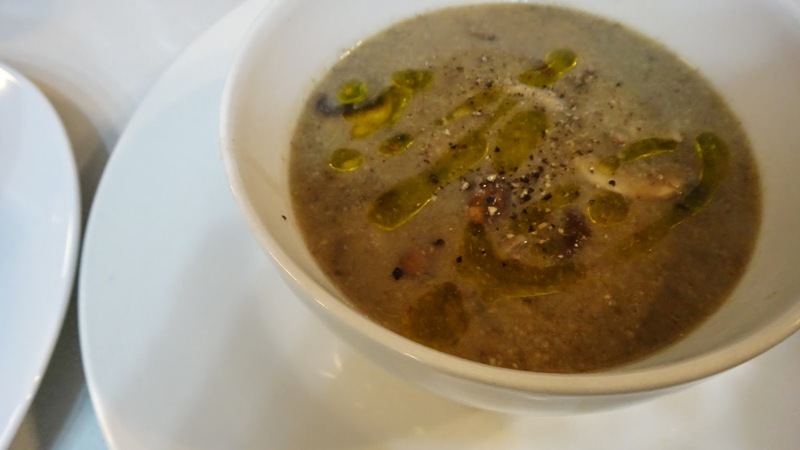 The oil gets beautifully infused with the other components and slowly thickens slightly. 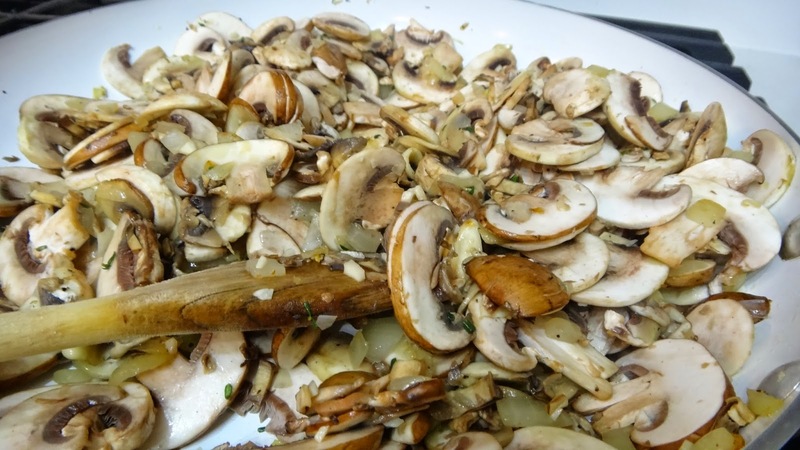 Taste it and adjust seasonings as you like. 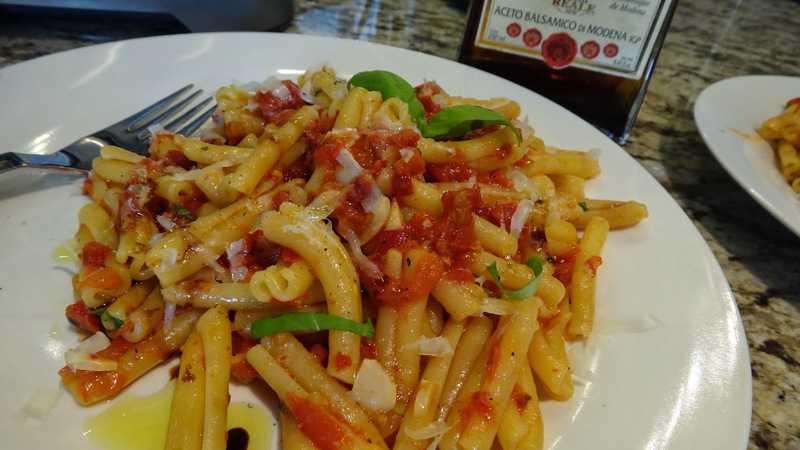 It is not allot of sauce however, it is just enough to coat the pasta and Italians do not typically over sauce their pasta like North Americans do. Try it! Step 6: add your pasta to the sauce and always keep some pasta water. 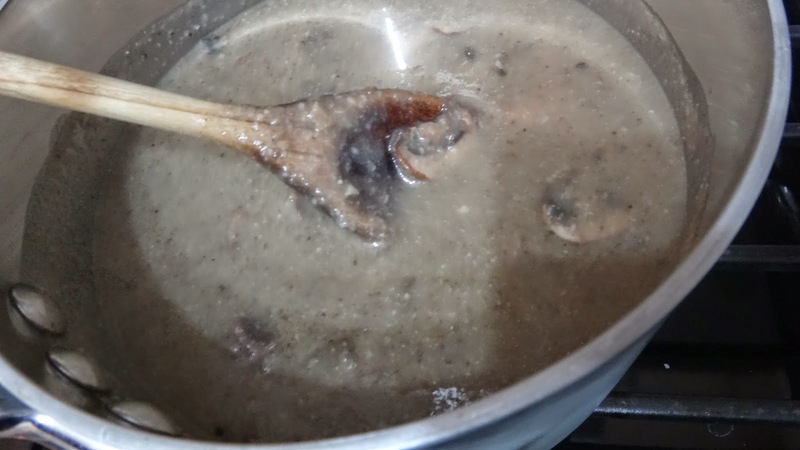 The starchy liquid always helps to thicken the sauce and helps to create a glossy coating. I have used maybe a 1/4 cup of the pasta water in my preparations here. Toss and cook another 2 minutes. This is why you never over cook the pasta because it will continue to cook in the sauce. 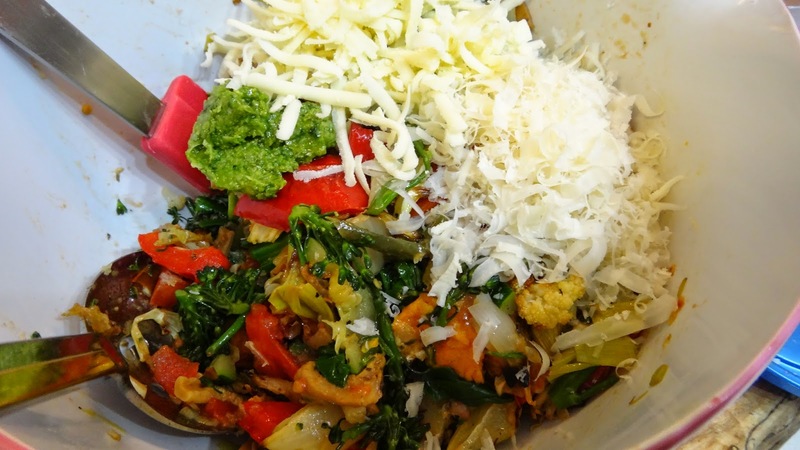 Toss in your chopped basil and half of your grated cheese, taste it. Add more salt and pepper if necessary. Mix and serve. On the plate I add the additional cheese and a drizzle more of fresh olive oil for another layer of taste and if you like a drizzle of aged balsamic vinegar. 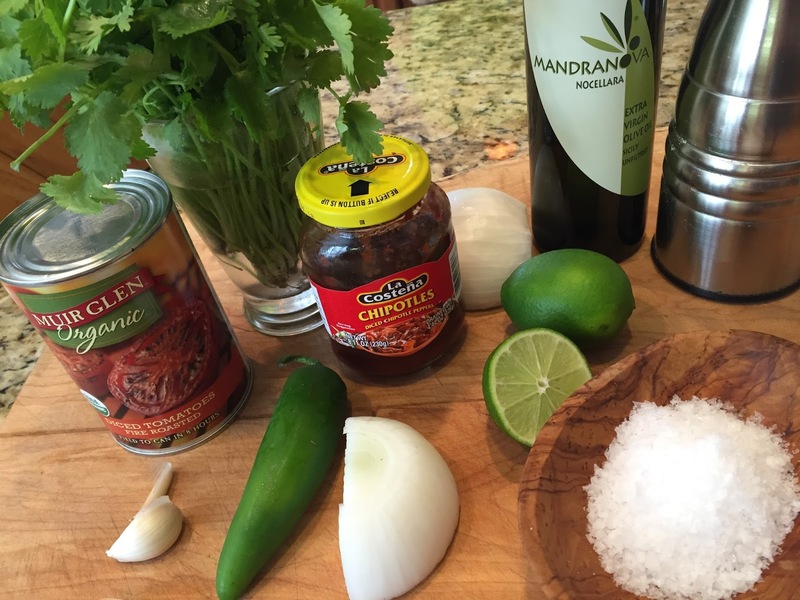 It is simple, sweet, a bit spicy from the chili flakes and perfectly balanced and delicious. I love a great plate of pasta and tomatoes, basil, cheese, garlic and good olive oil is once of the best.